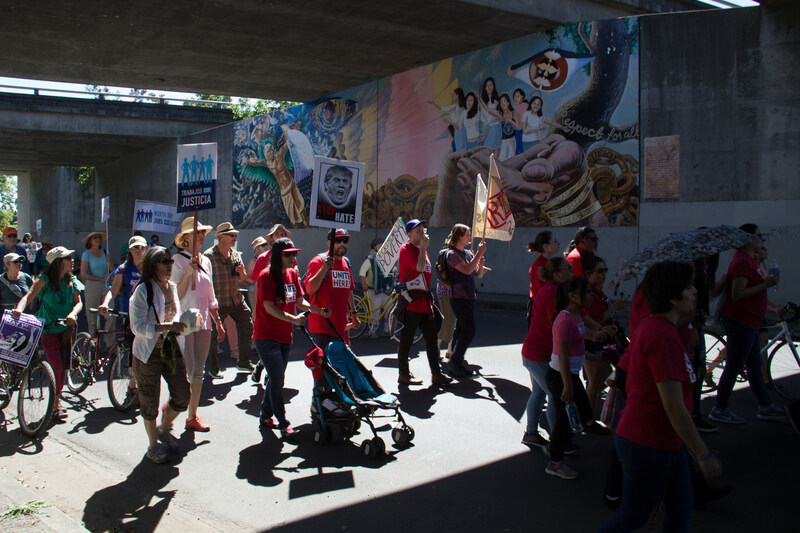 Organized by School of the Americas Watch (SOA Watch), thousands from north and south of the border wall, were brought together to take a hard look at the massive human costs of border militarization and US immigration policies… and to protest the long and current history of US intervention in the affairs of Latin America. 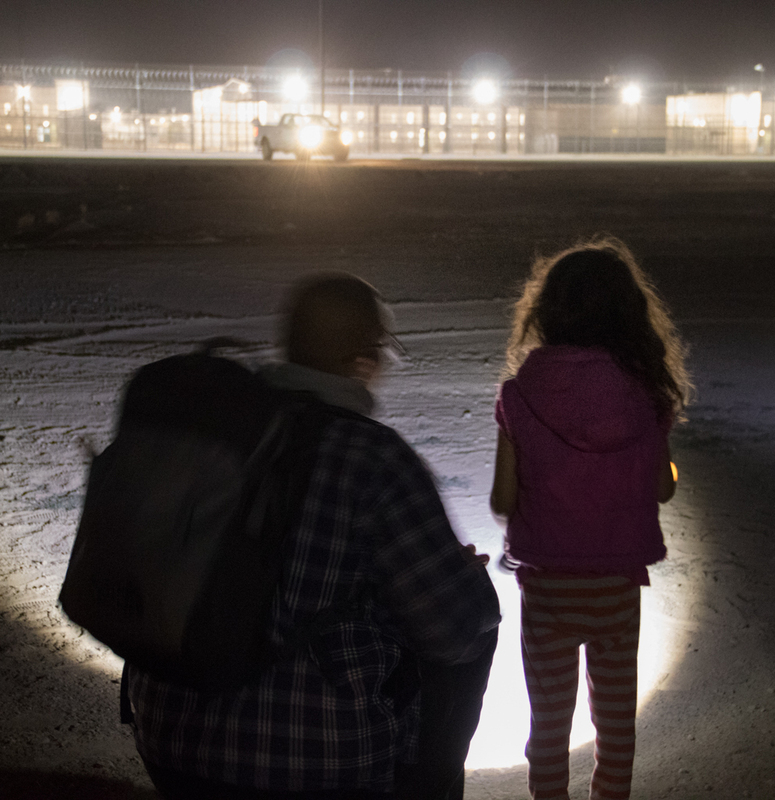 Vigil outside Eloy Detention Center, Eloy, Arizona. 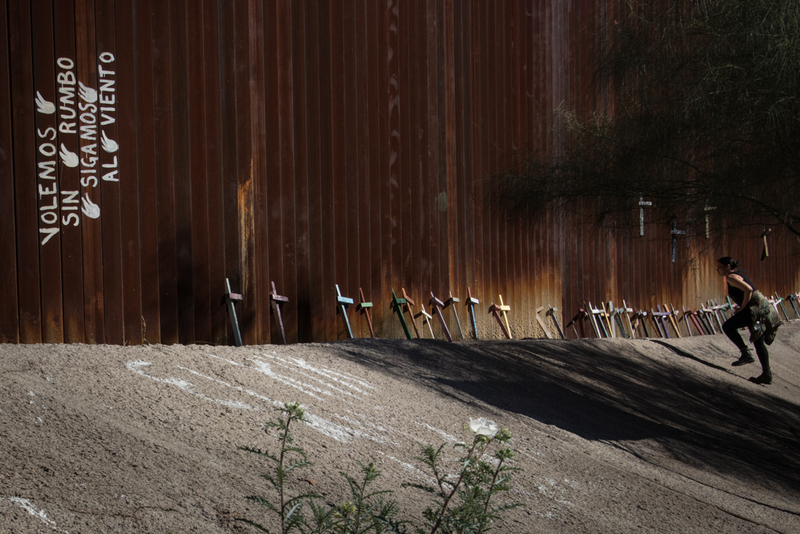 The US District Court in Tucson is one of 7 courts along the border where Operation Streamline operates. 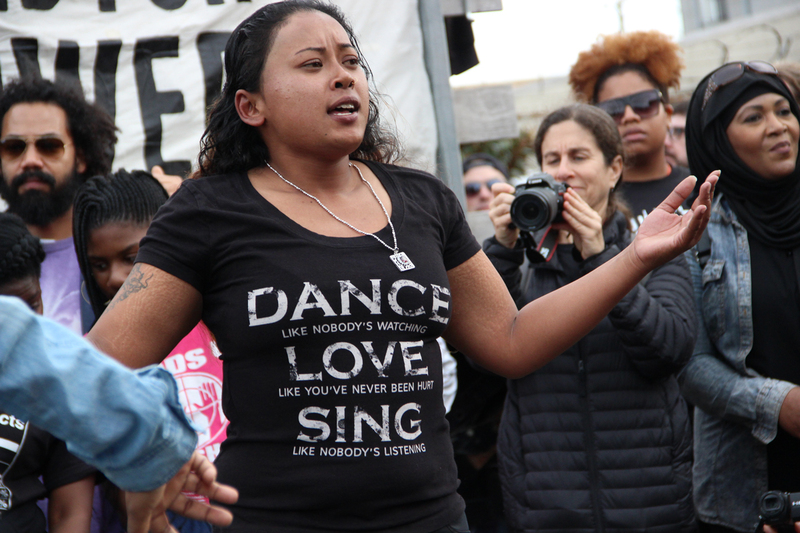 The court proceeding convicts up to 70 people of “illegal re-entry after deportation” in a group hearing that lasts under 2 hours. 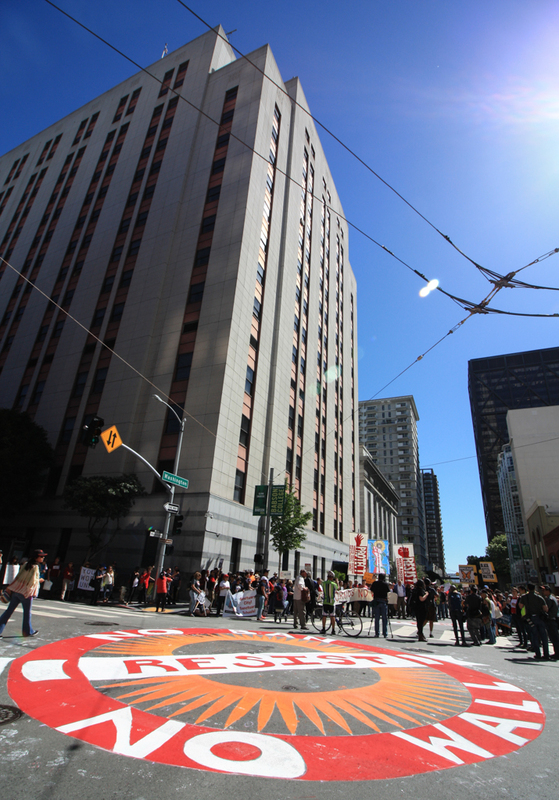 The court appointed lawyers have 20-30 minutes to get to know their clients. 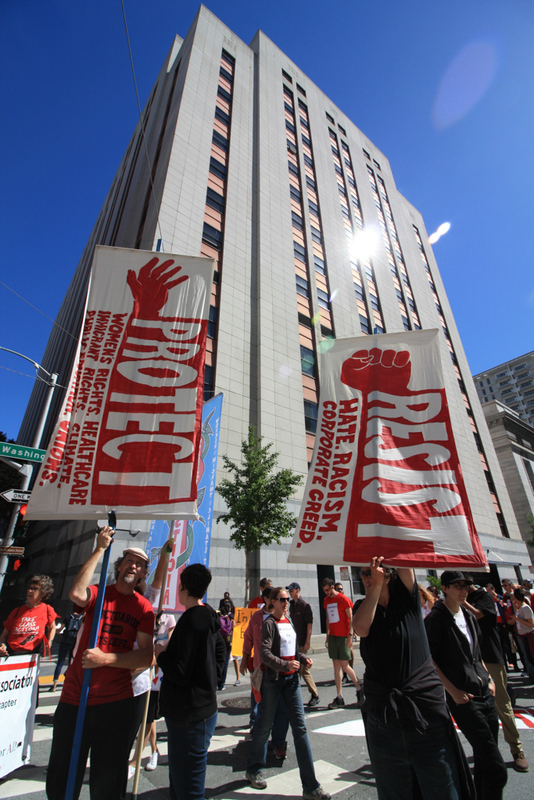 All those convicted serve at least 1-6 months in private prisons. 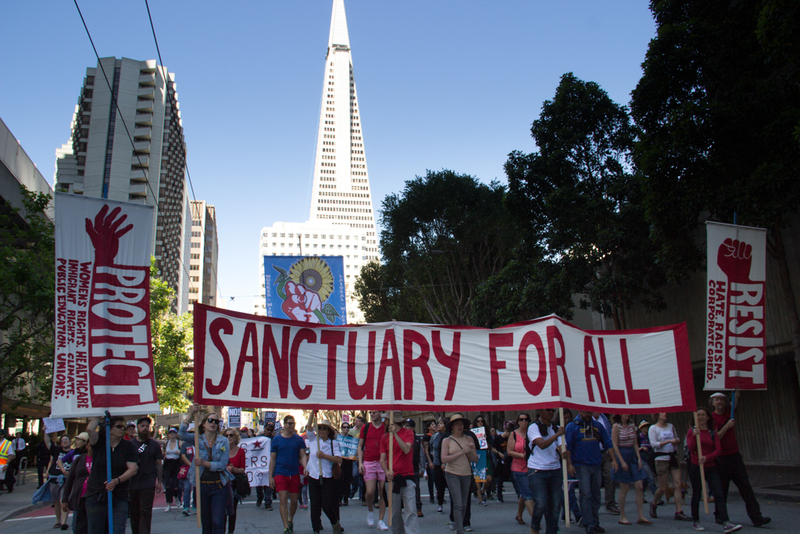 The private prisons receive millions of taxpayer dollars for incarcerating immigrants. 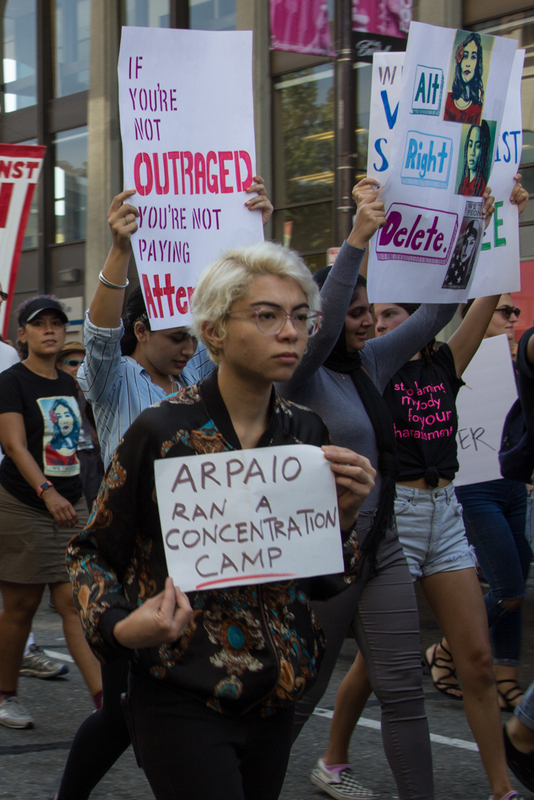 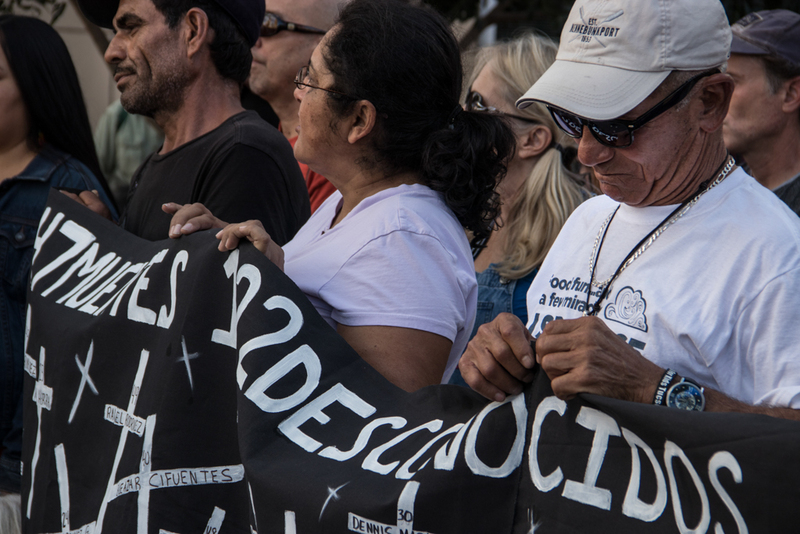 The Eloy Detention Center, located an hour north of Tucson in the Sonora Desert, is one of many private prisons in the US, used to incarcerate immigrants. 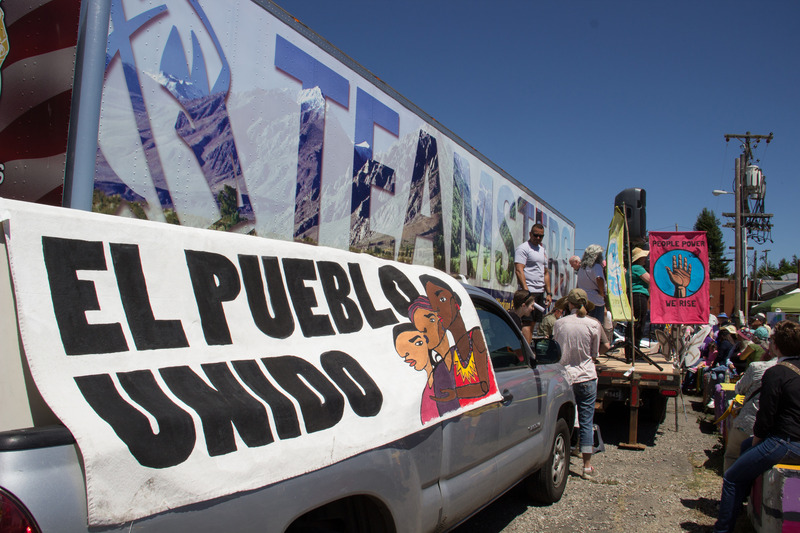 Like other private prisons, Eloy serves to profit off of laws that fill its beds. 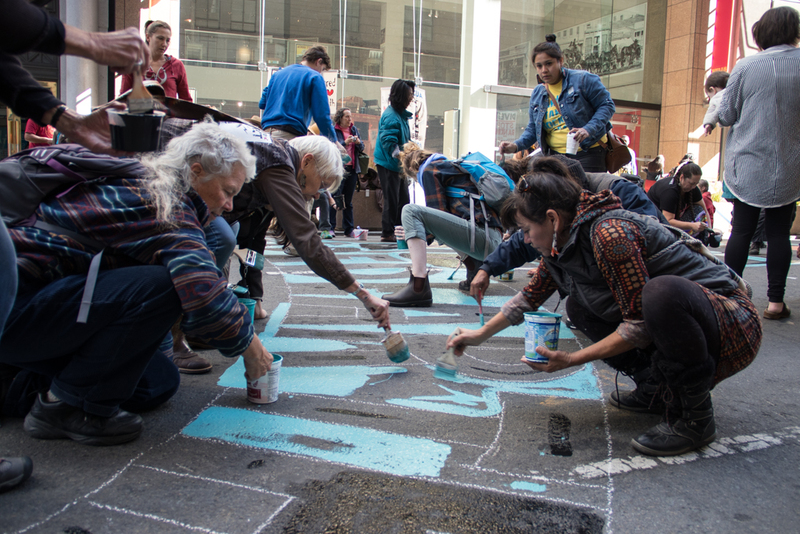 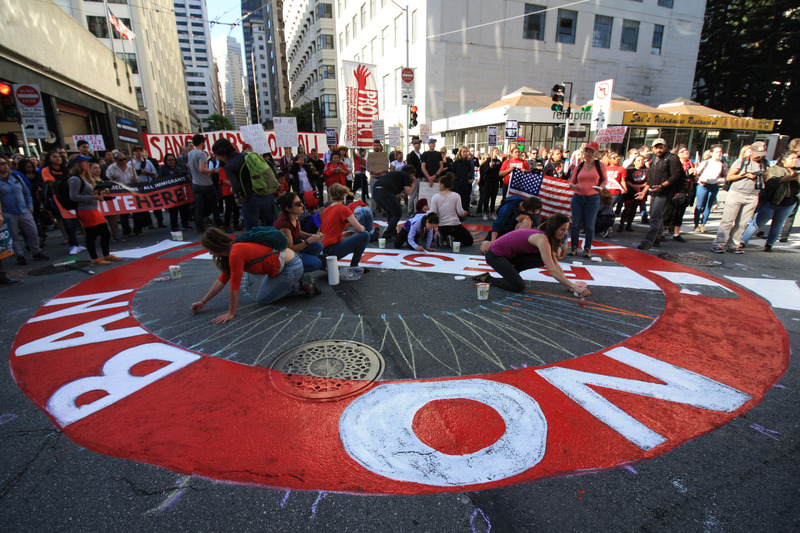 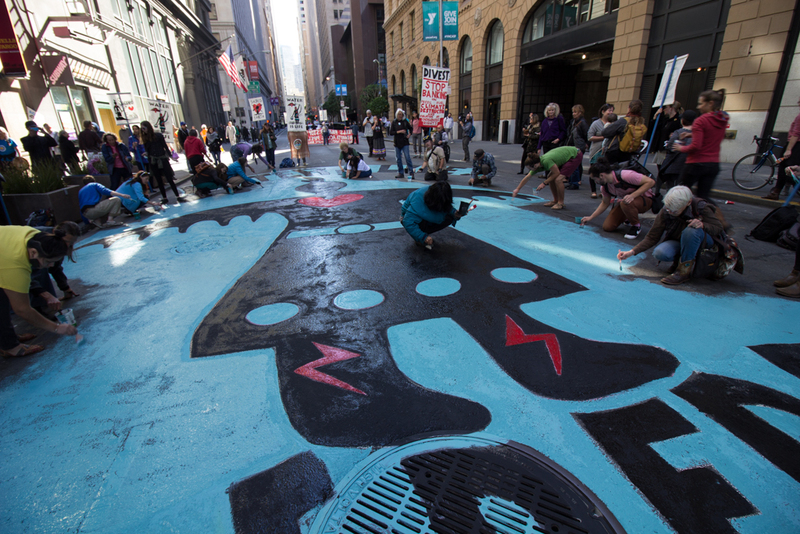 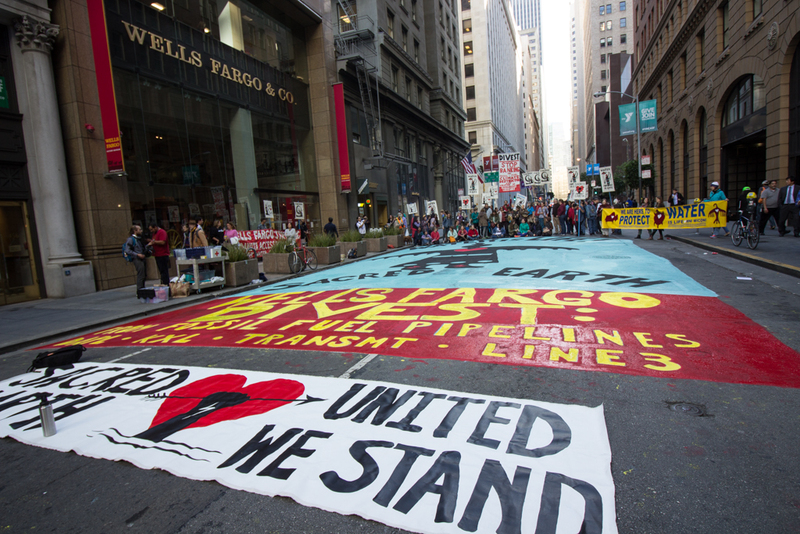 Guerrilla street painting outside Wells Fargo World Headquarters in San Francisco. 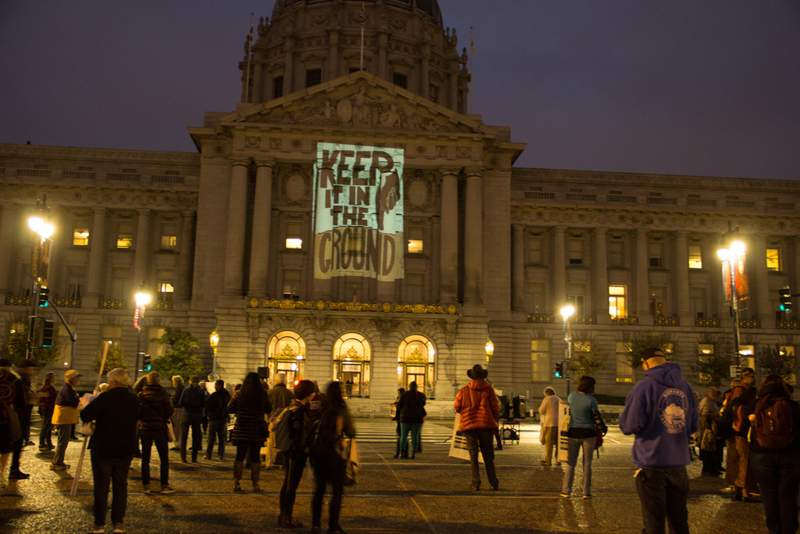 No funding for fossil fuel pipelines and projects! 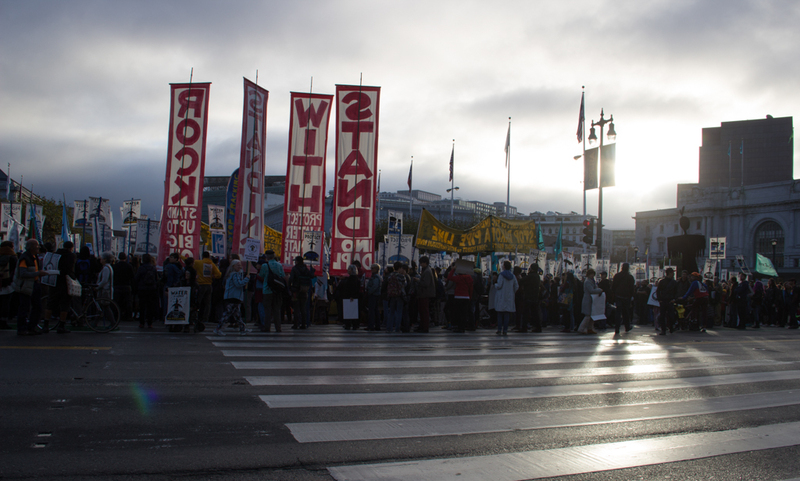 Action organized by Idle No More SF Bay and allies. 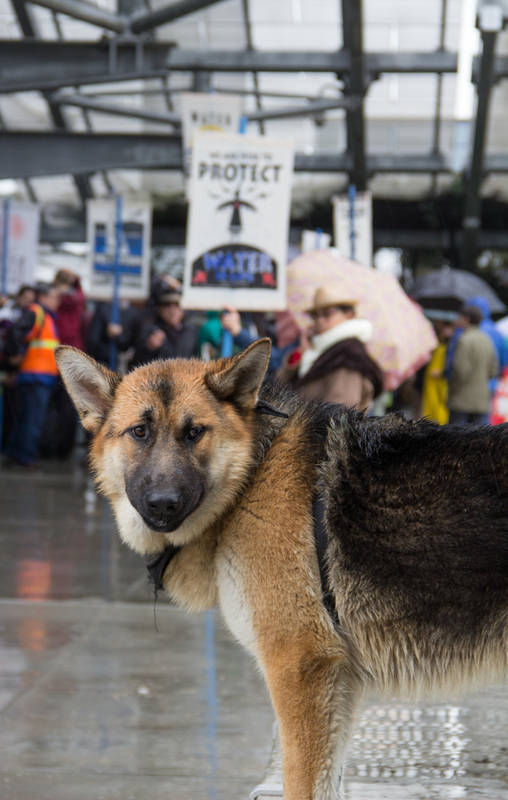 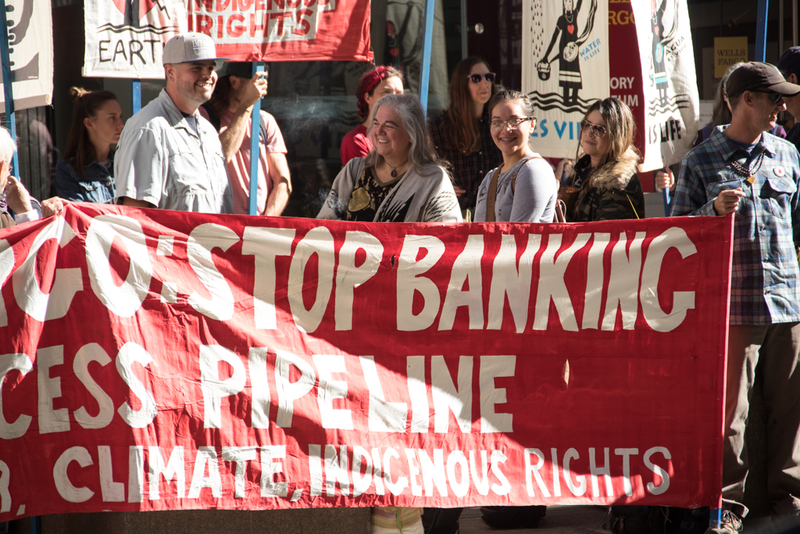 No DAPL – KXL – Trans Mountain Pipeline – Line 3. 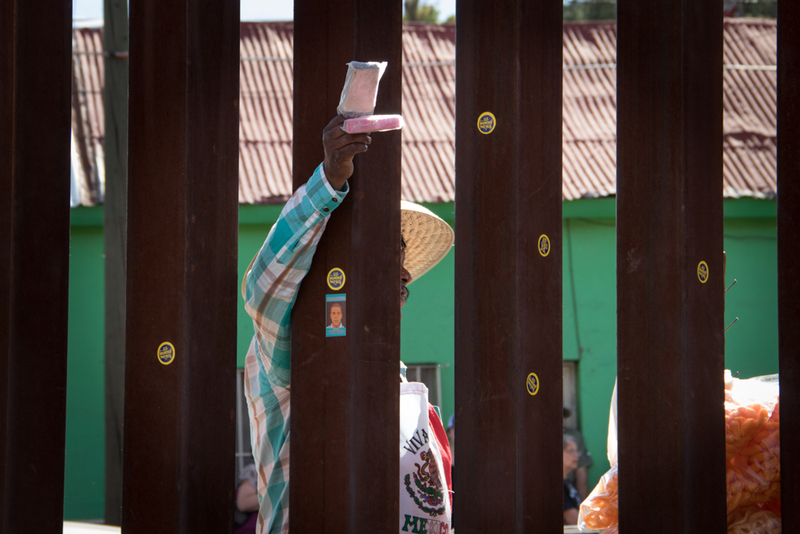 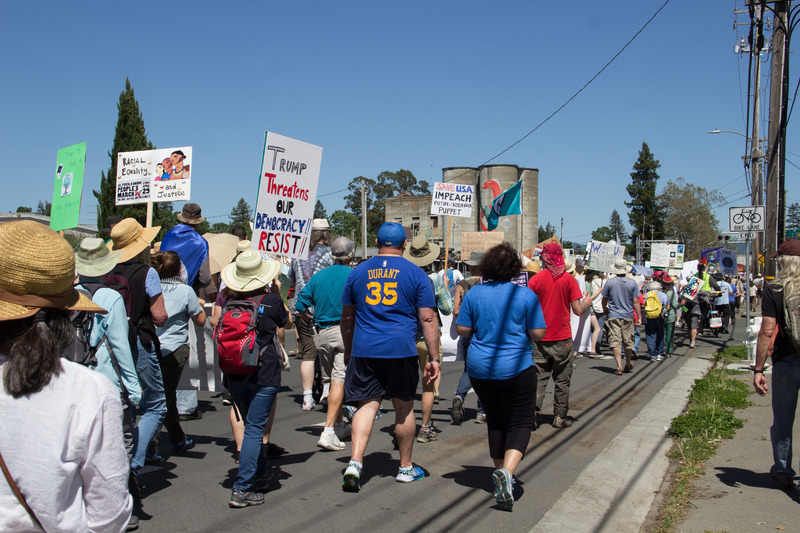 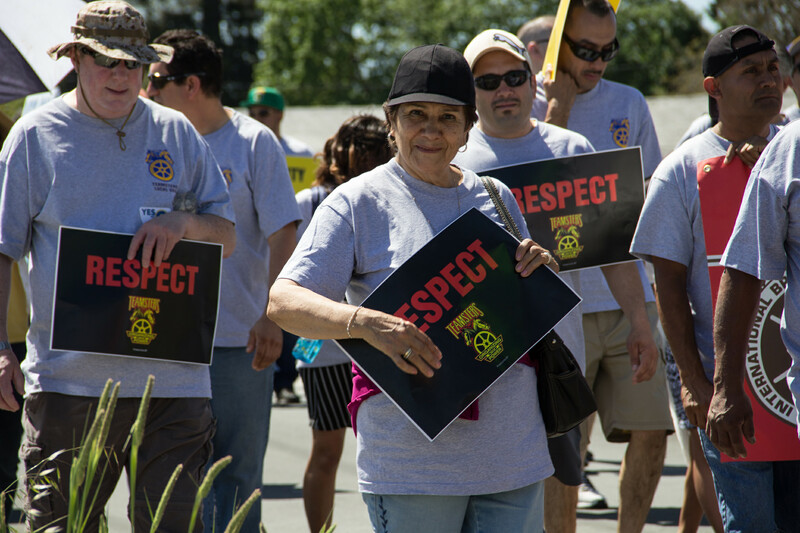 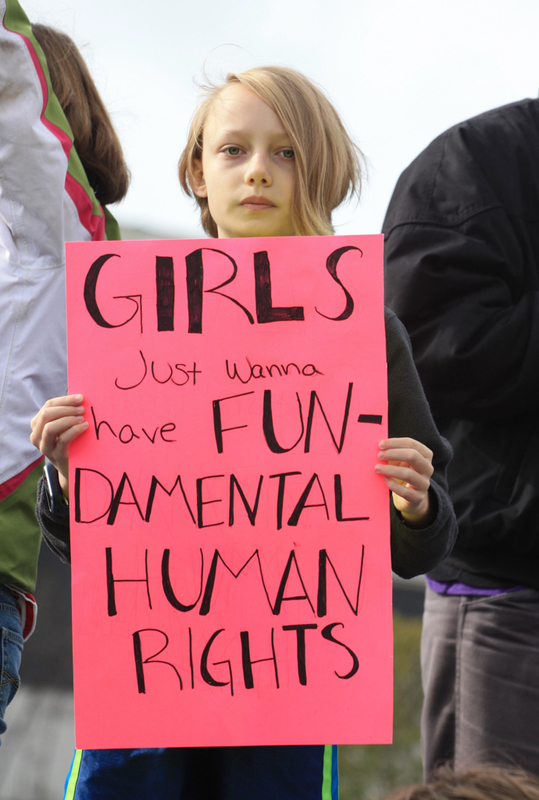 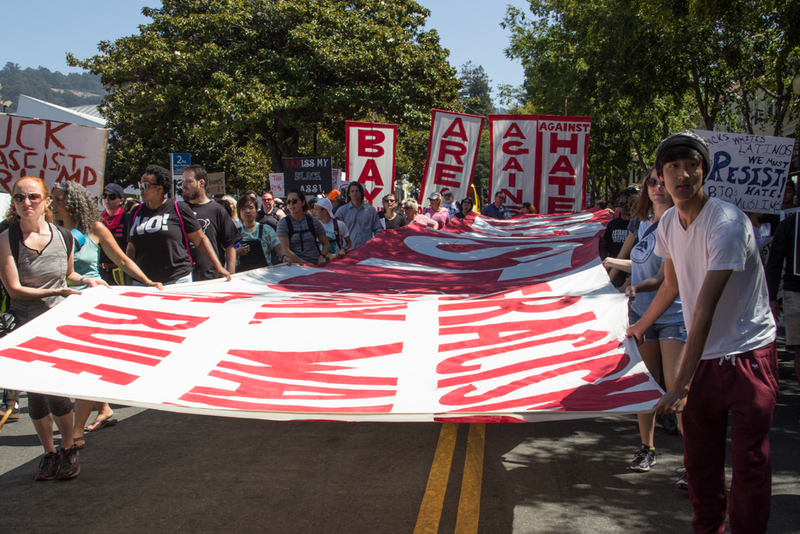 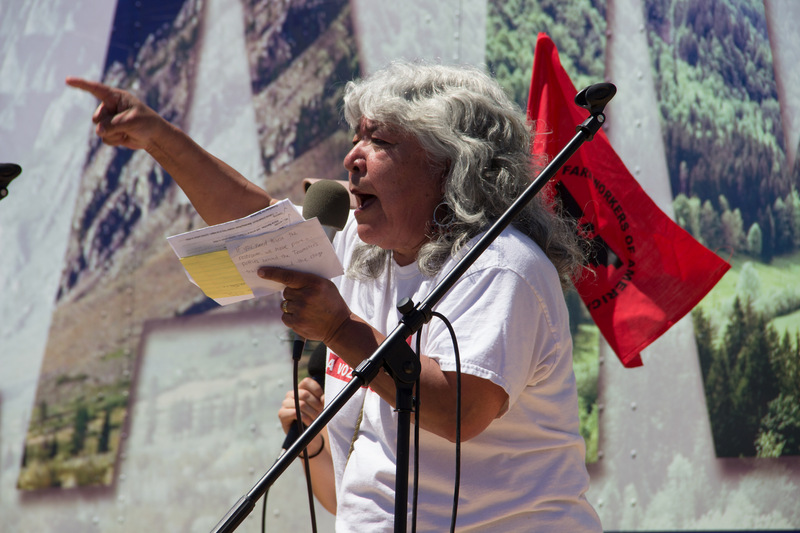 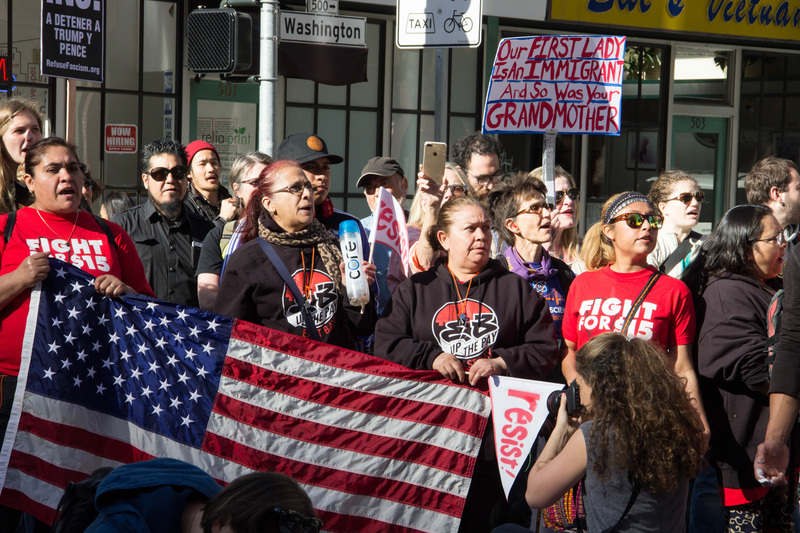 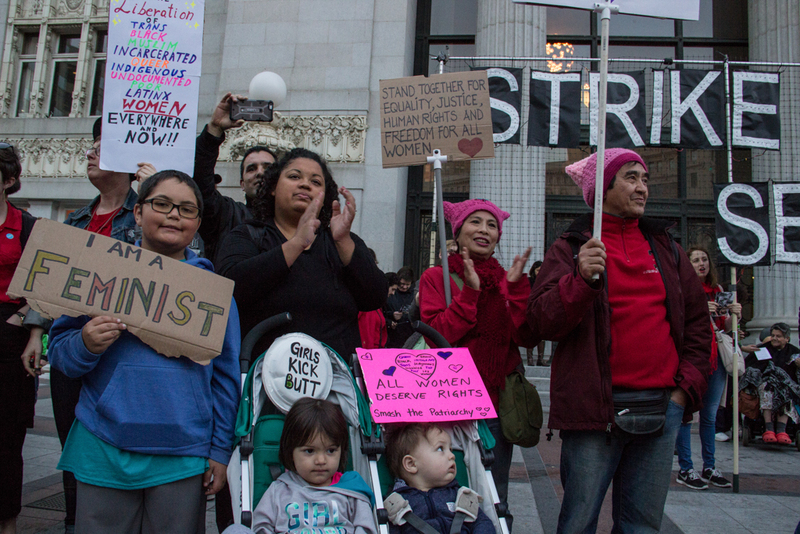 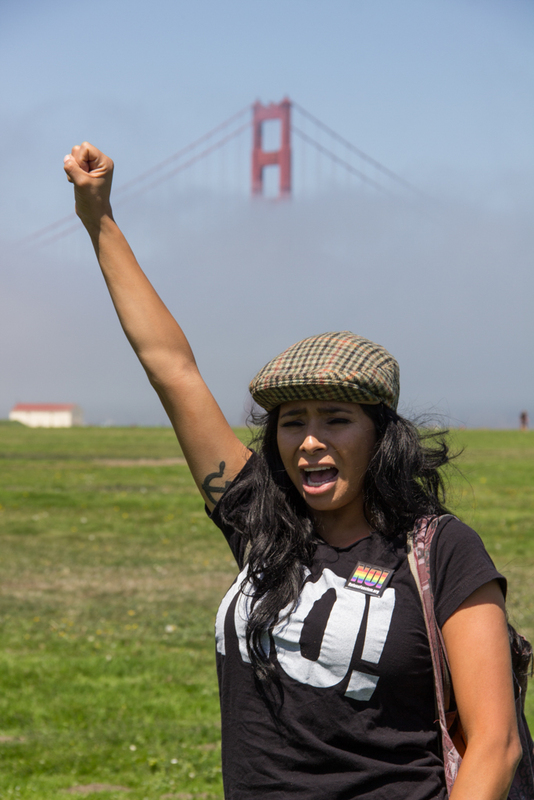 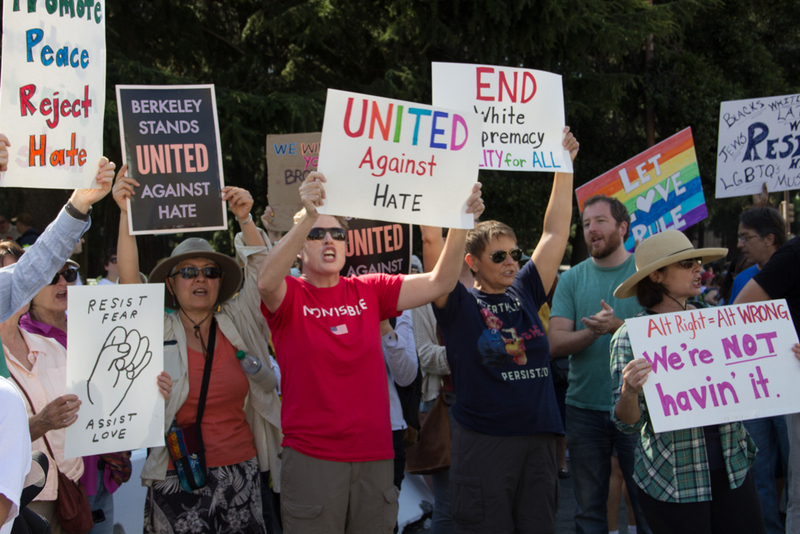 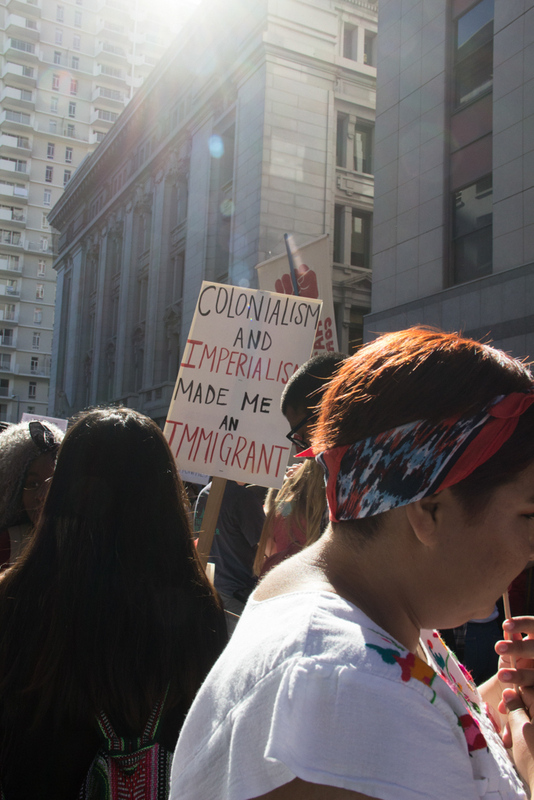 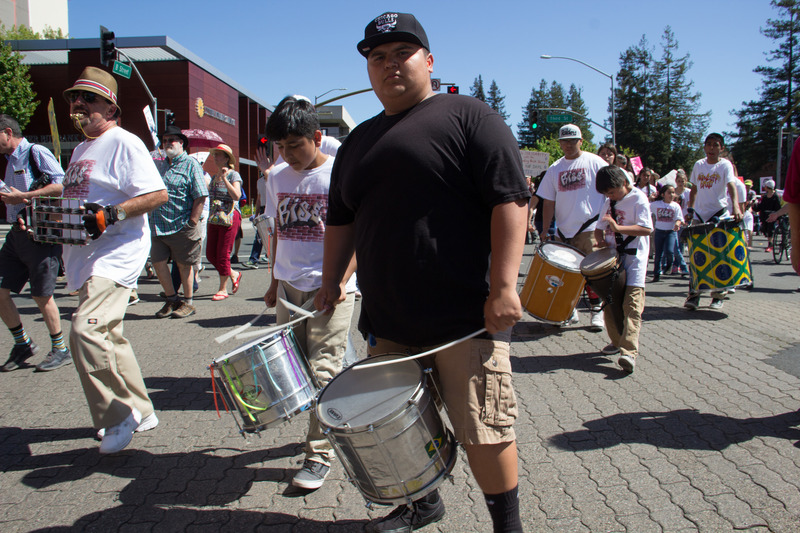 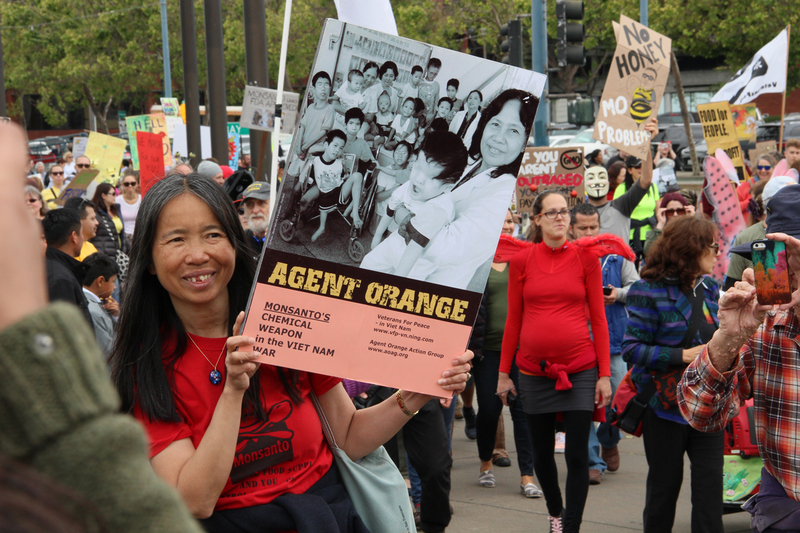 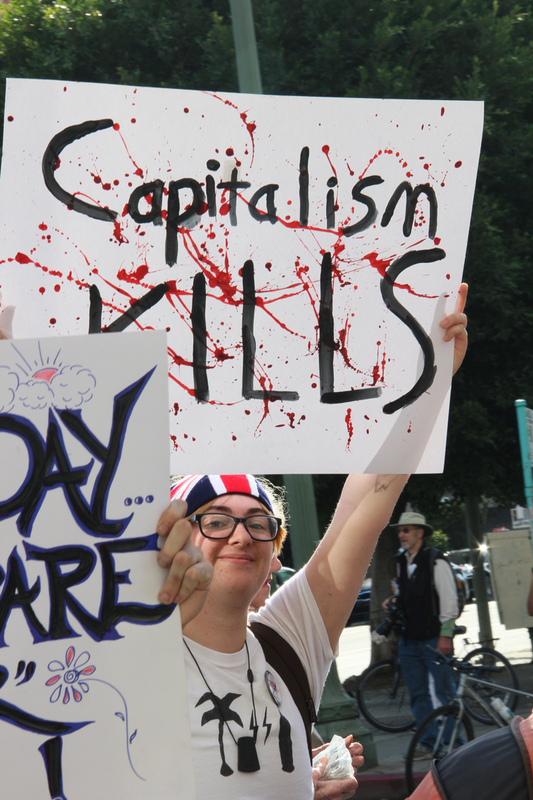 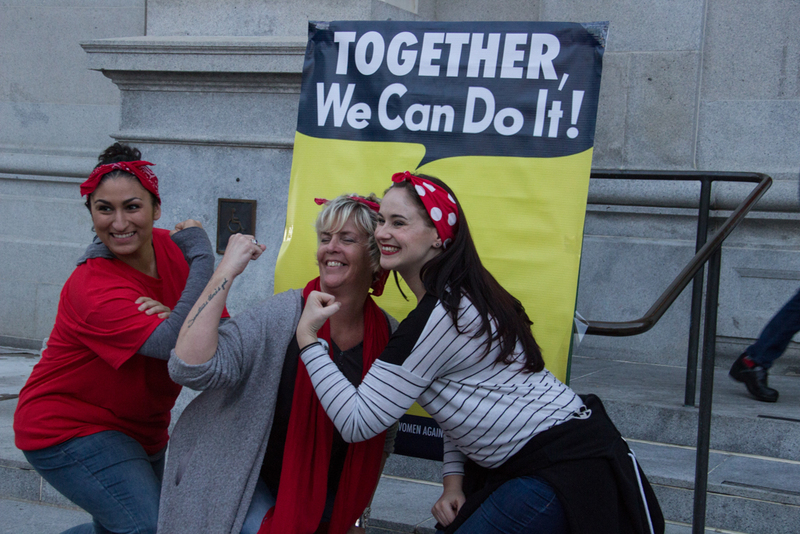 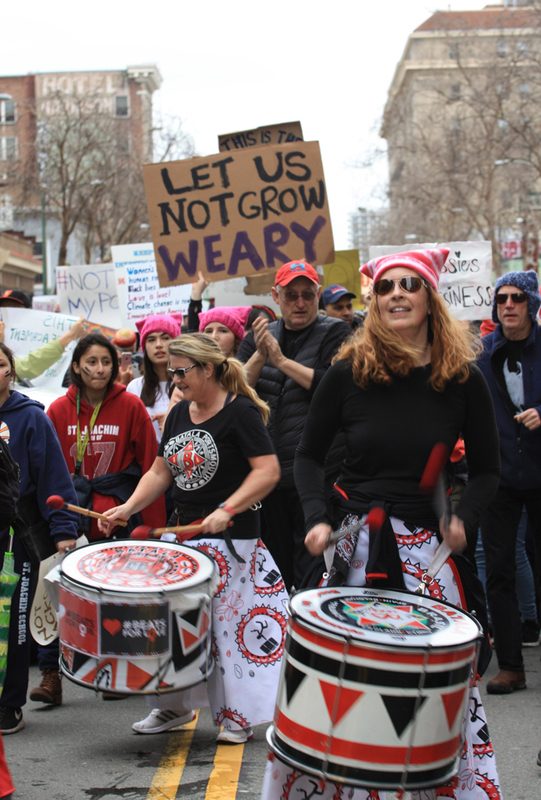 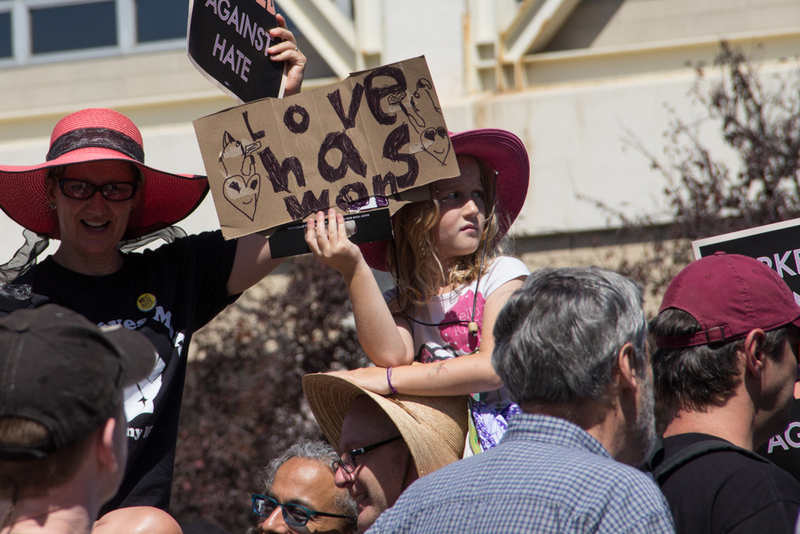 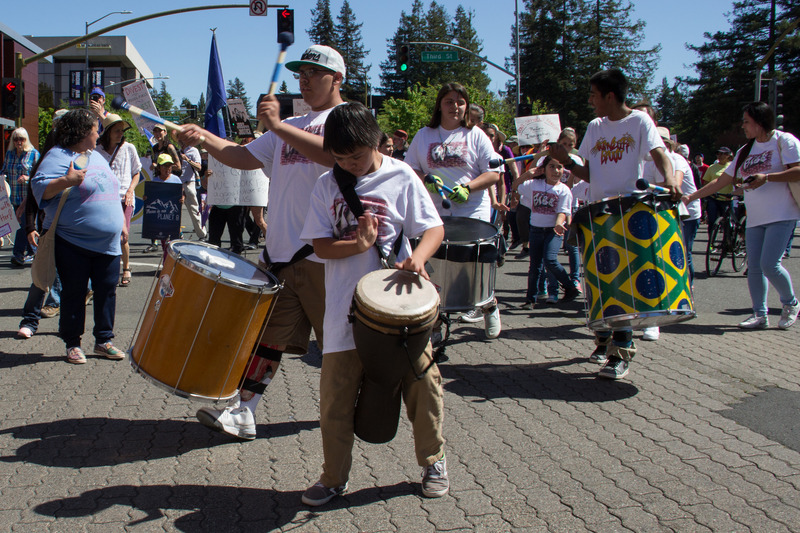 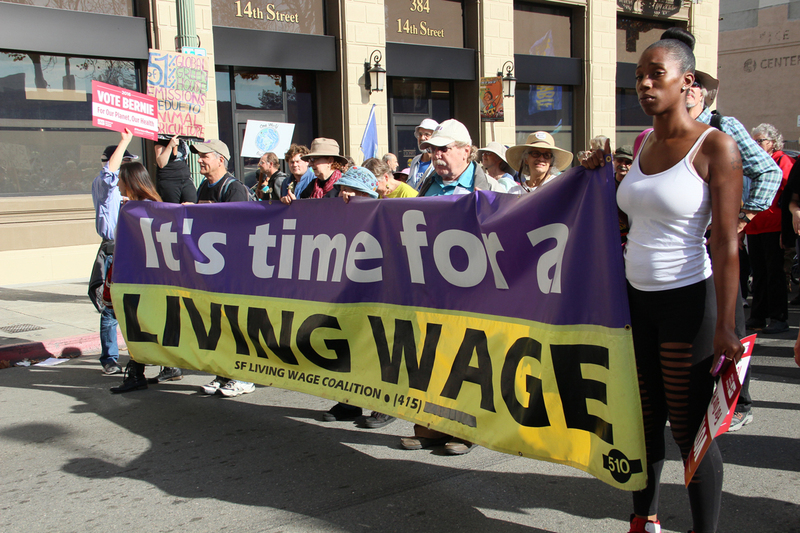 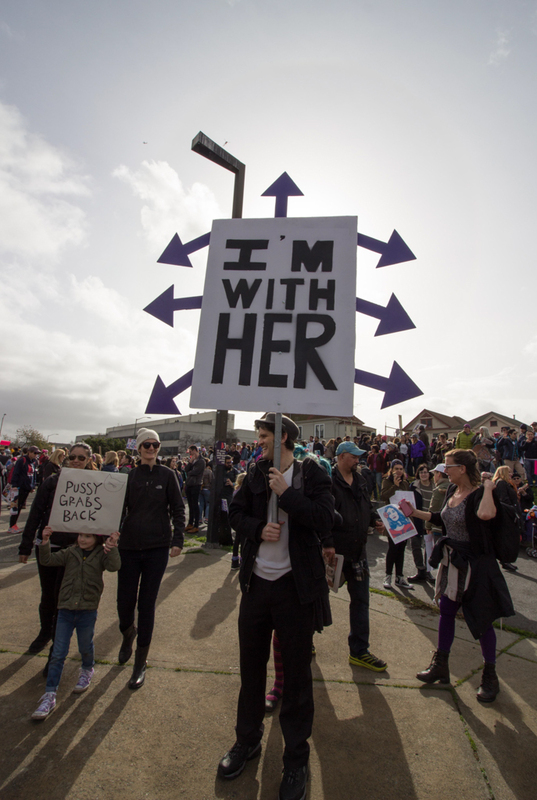 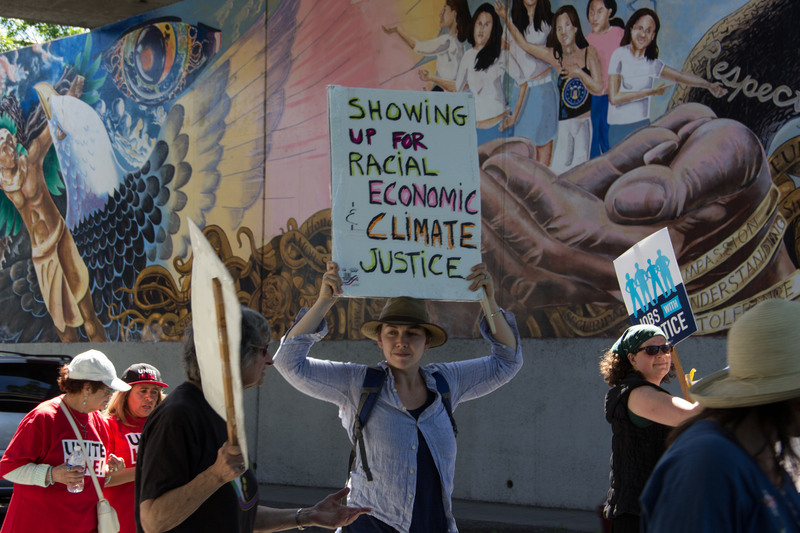 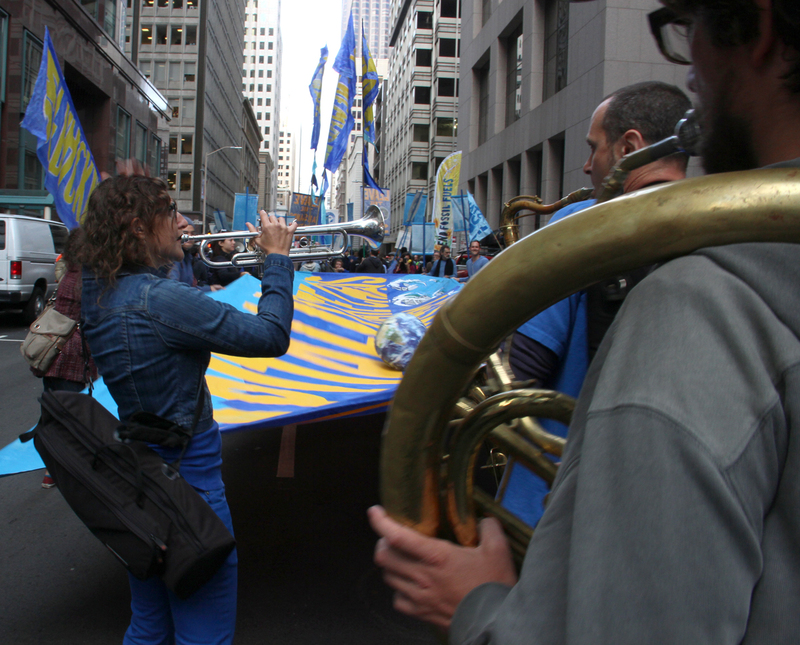 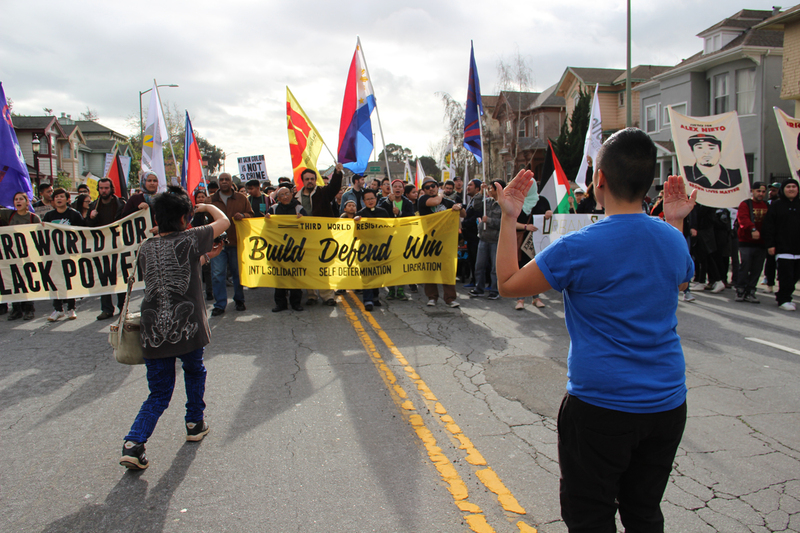 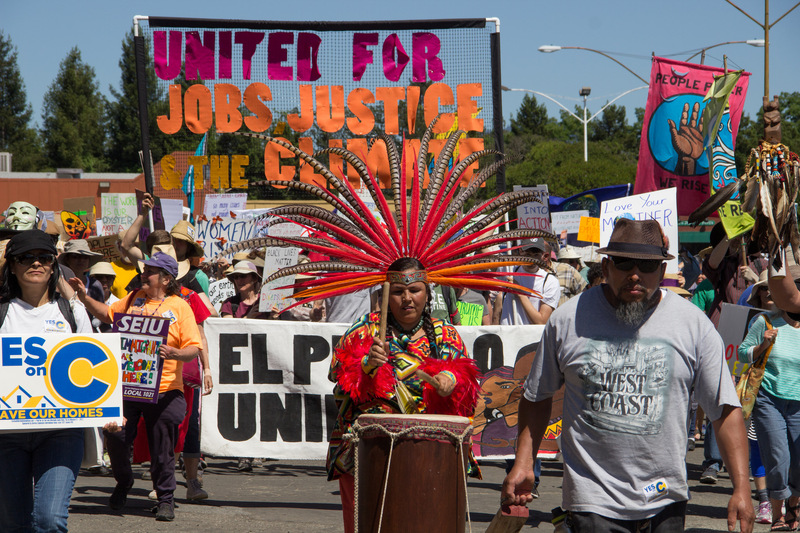 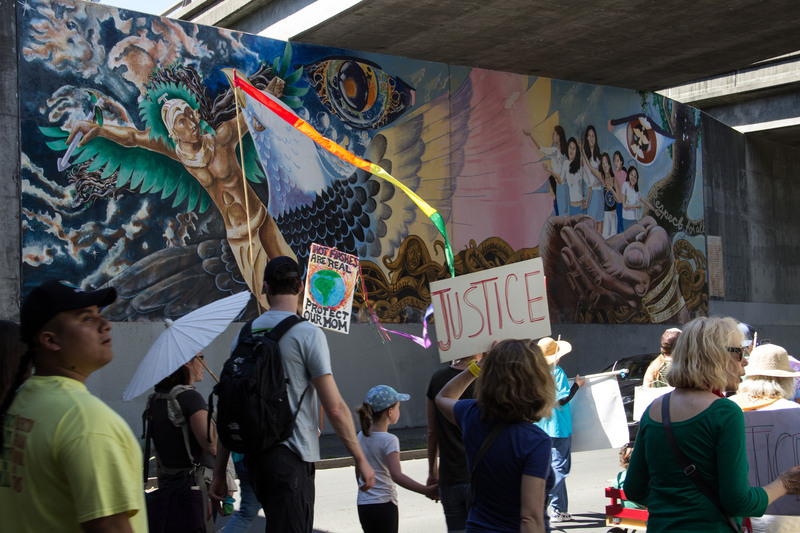 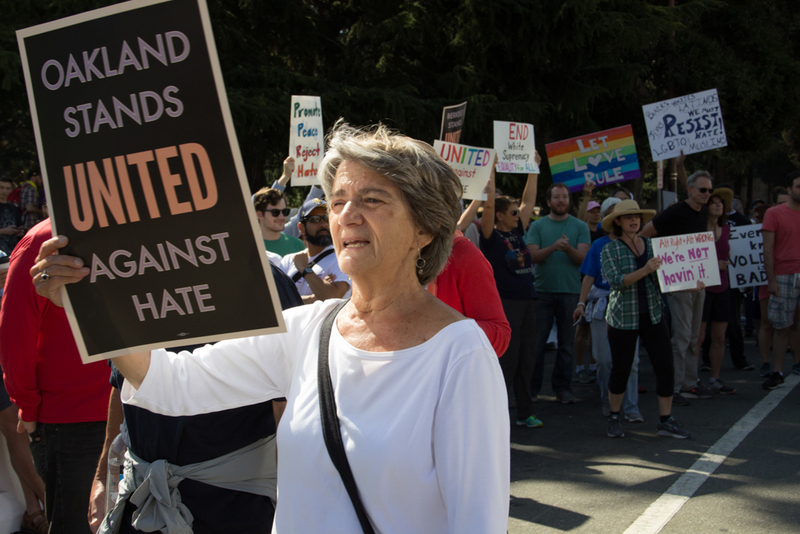 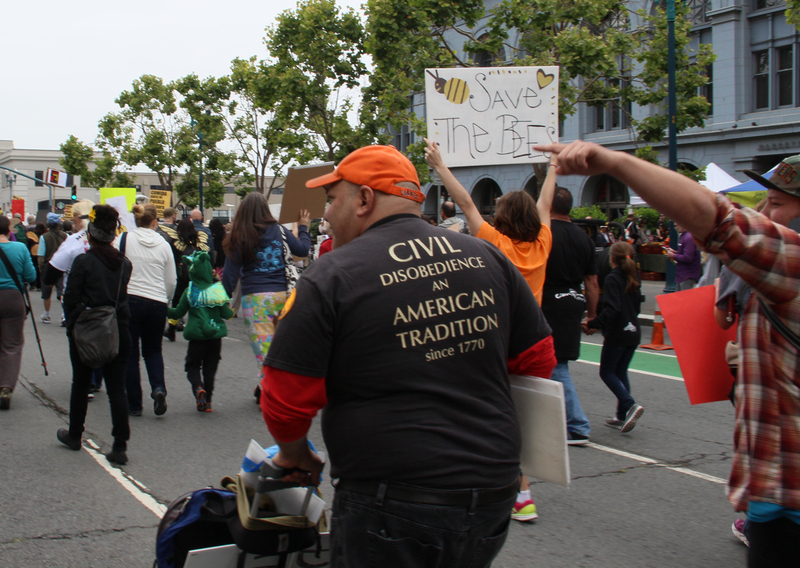 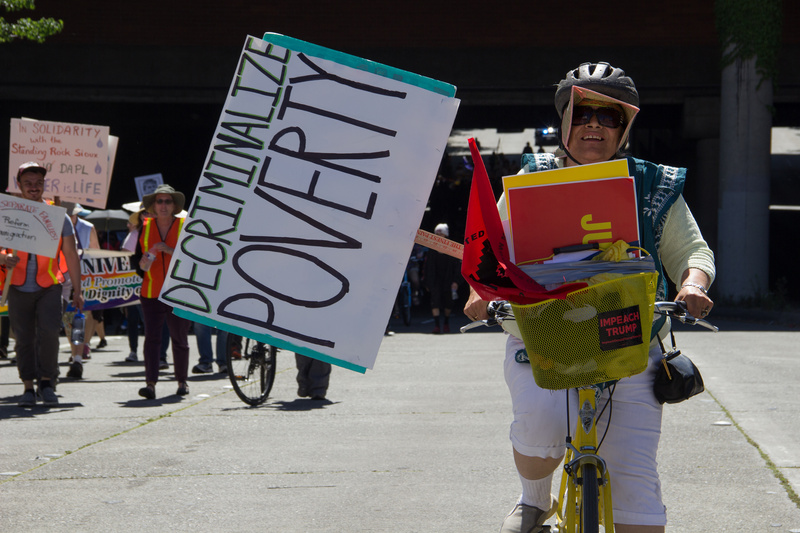 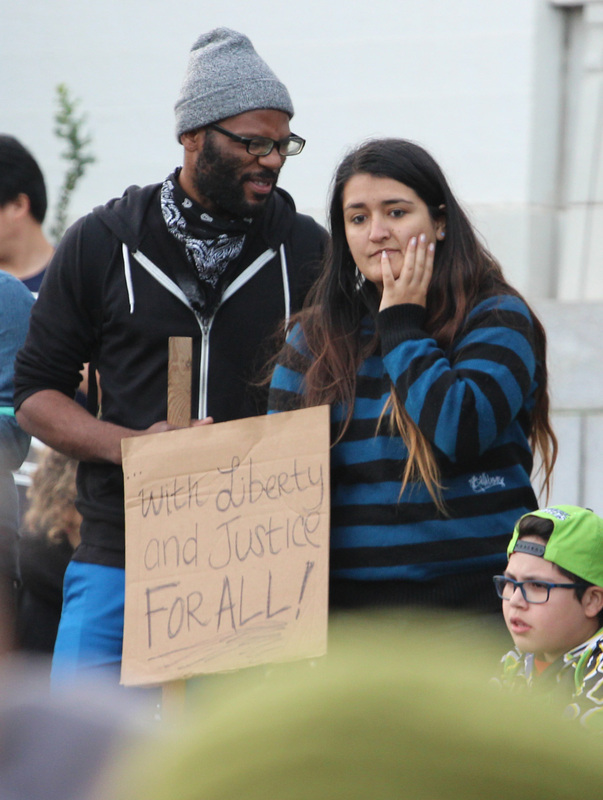 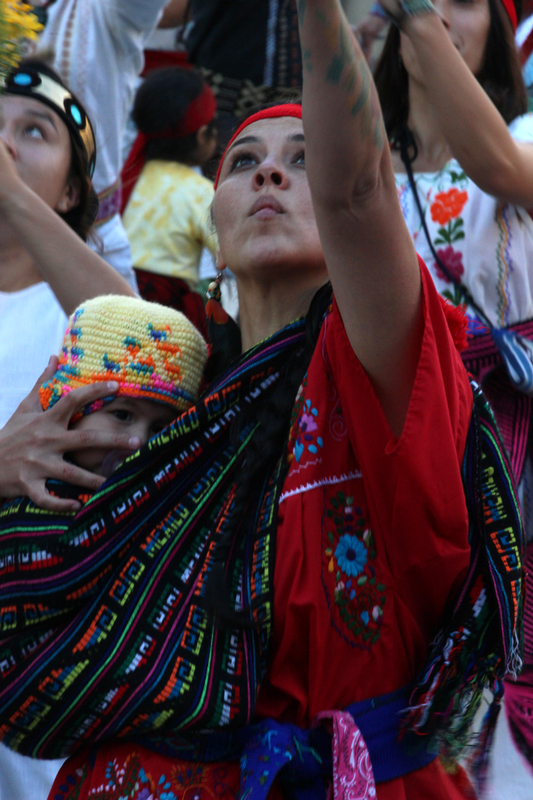 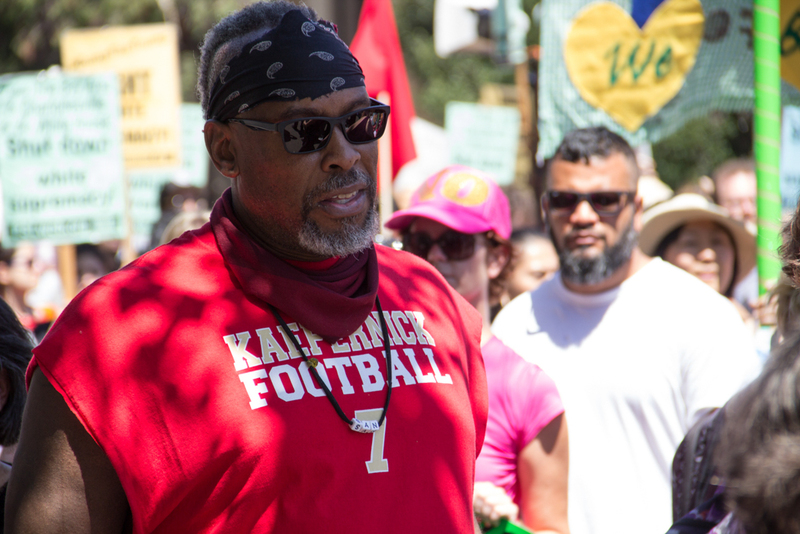 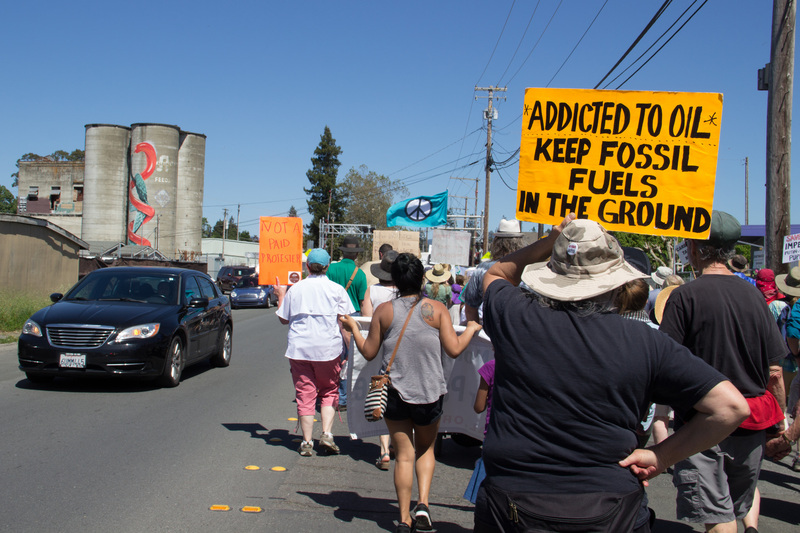 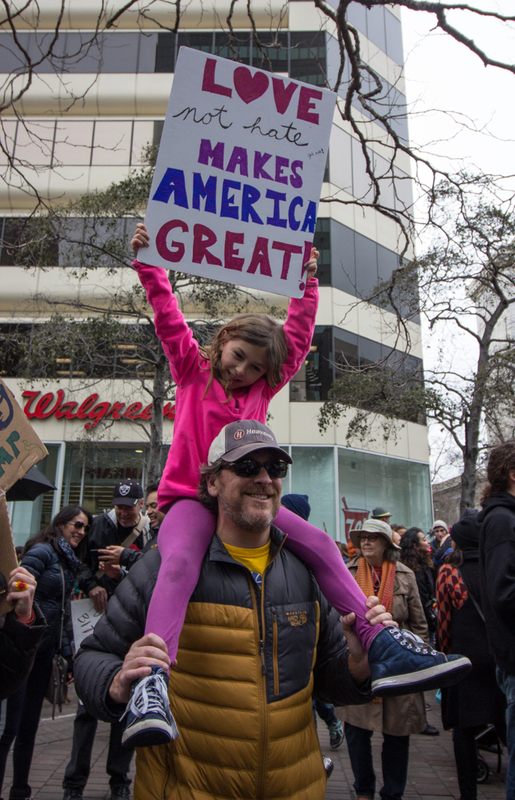 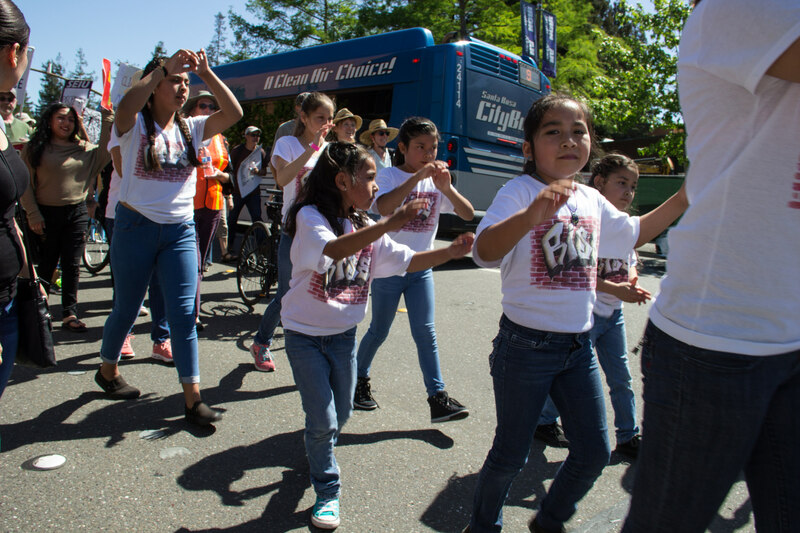 “… a merging of the traditional Sonoma County May Day march for workers’ and immigrants’ rights and a sister March for Climate, Jobs, and Justice in Washington, D.C. 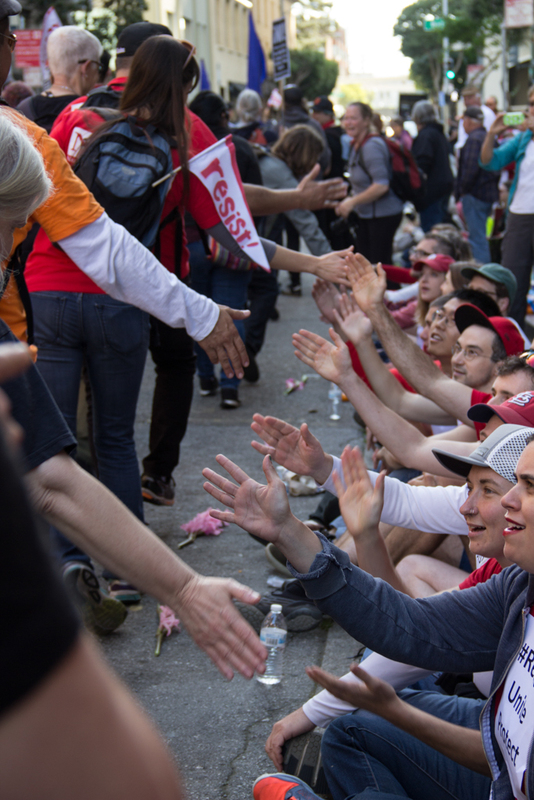 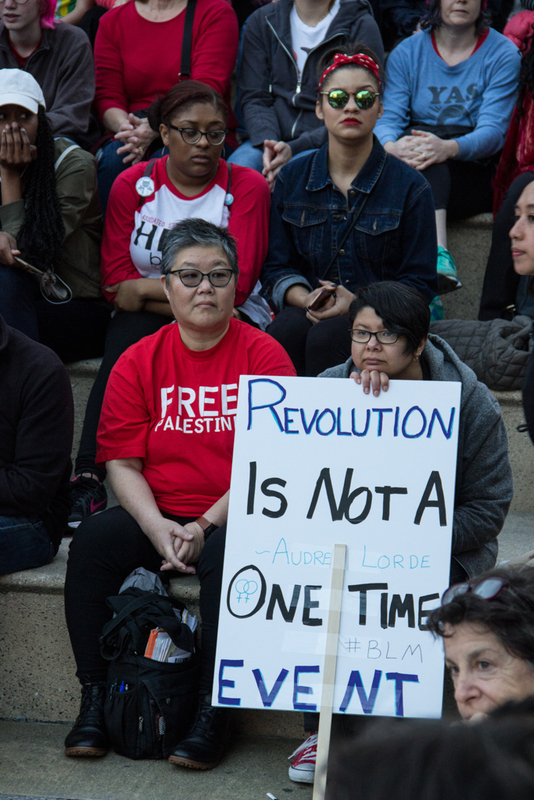 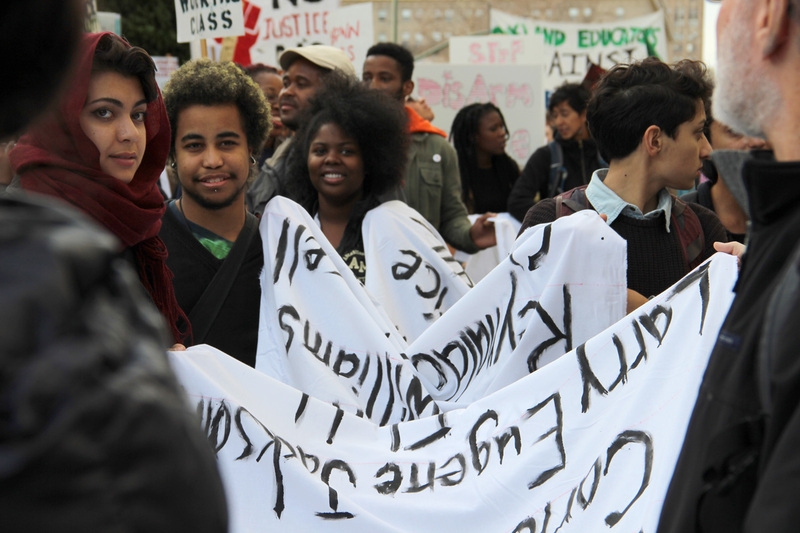 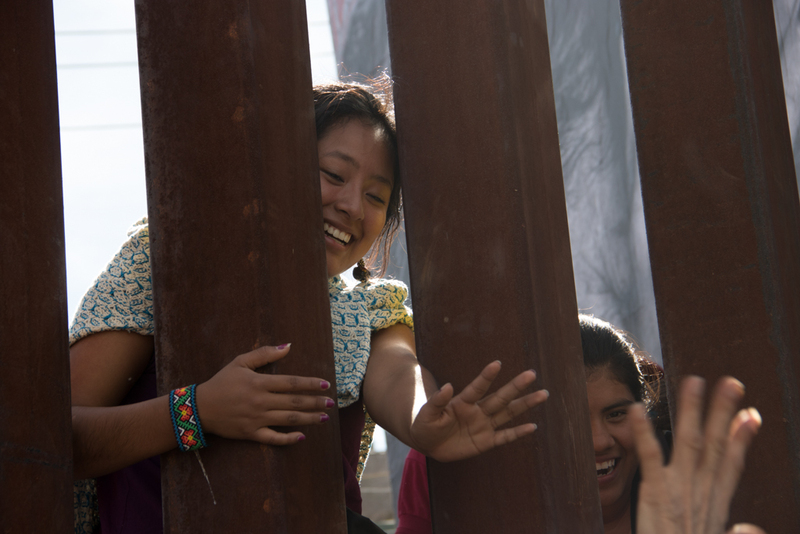 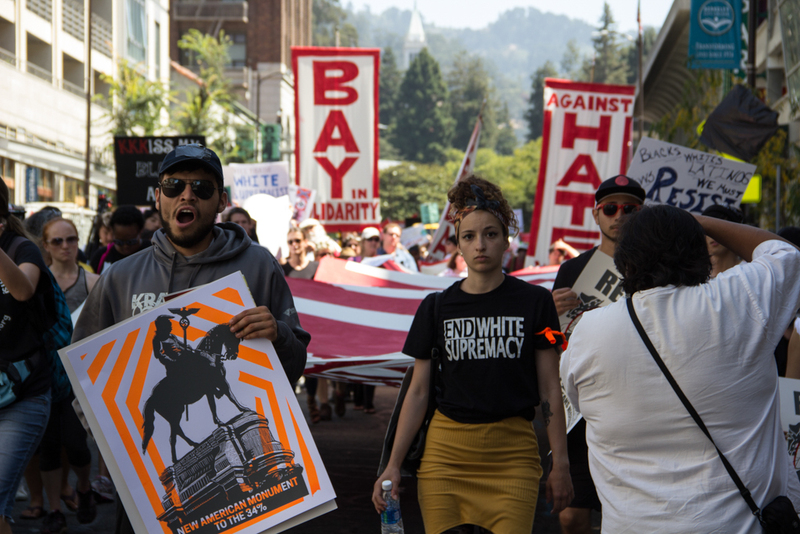 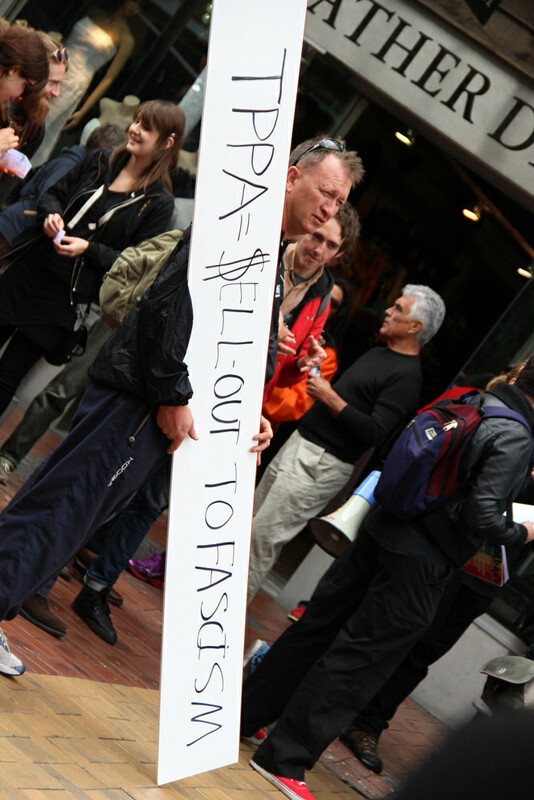 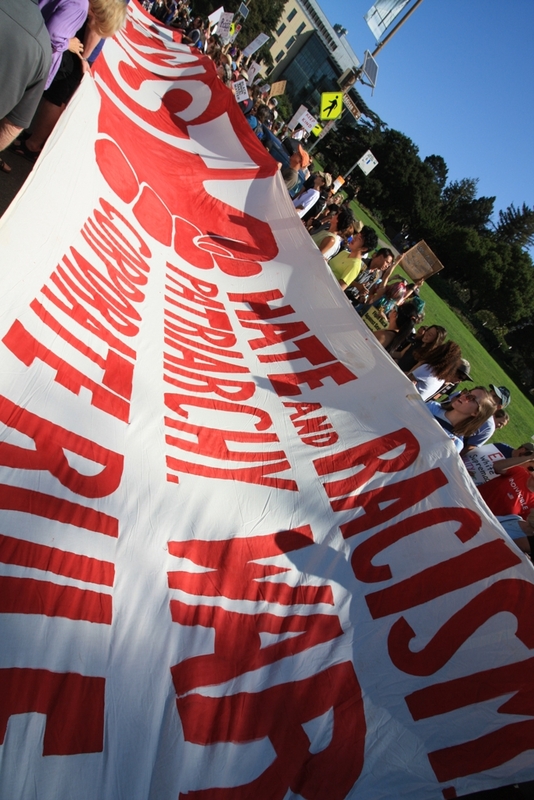 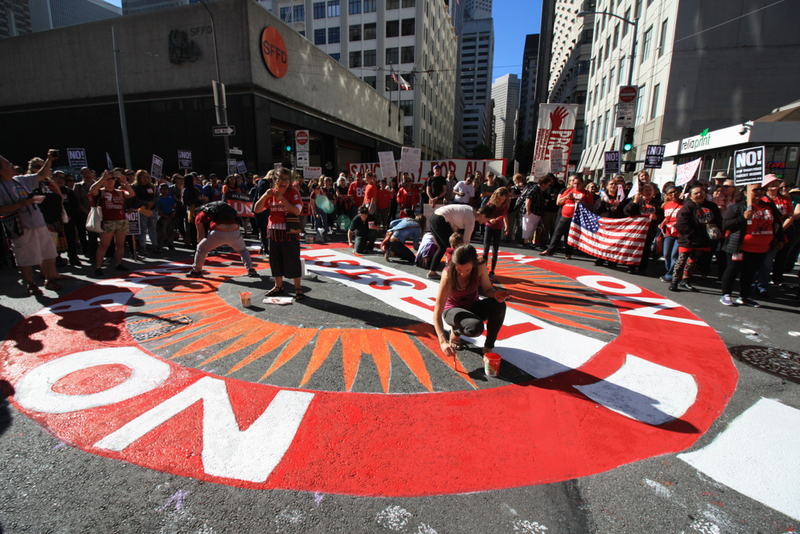 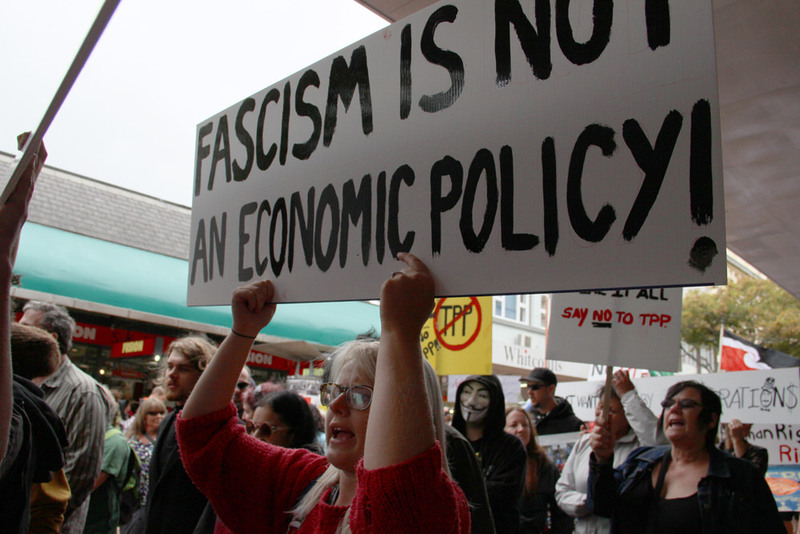 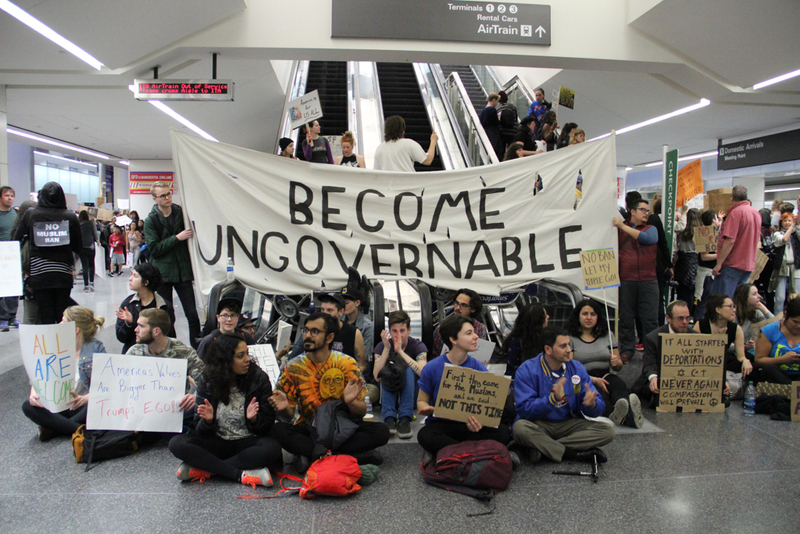 The May Day March, annually organized by the May 1st Coalition, honors International Workers’ Day, and this year, with a larger coalition, points to the growing resistance against the Trump administration’s increasingly destructive policies on its 100th day in office. 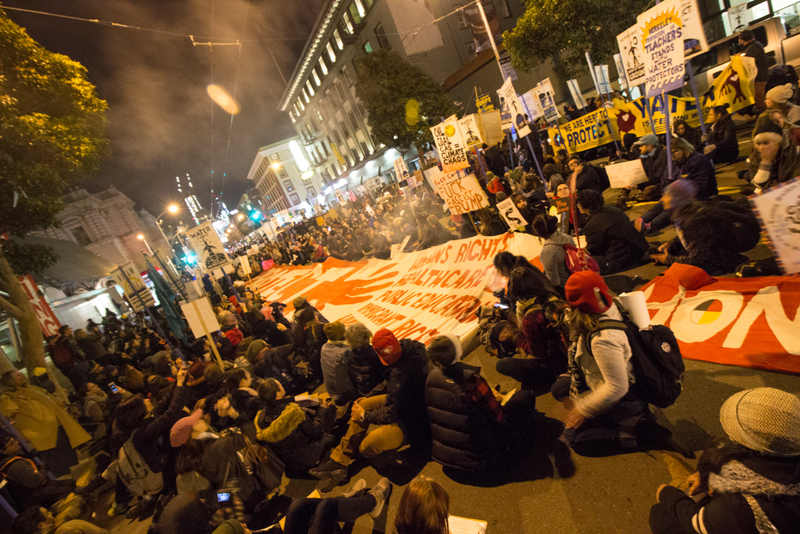 Early morning blockade – ICE headquarters in San Francisco. 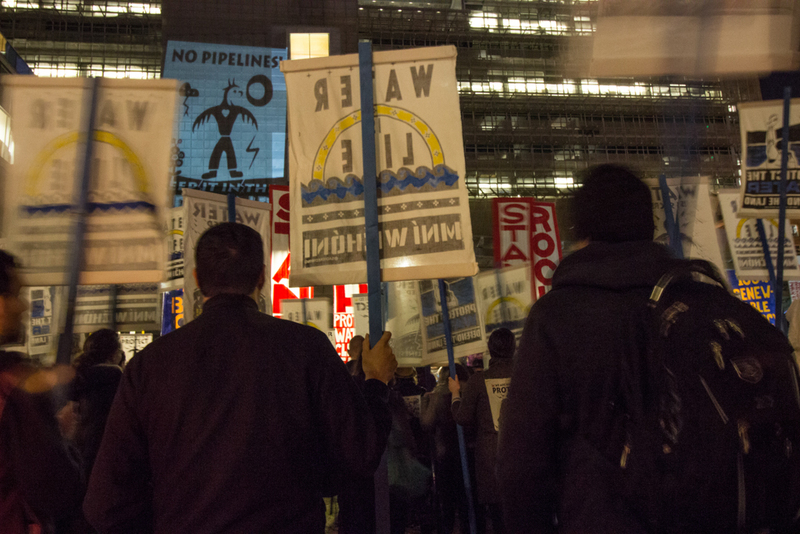 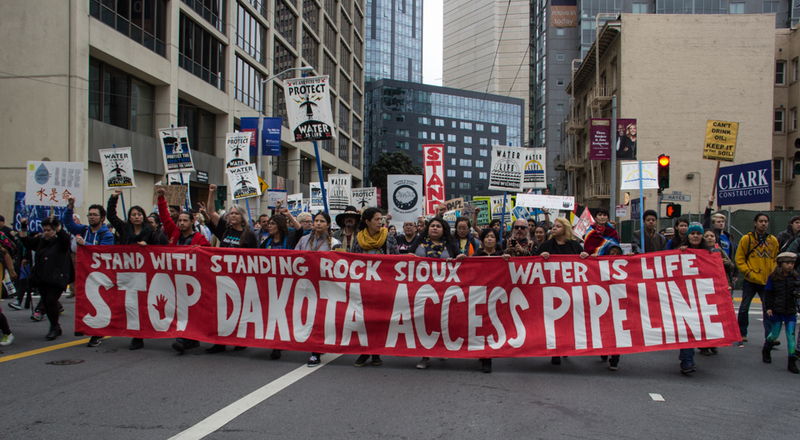 – From Standing Rock – Global call to resist the Dakota Access Pipeline from wherever you are. 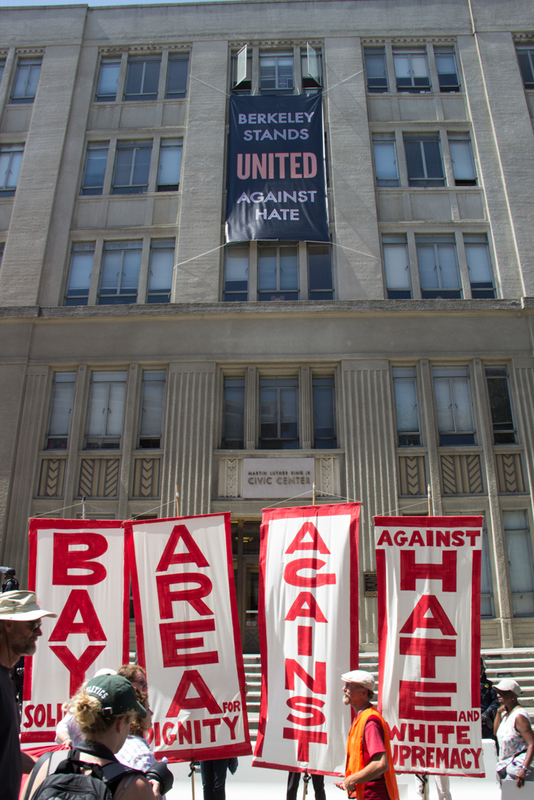 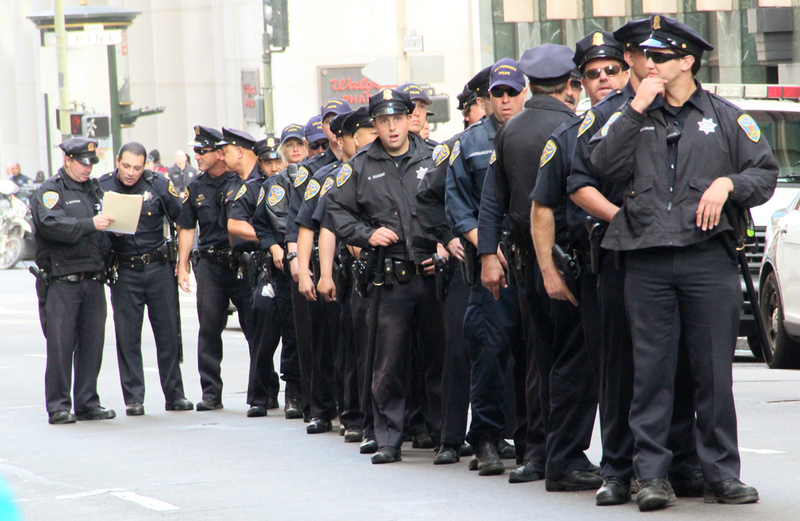 In San Francisco, up to 20 arrested at Federal Building during day long rally. 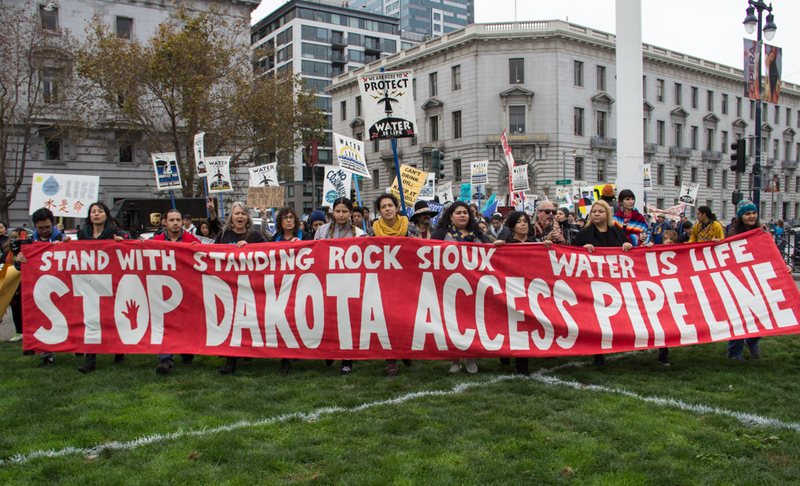 Meanwhile, following push from Trump, drilling on the last section of the pipeline that crosses under Lake Oahe / Missouri River can now begin immediately without planned Environmental Impact Statement. 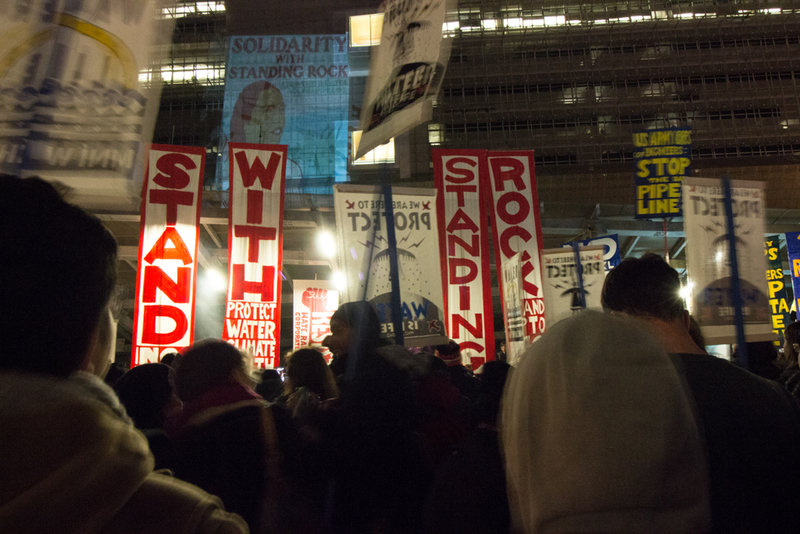 The Standing Rock Sioux vows to continue the fight in the courts. 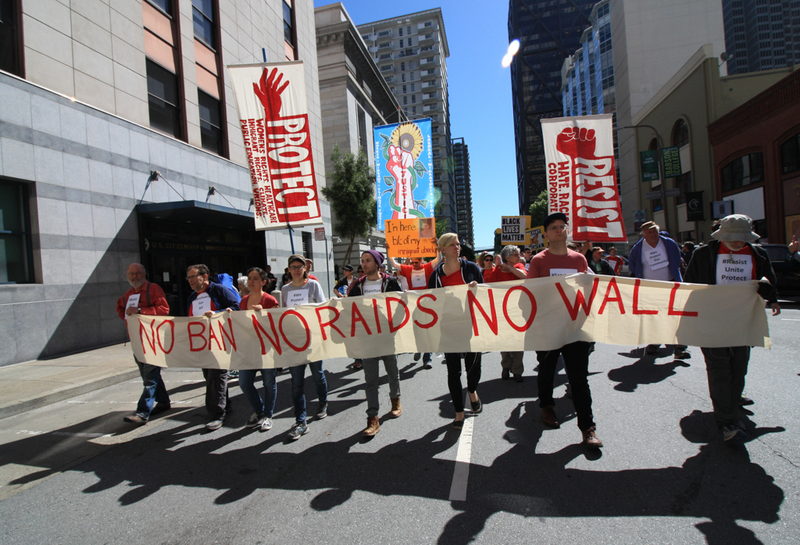 Thousands chanting “Let Them In, Let Them In” “No Ban, No Wall” “Kick Trump Out! 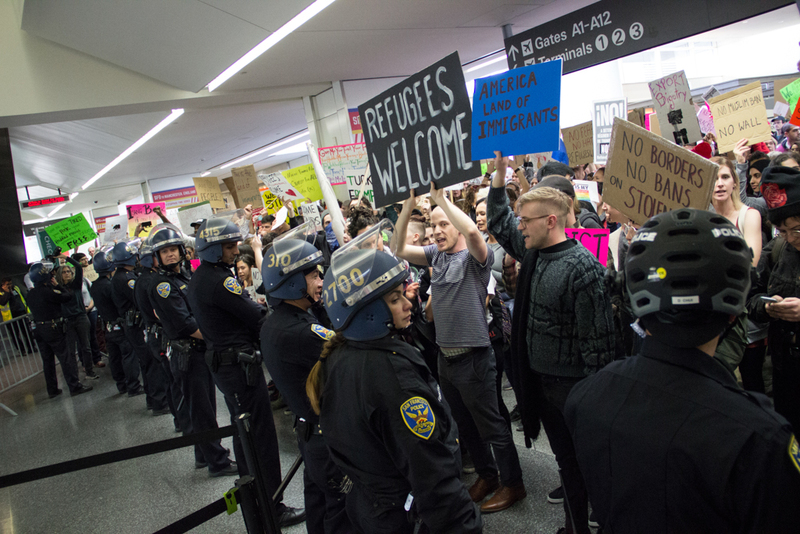 Let the Refugees In!” as passengers are detained from flights originating in the predominantly Muslim countries of Iran, Iraq, Libya, Somalia, Sudan, Syria and Yemen. 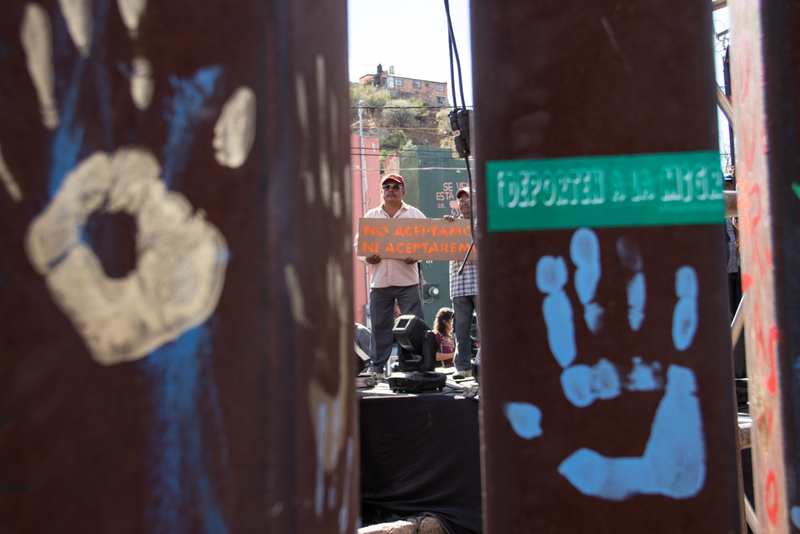 The crowd of protesters continues to grow with a vow to remain until those being detained have seen lawyers and are allowed to freely enter the country. 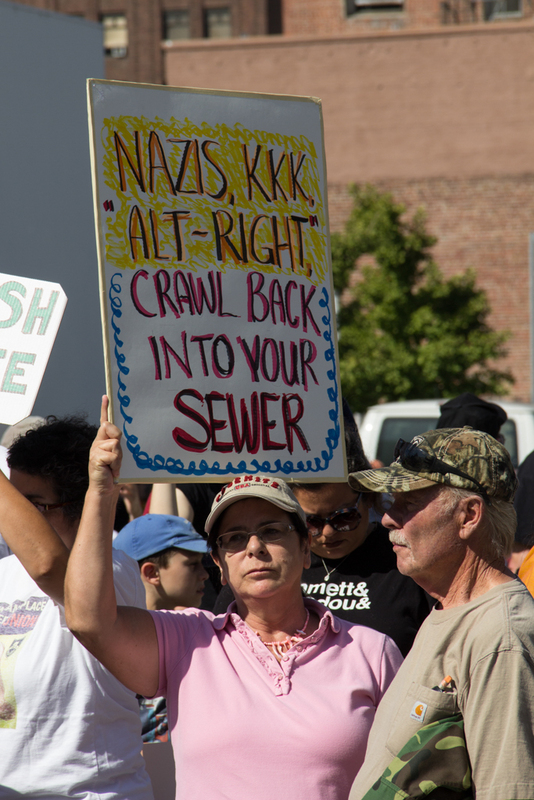 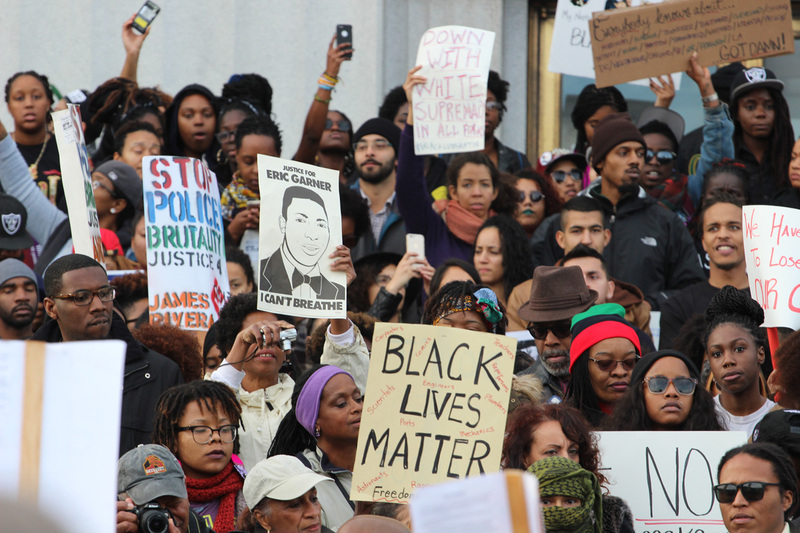 Similar massive protests are happening across the country. 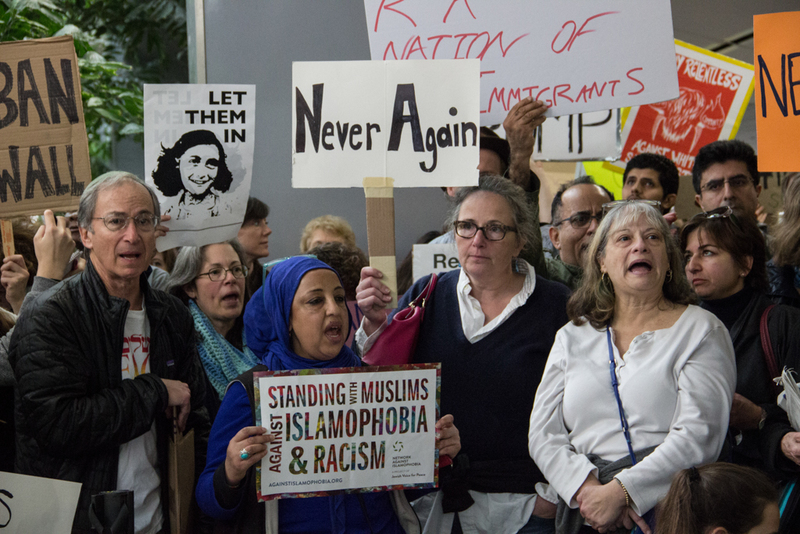 Massive crowds gathered for 2nd day with intense passion and solidarity to unequivocally stand against the ban on refugees and those entering the US from 7 predominantly Muslim Countries. 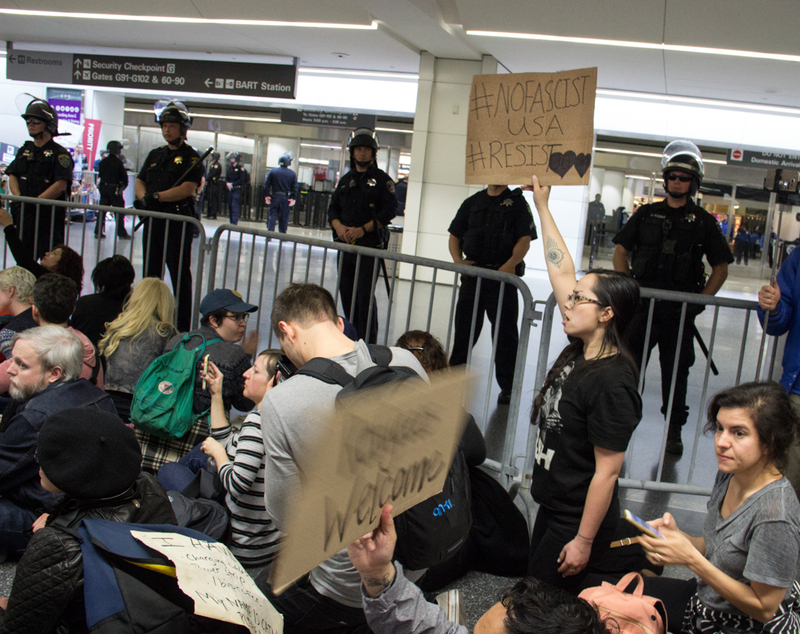 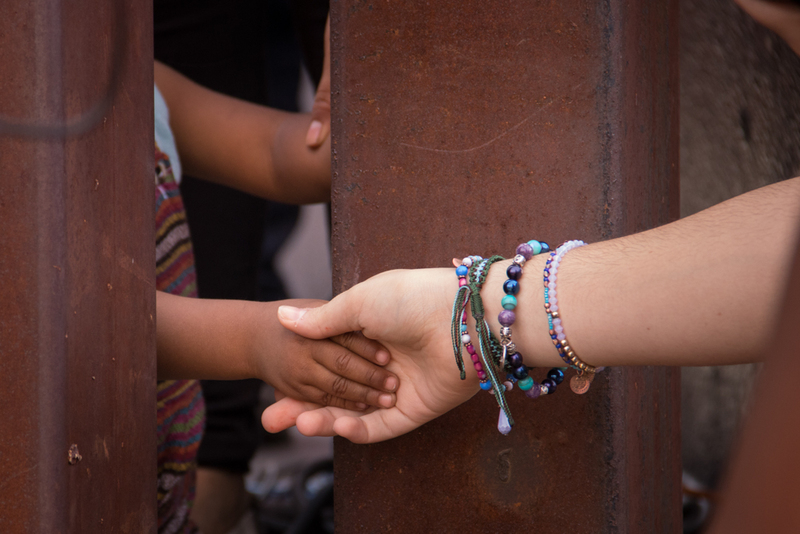 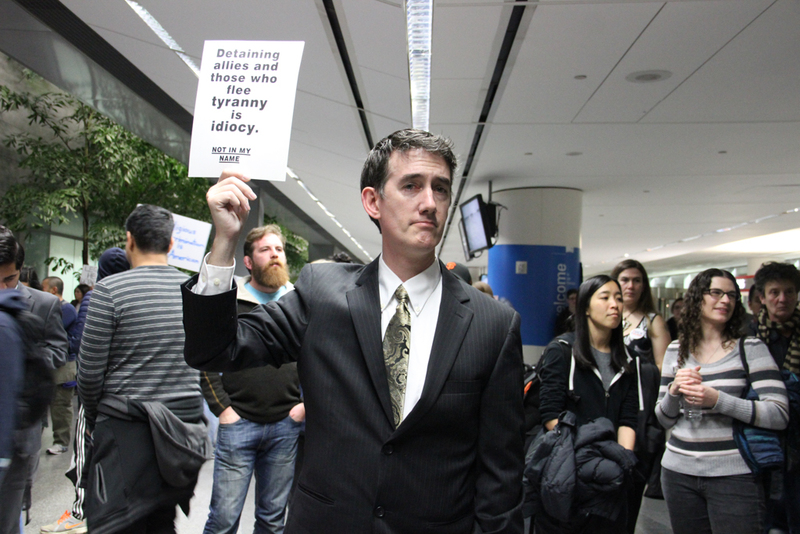 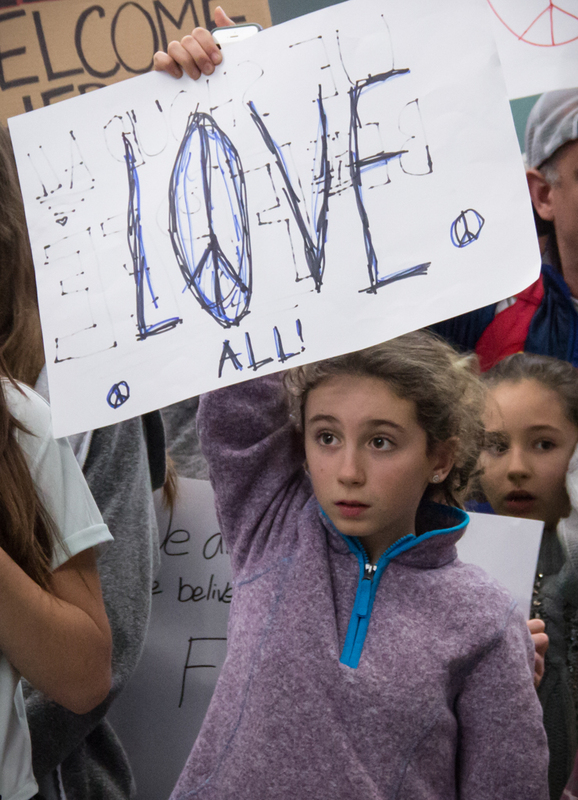 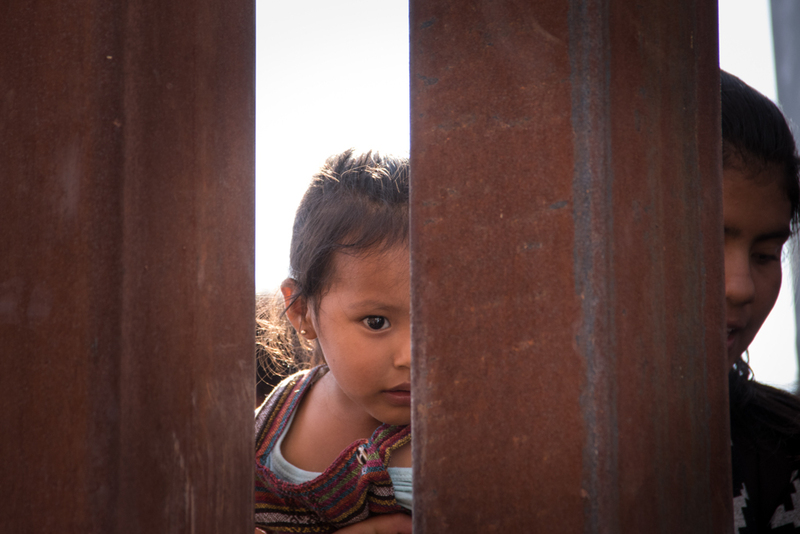 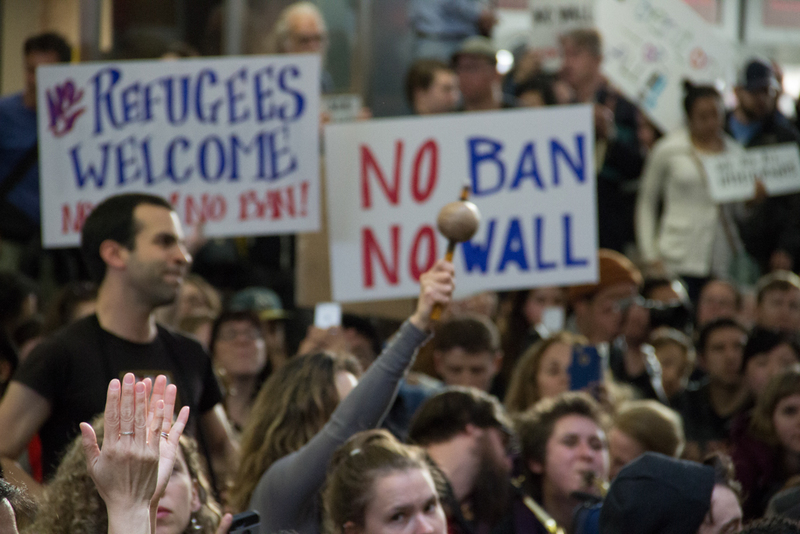 Up to 50 lawyers offered pro-bono assistance to families waiting for loved ones who had been detained or who they feared would be detained upon arrival. 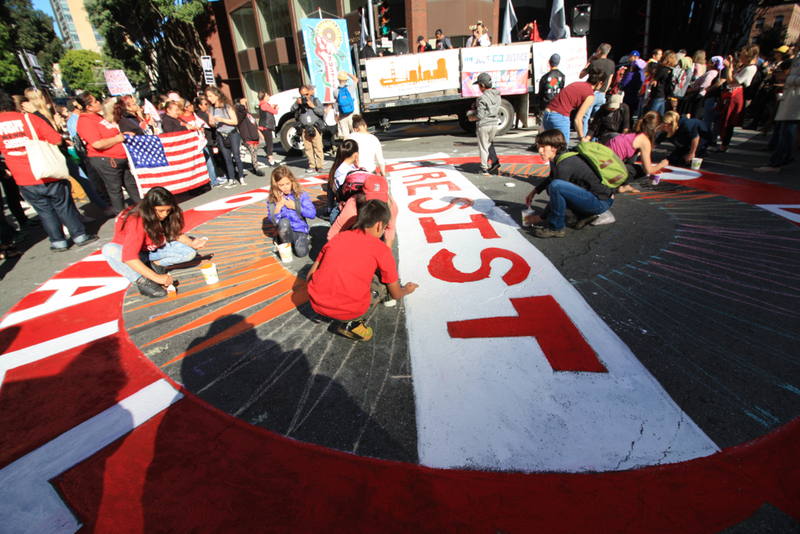 We Resist! 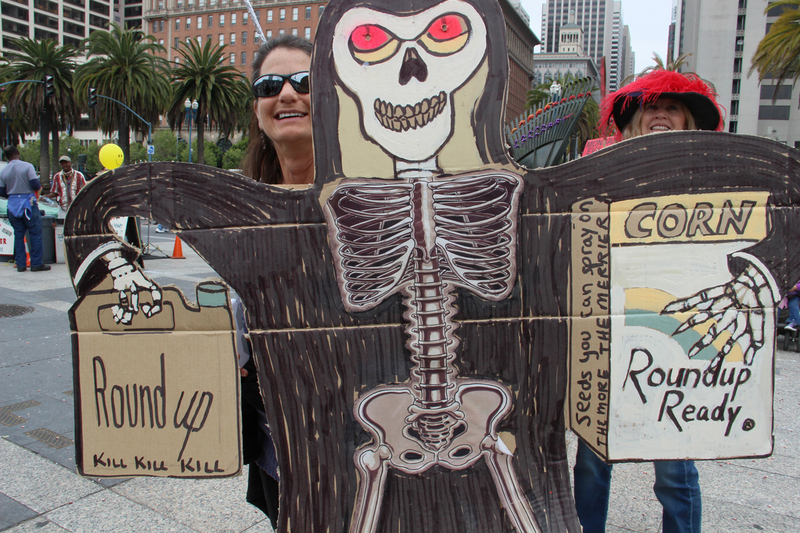 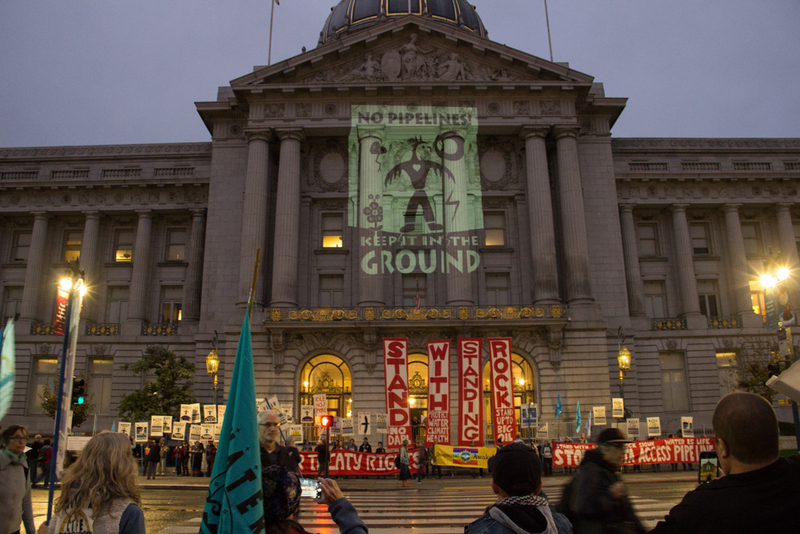 No KXL No DAPL — Rally at San Francisco Federal Building. 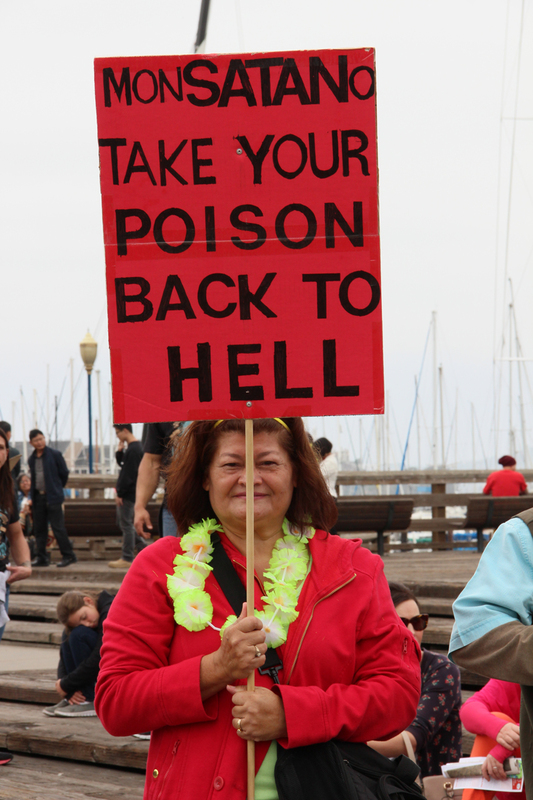 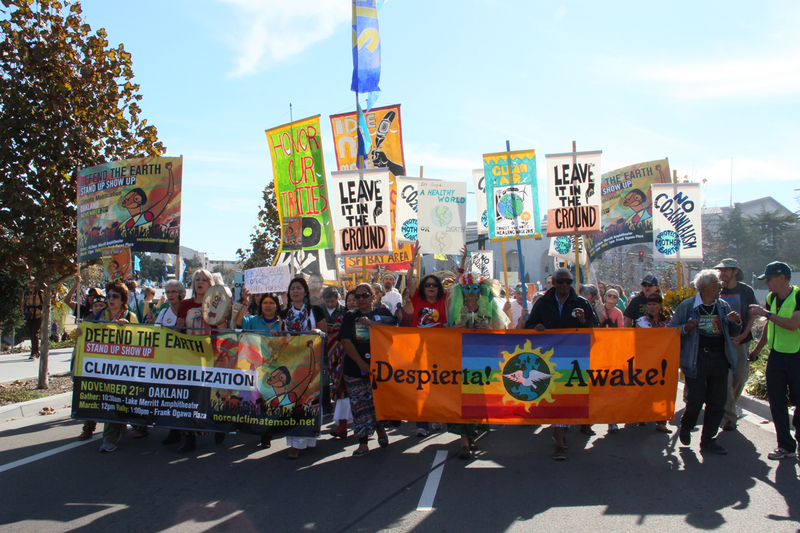 Following the lead of Idle No More SF Bay, thousands came to stand together for the protection of clean water, clean air, clean energy, the climate, treaty rights, sacred sites and the future of all the generations that will follow. 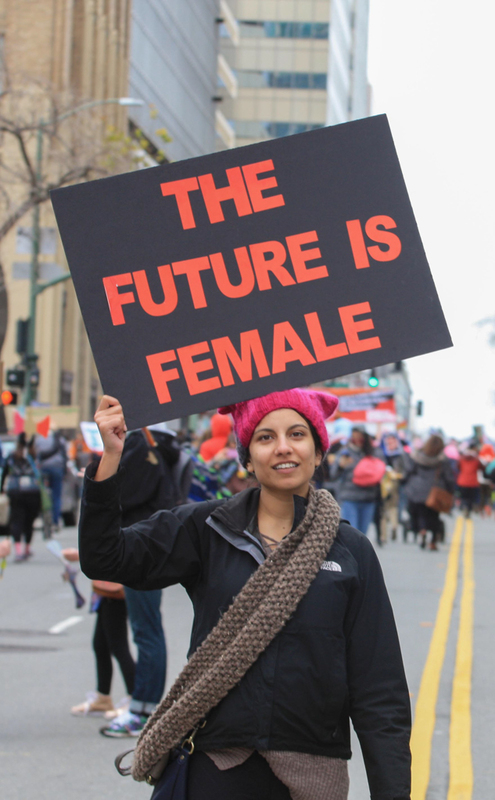 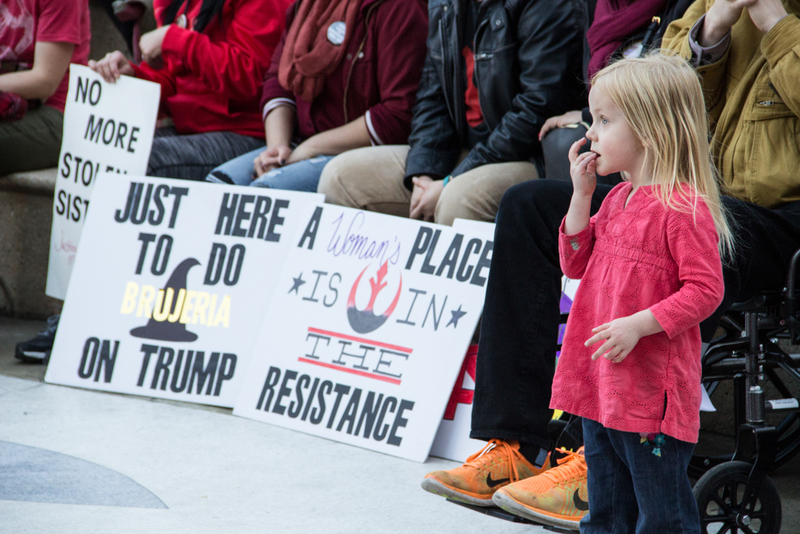 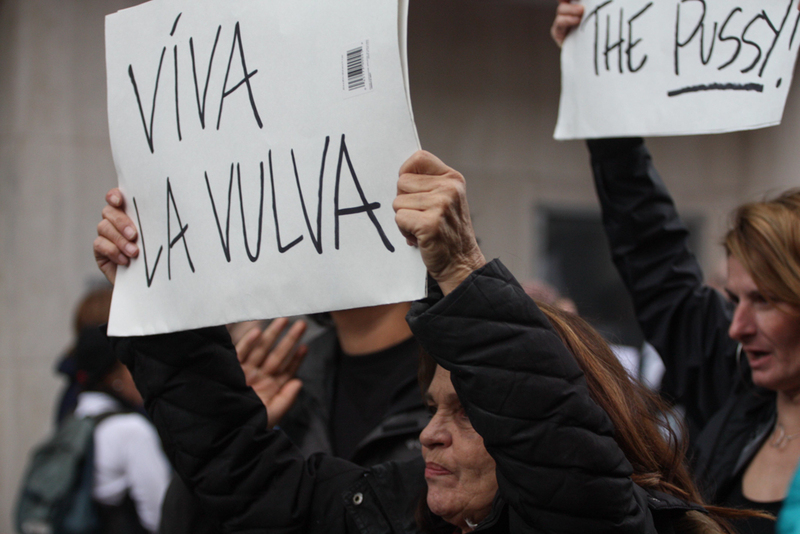 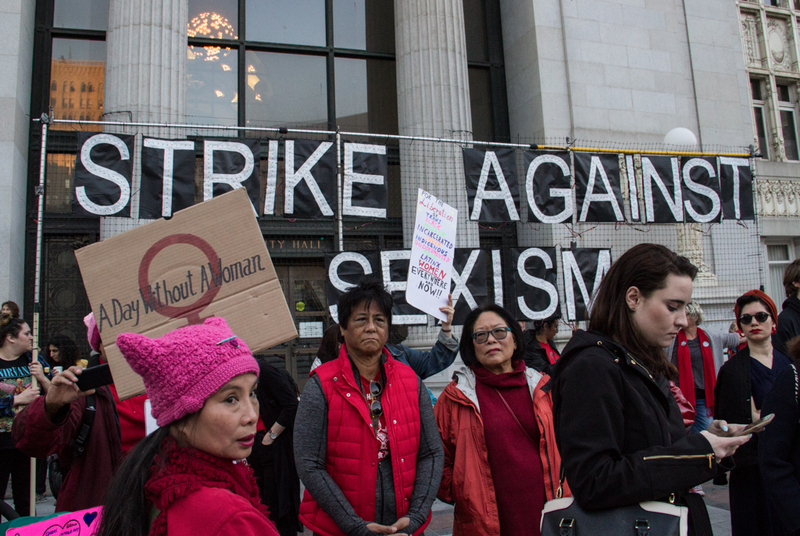 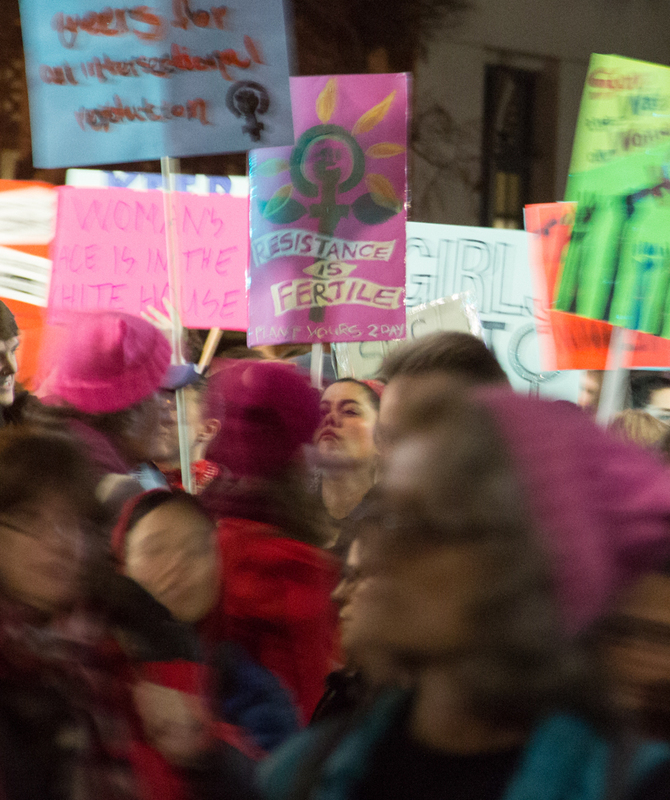 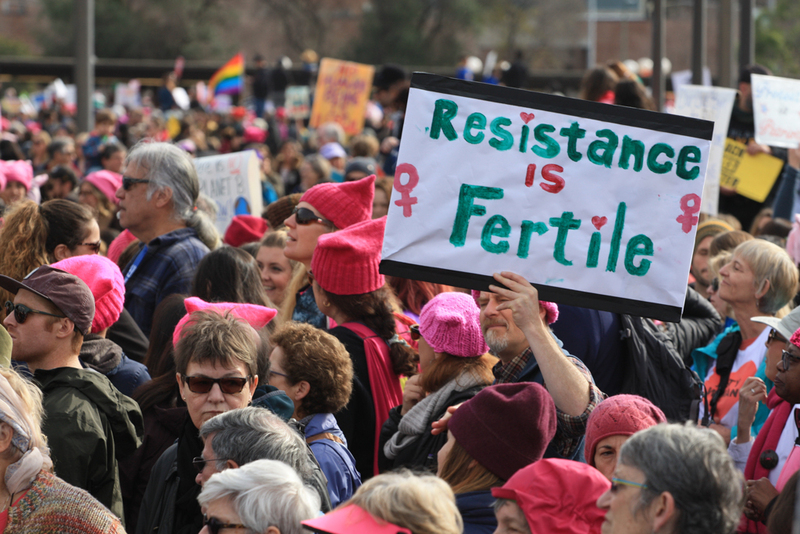 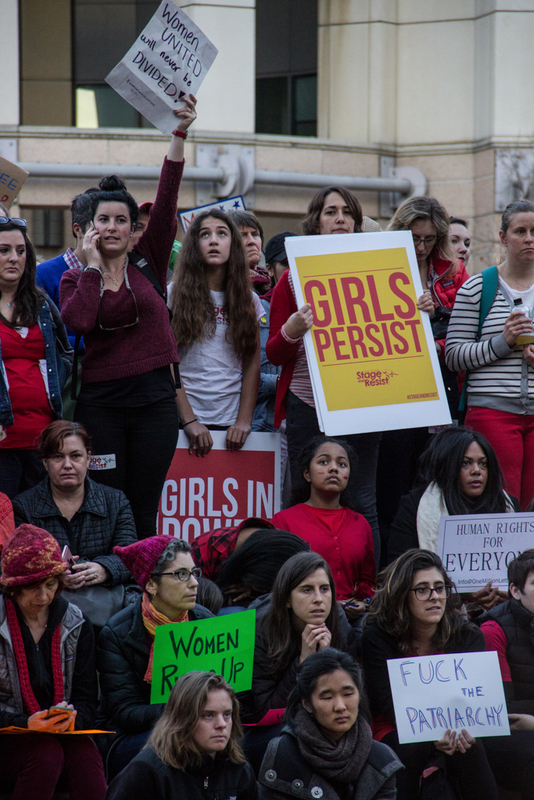 The day following the Trump Inauguration, hundreds of thousands of women marched in cities all over the United States and the world. 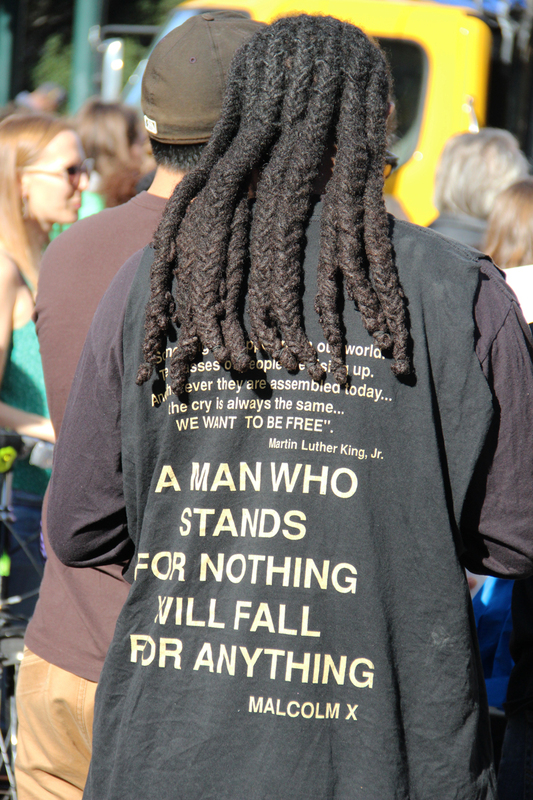 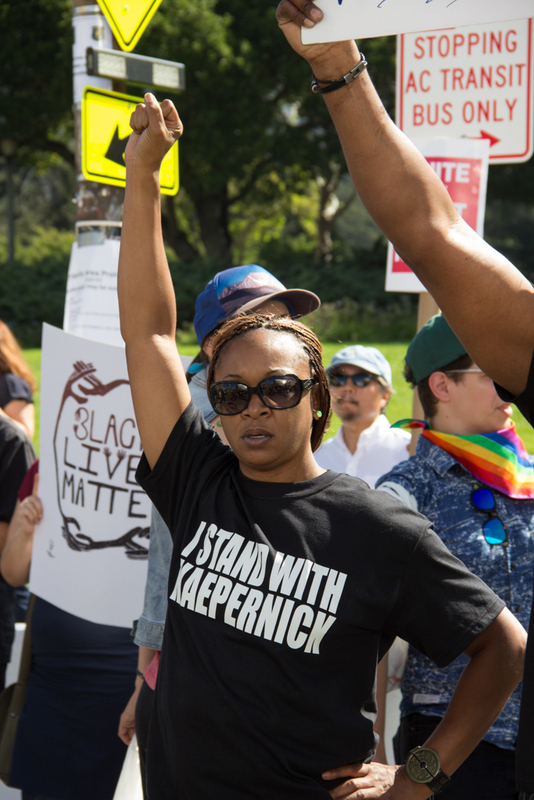 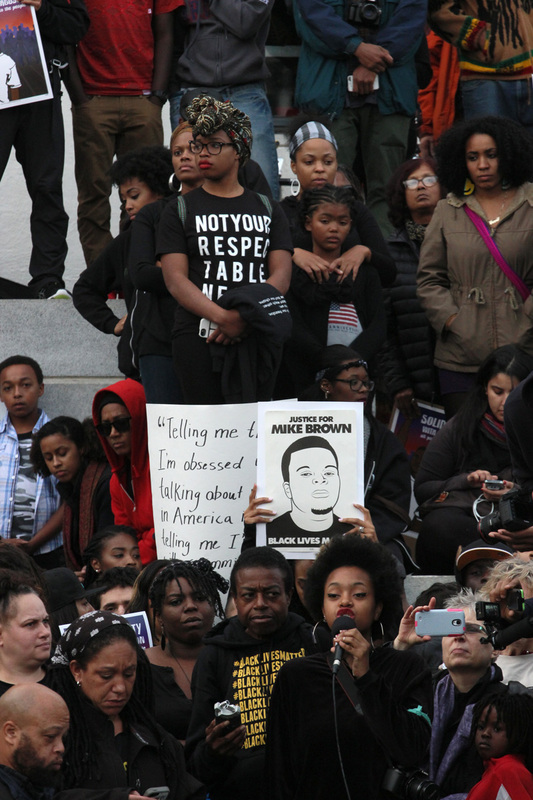 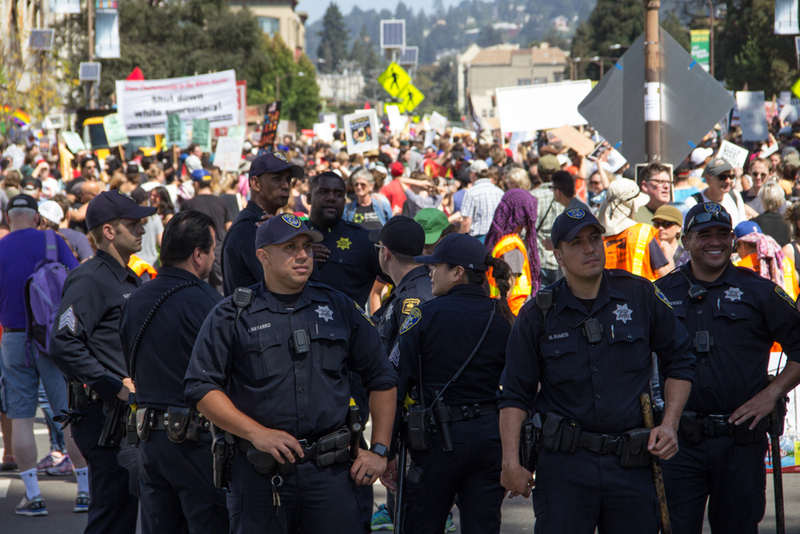 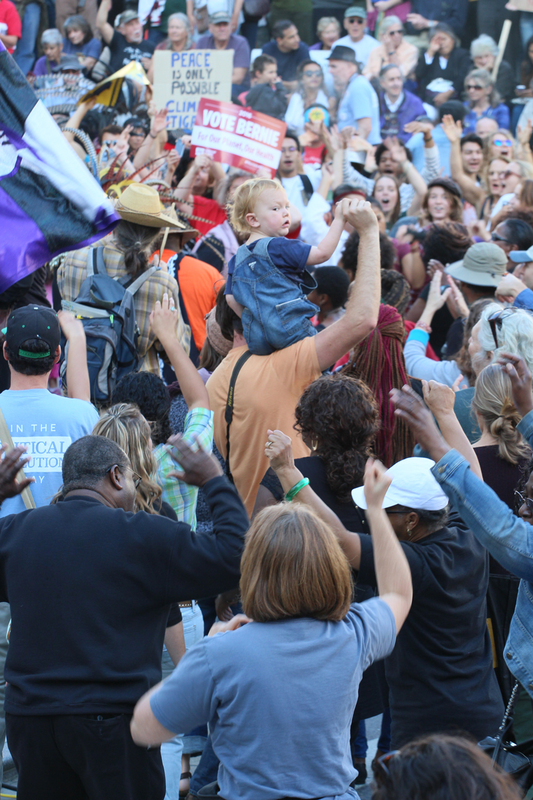 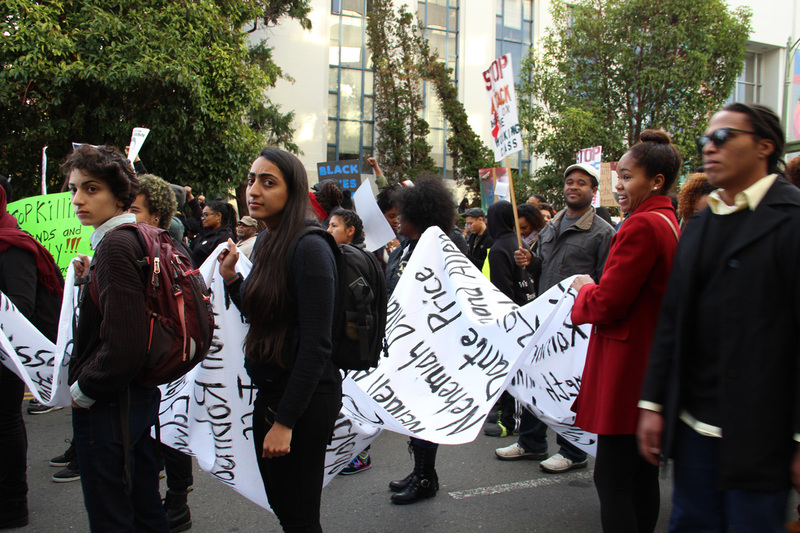 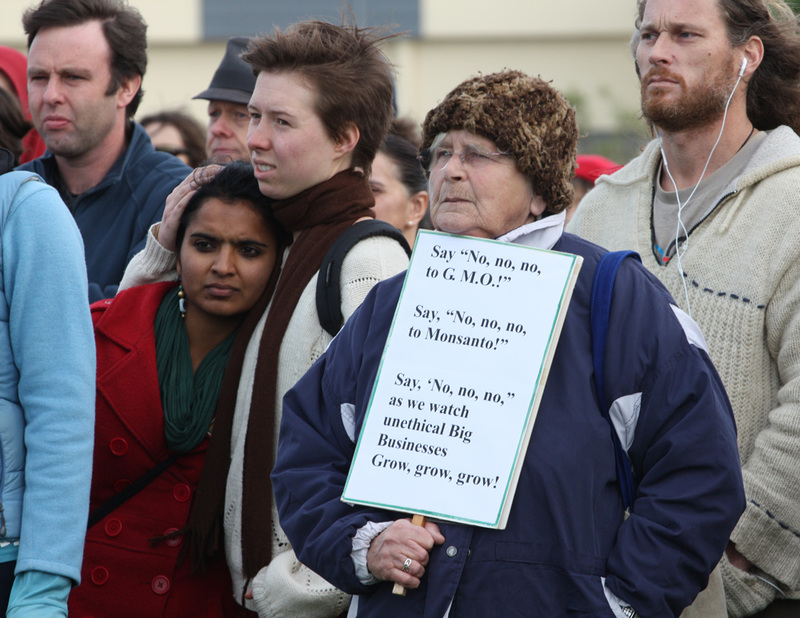 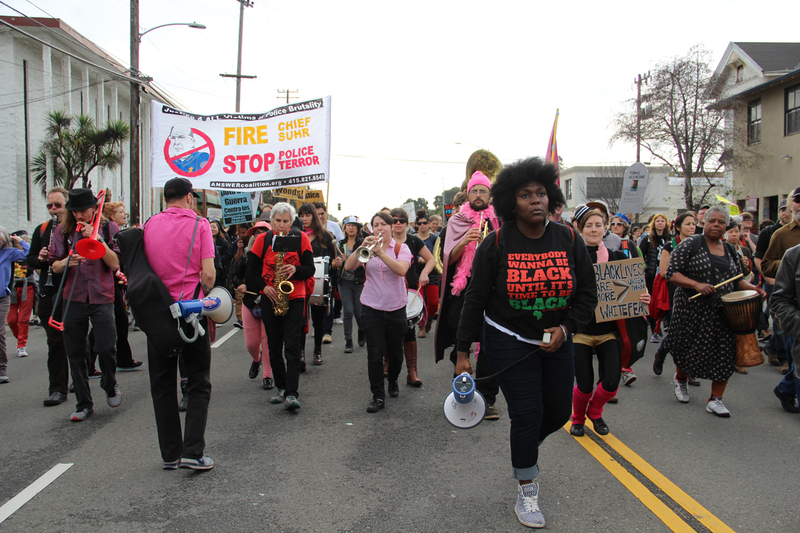 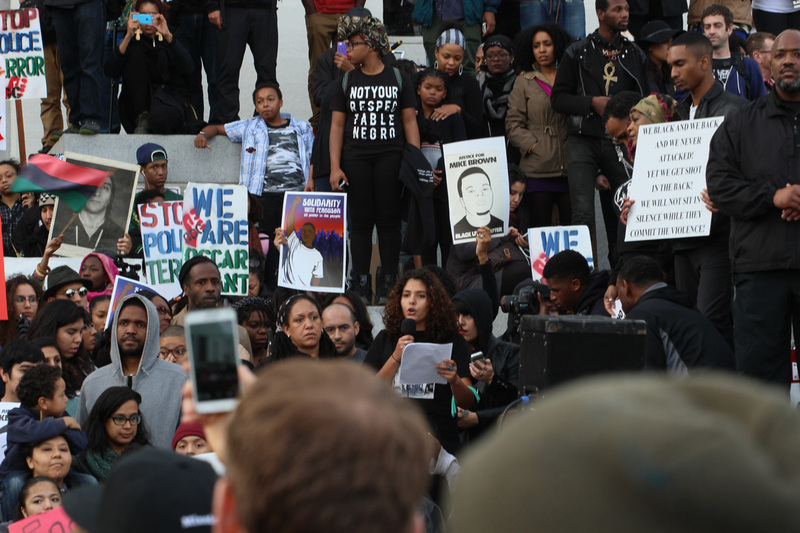 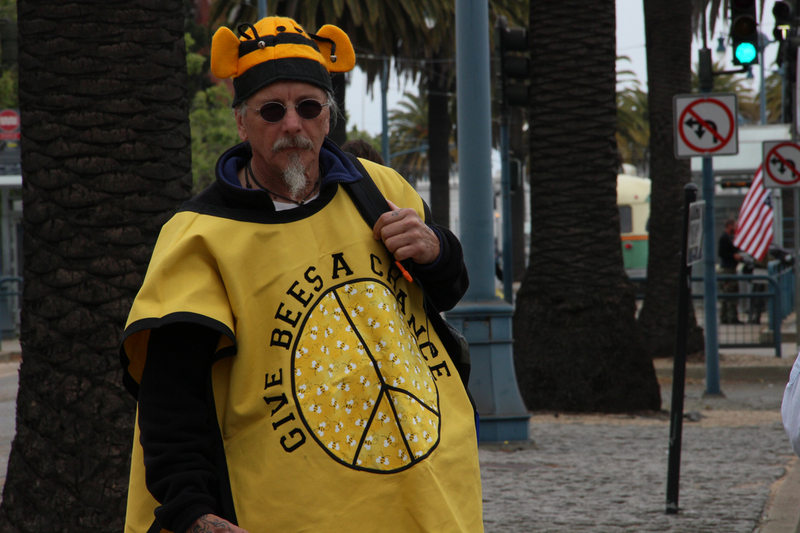 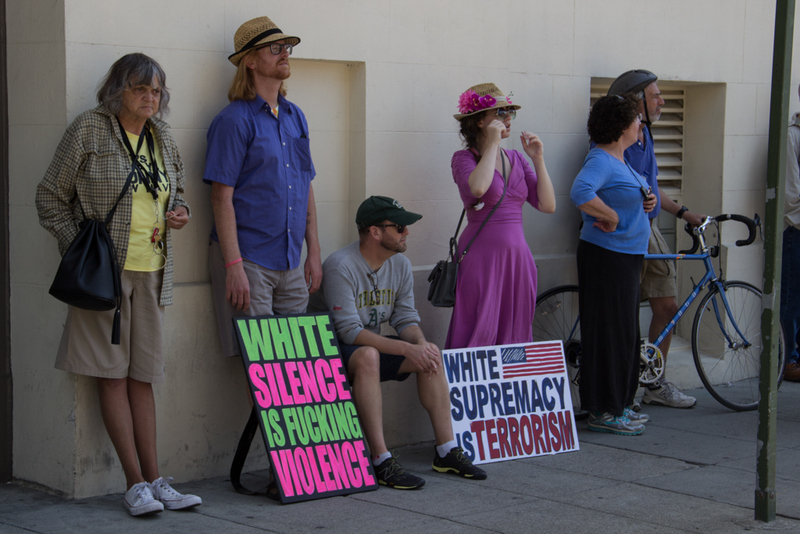 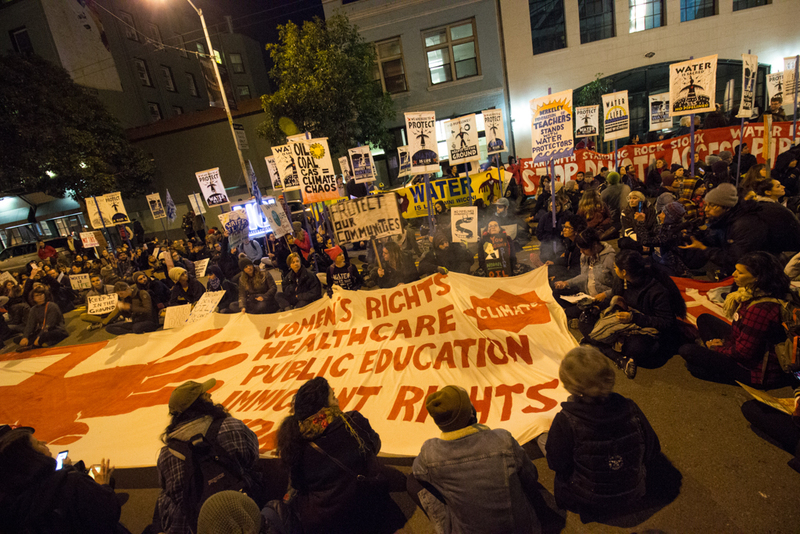 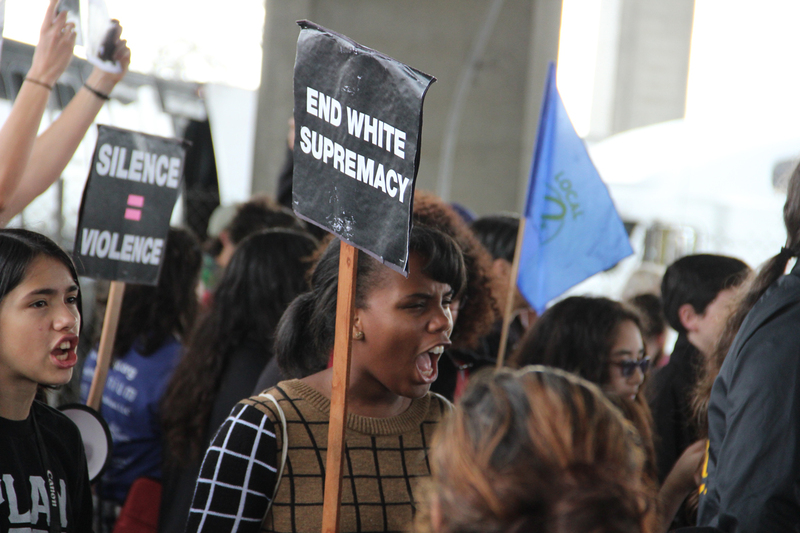 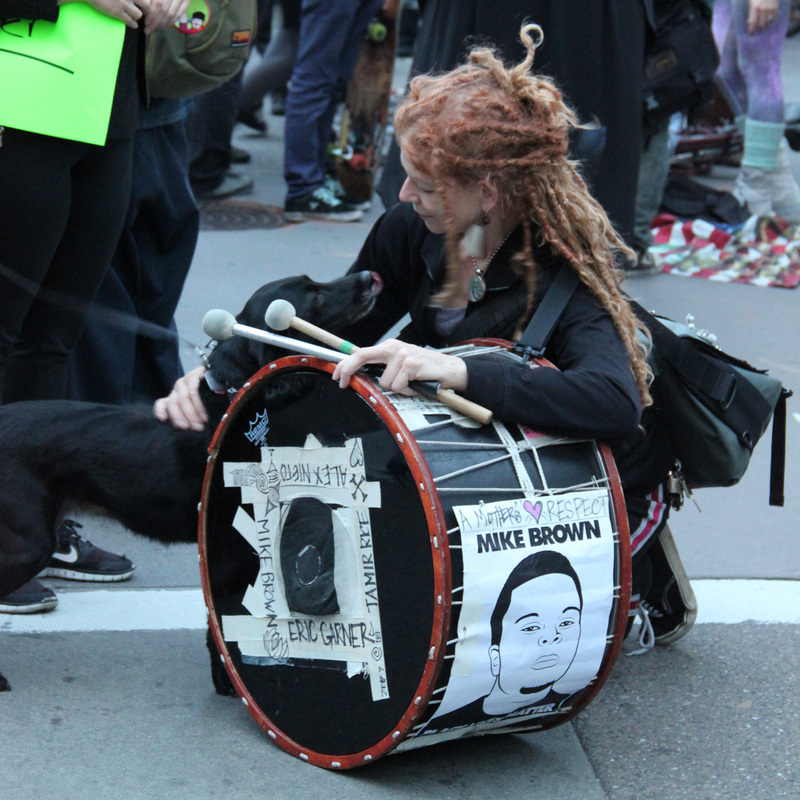 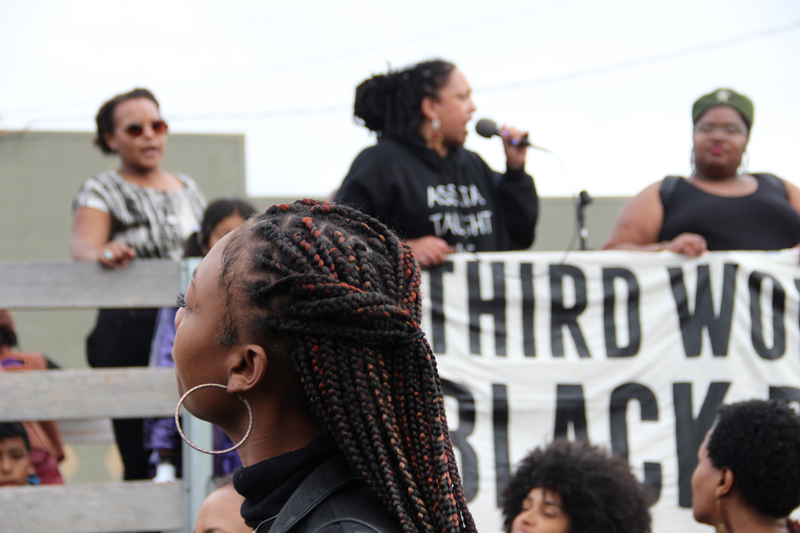 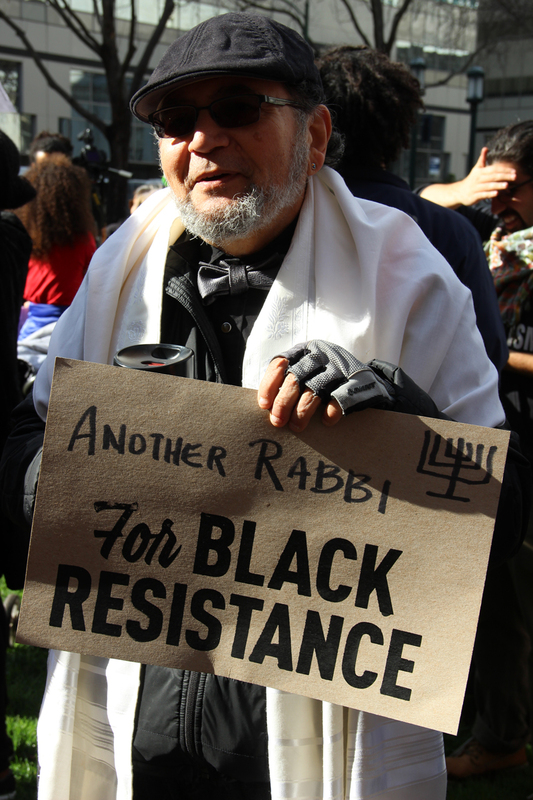 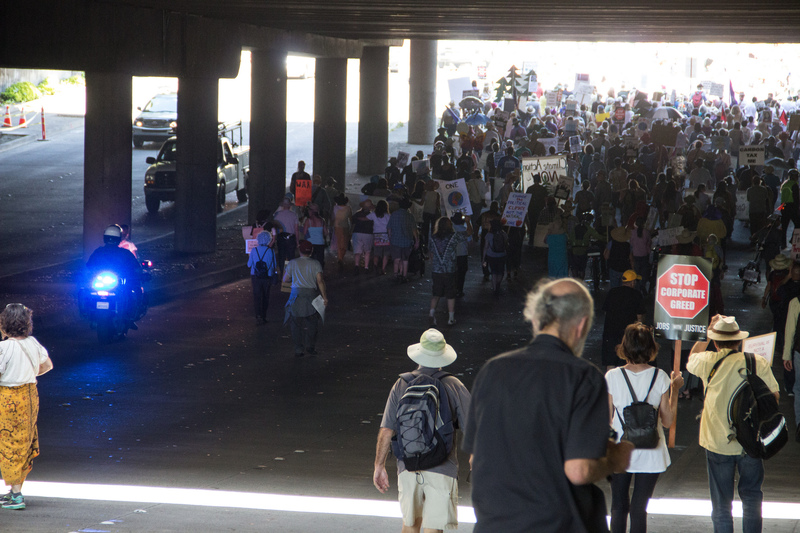 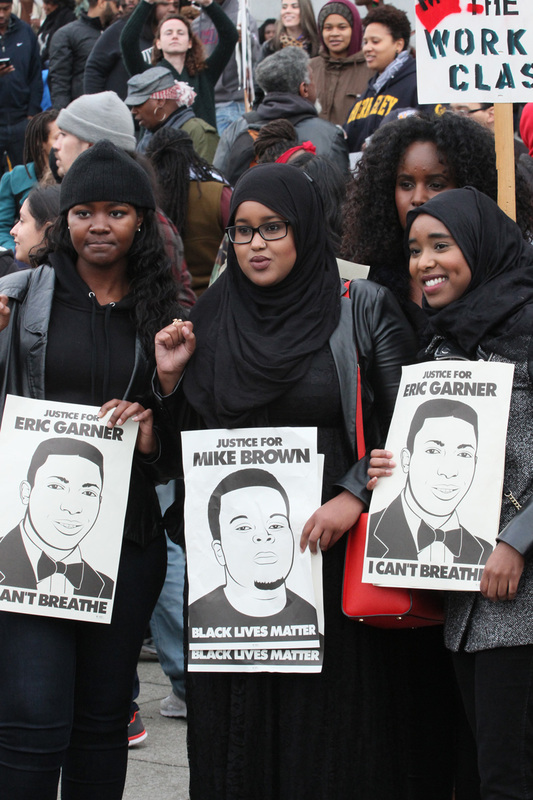 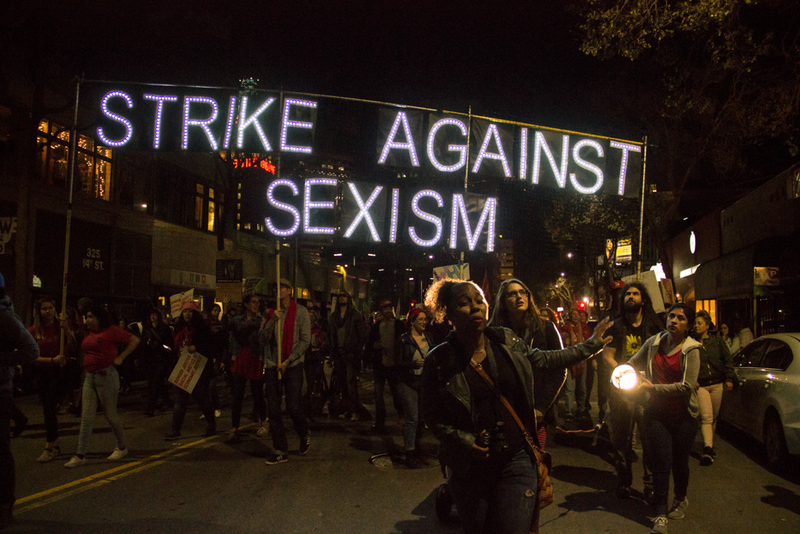 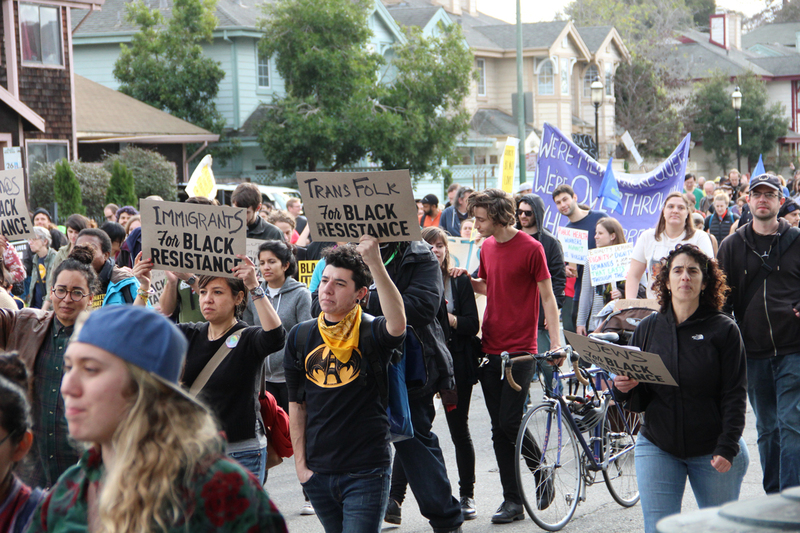 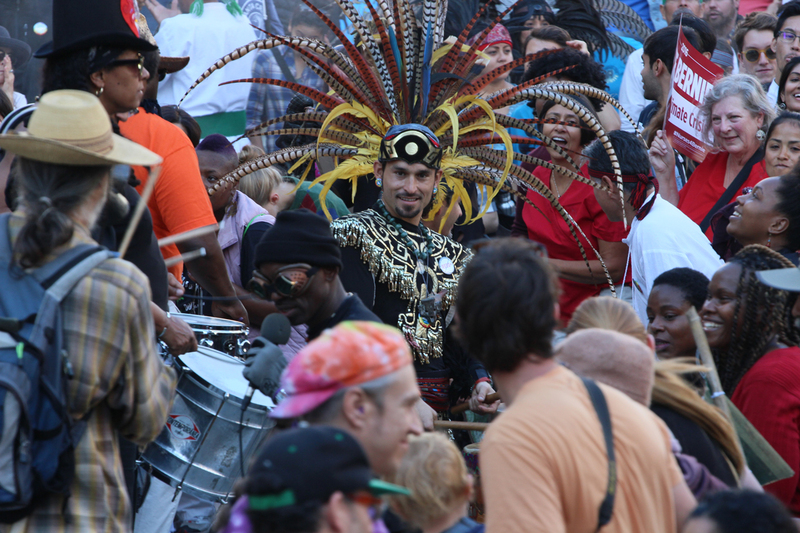 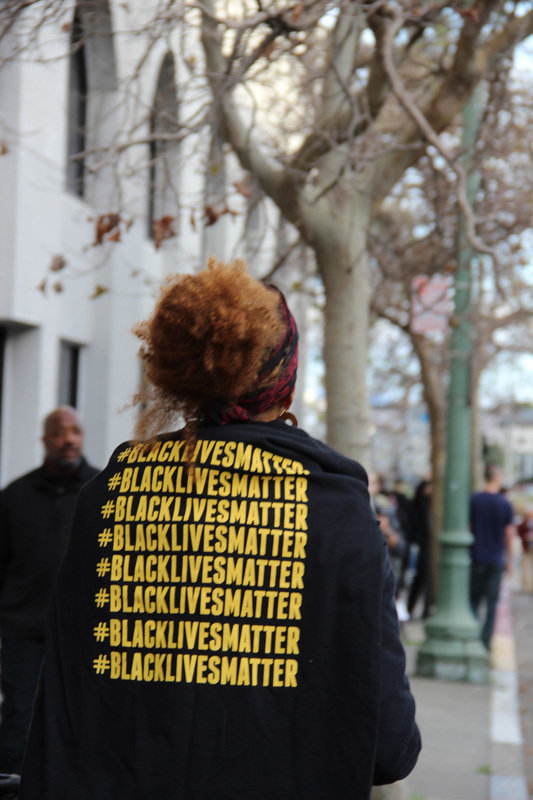 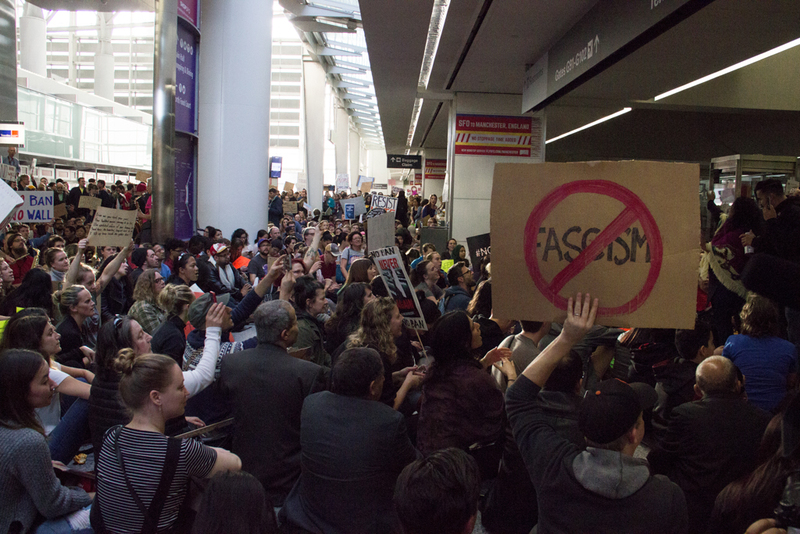 In Oakland, CA, close to 100,000 marched, creating near gridlock on transit systems and roadways. 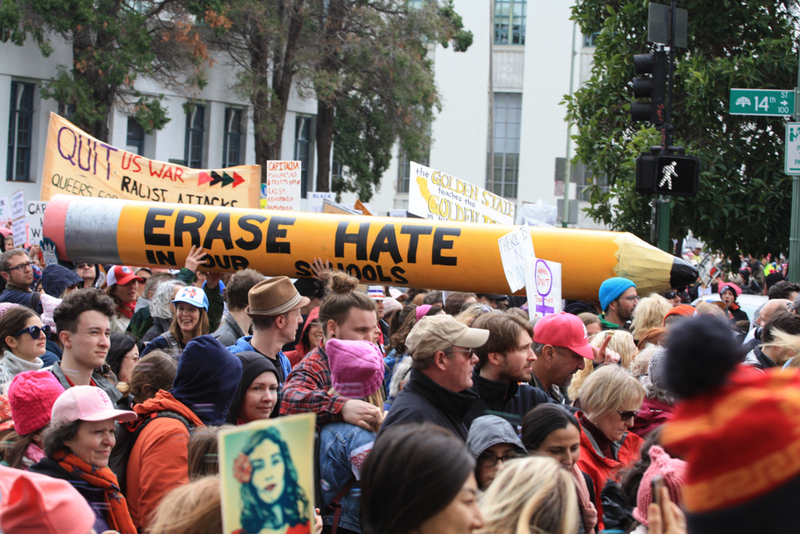 Speakers included Rebecca Solnit and Antonia Juhasz. 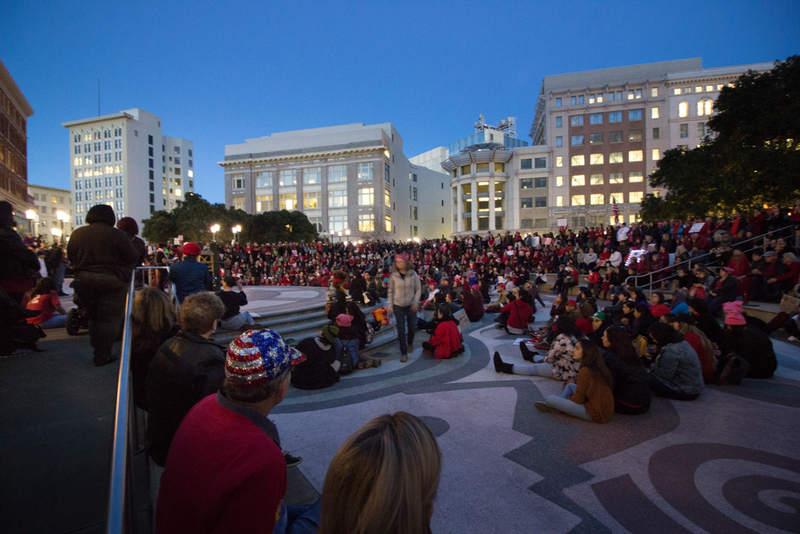 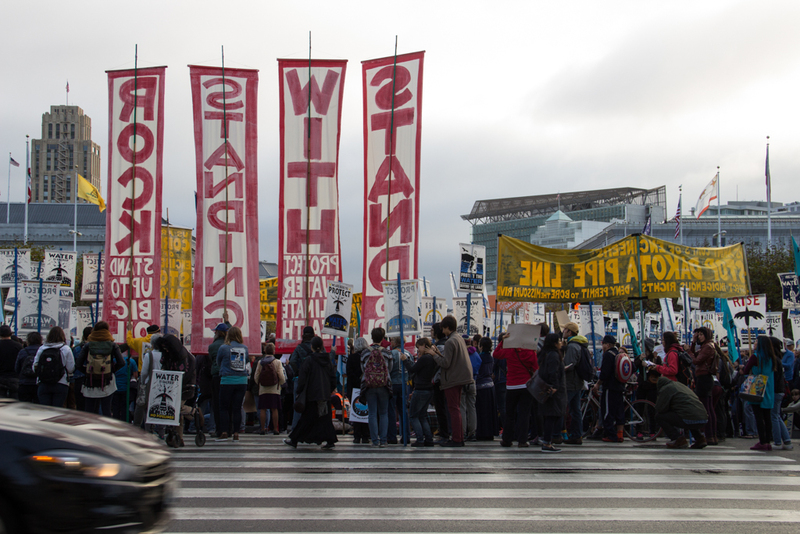 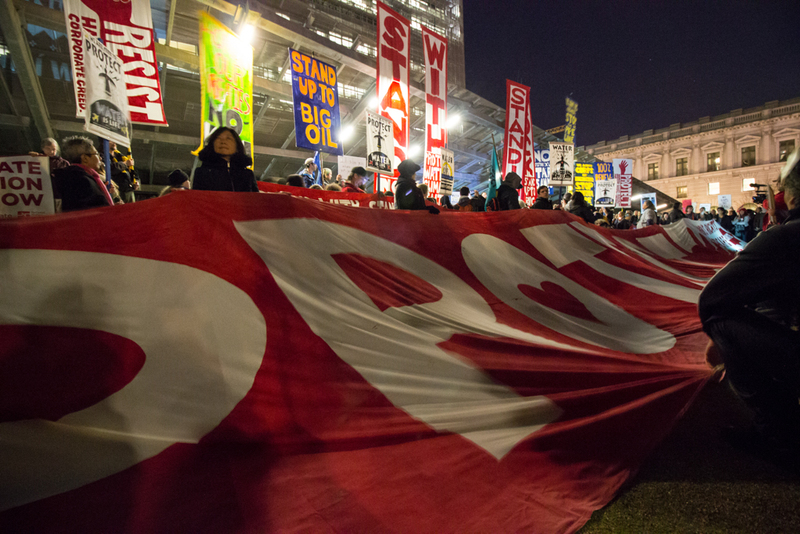 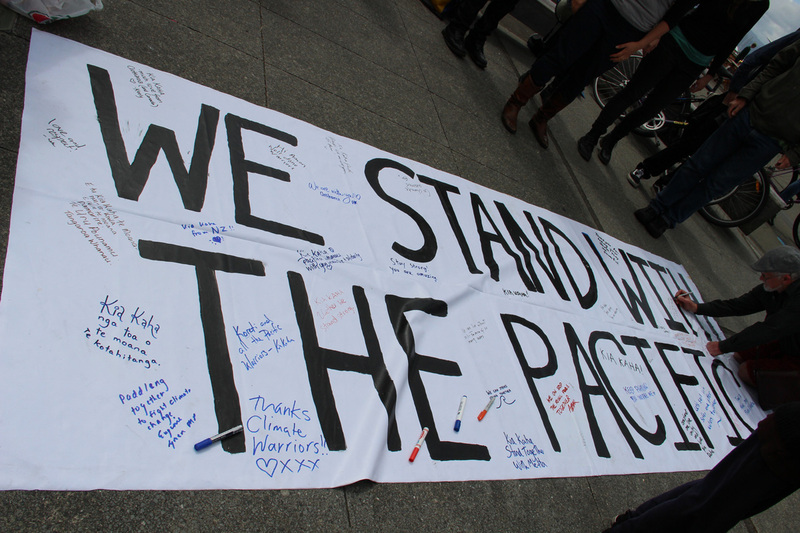 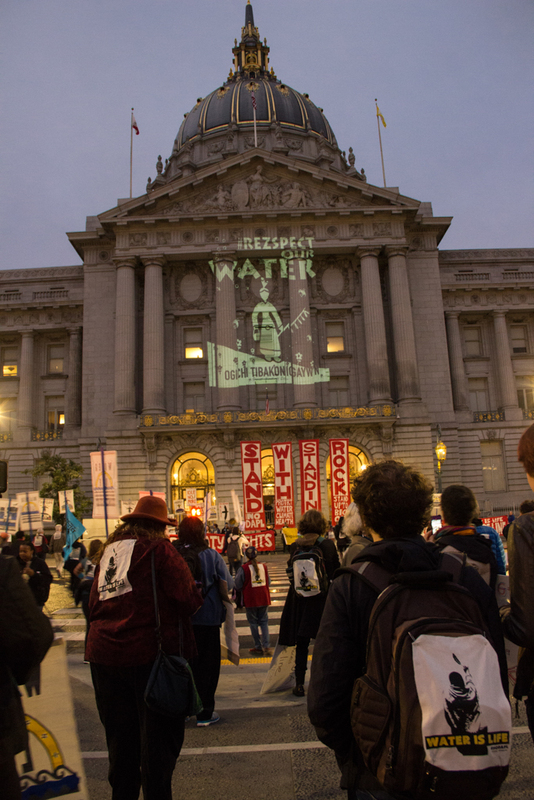 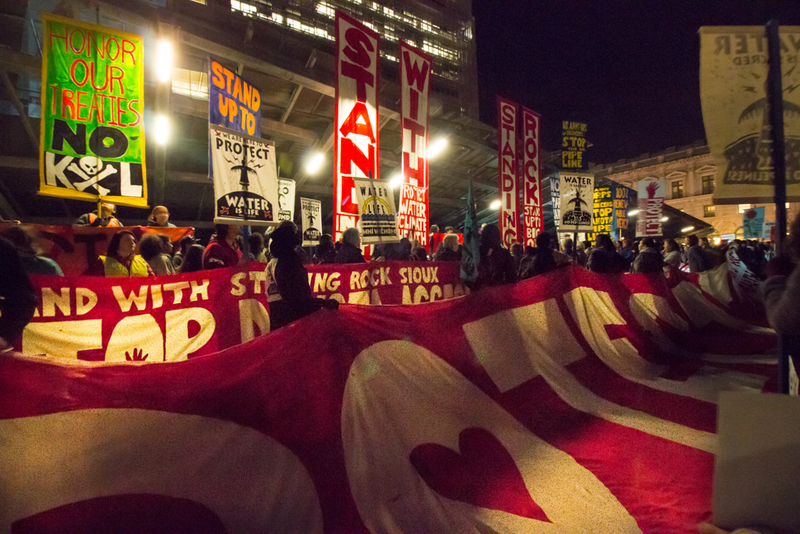 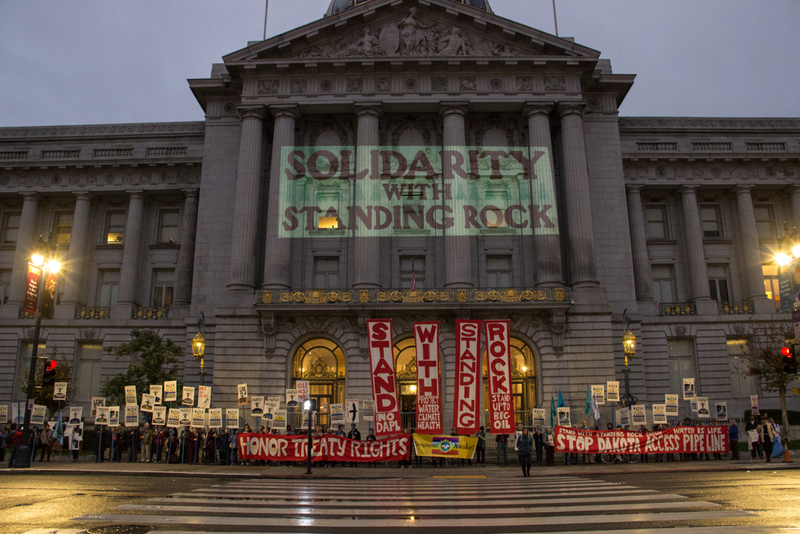 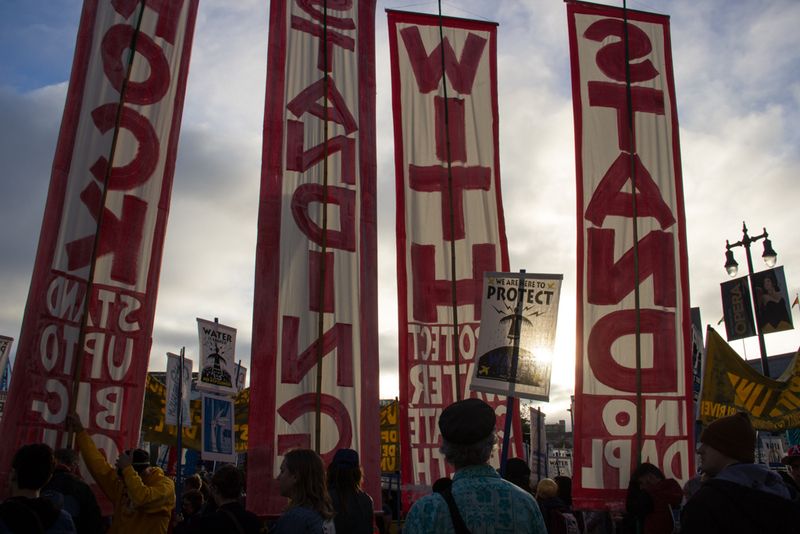 At dawn, thousands gather at San Francisco Civic Center to stand in solidarity with the Standing Rock Sioux tribe in North Dakota and the massive gathering of Protectors standing against the Dakota Access Pipeline. 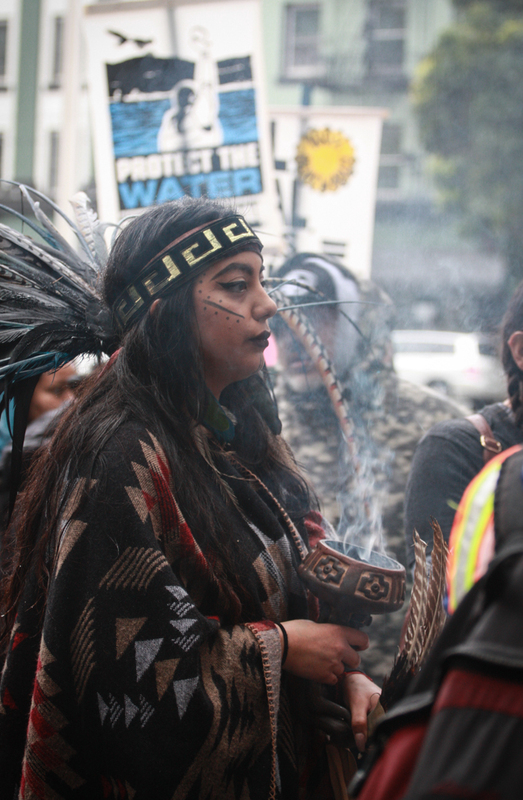 A sunrise ceremony is followed by a march to the SF Army Corps of Engineers to increase pressure on them to not permit the laying of pipe under the Missouri River, a source of water for the tribe and millions of others. 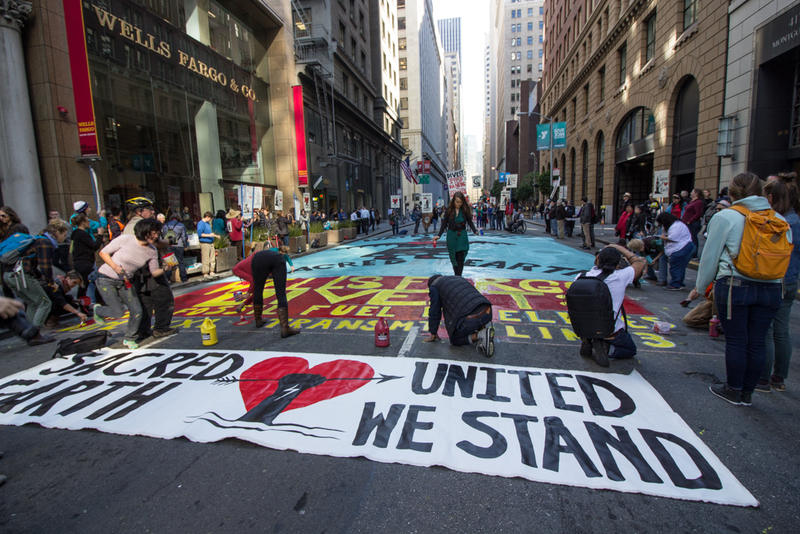 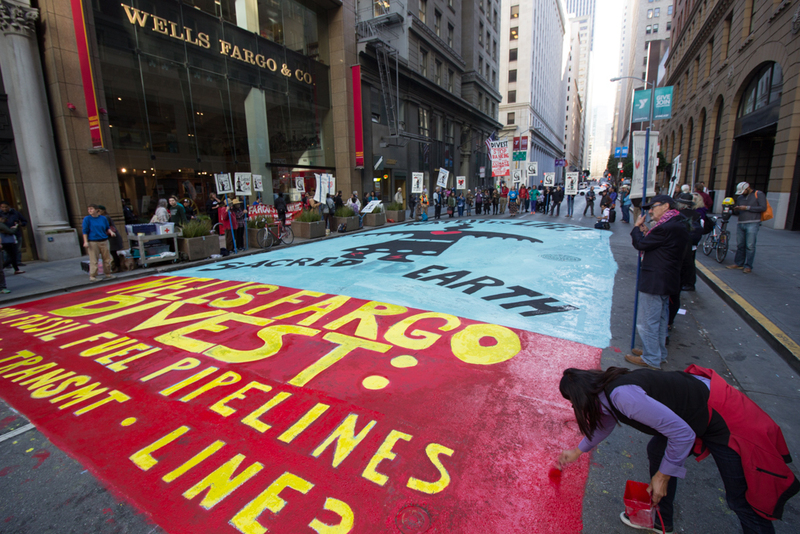 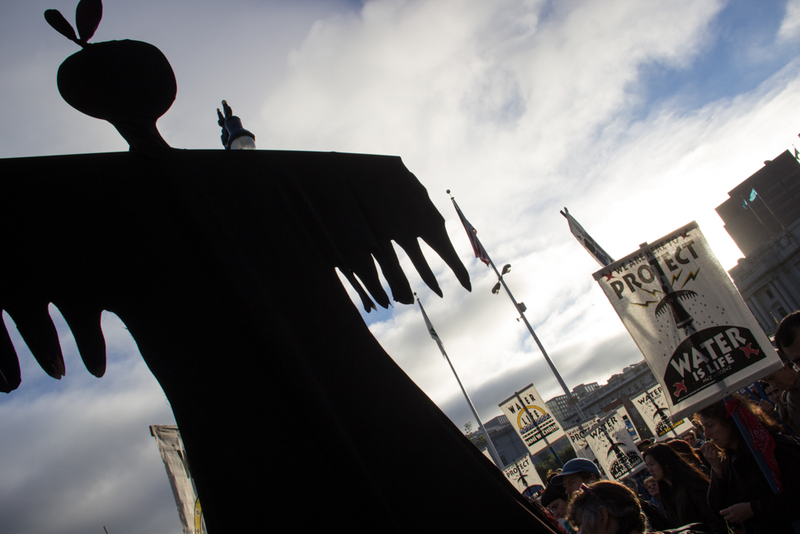 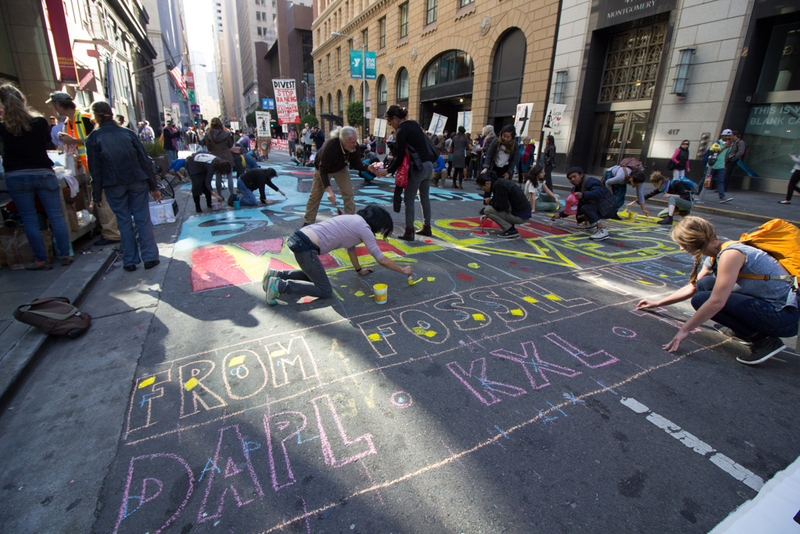 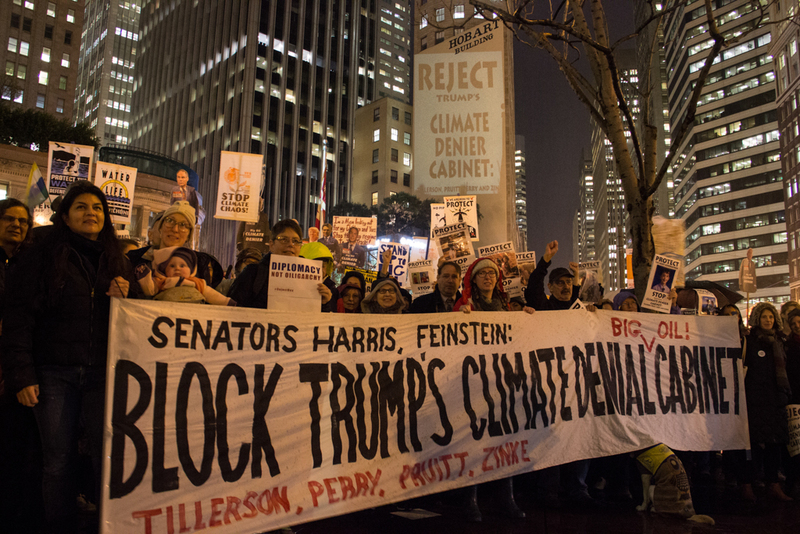 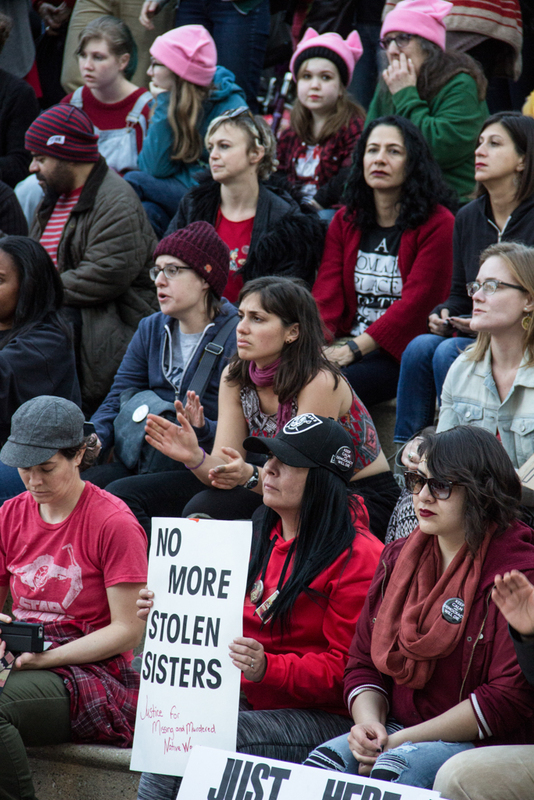 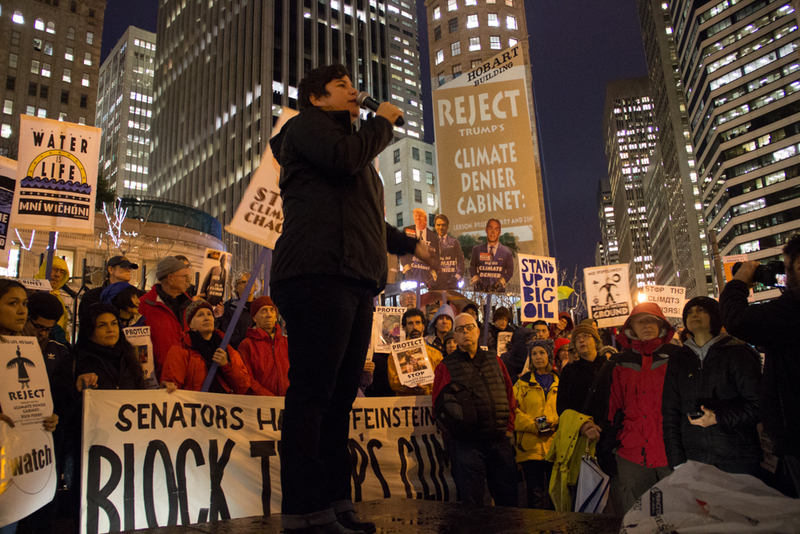 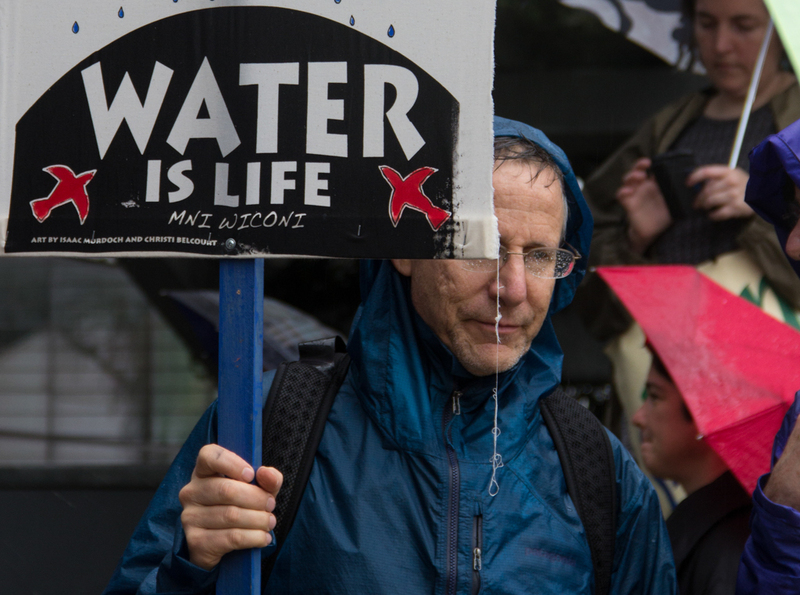 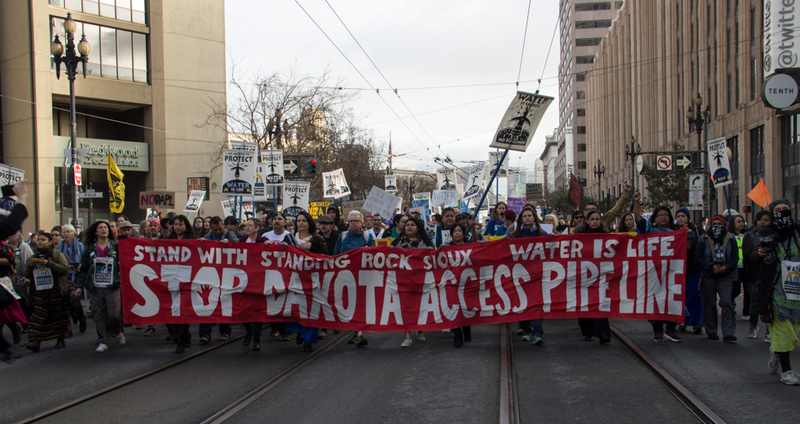 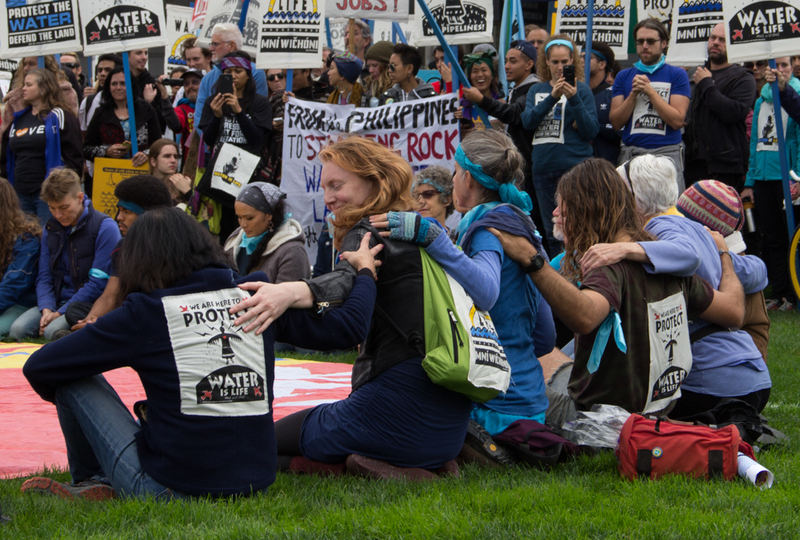 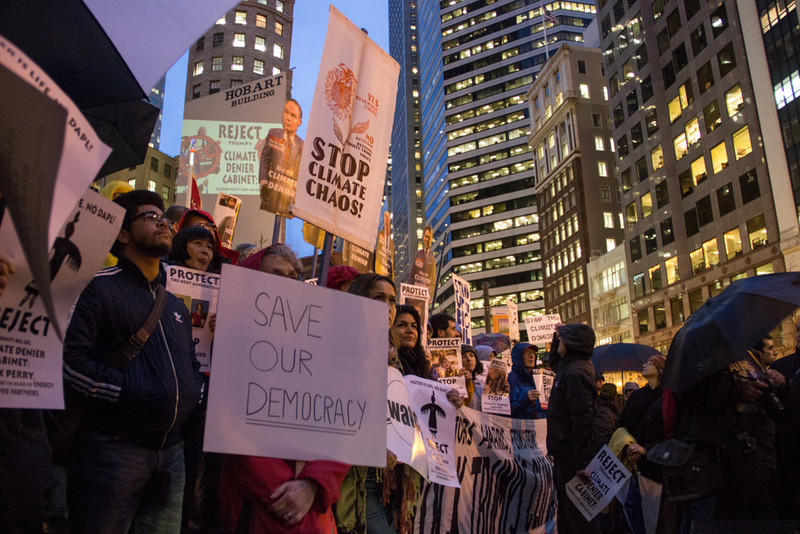 The protest in San Francisco was one of over 200 actions across the country, calling for a stop to the construction of the Dakota Access Pipeline and for the protection of water, sacred sites and the planet from the fossil fuel industry and it’s funders. 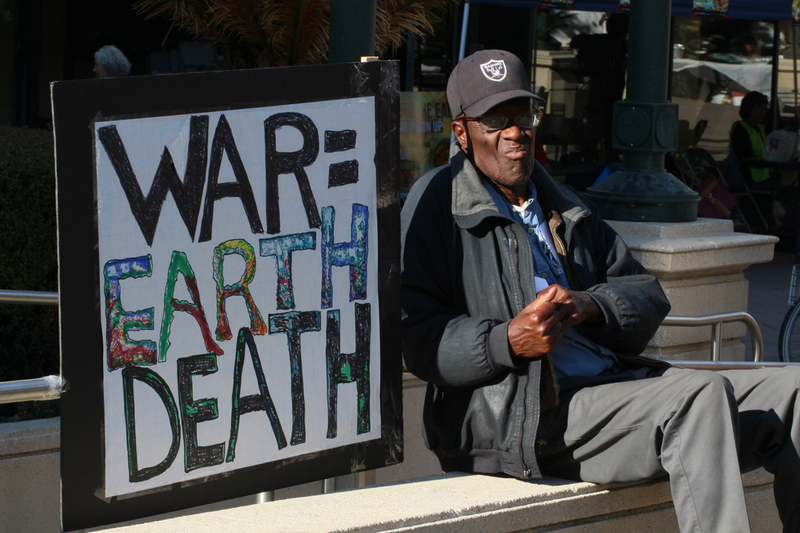 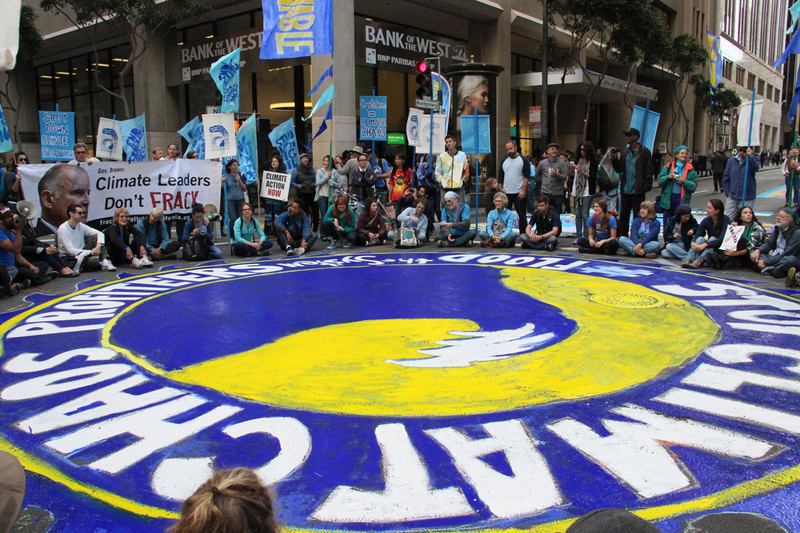 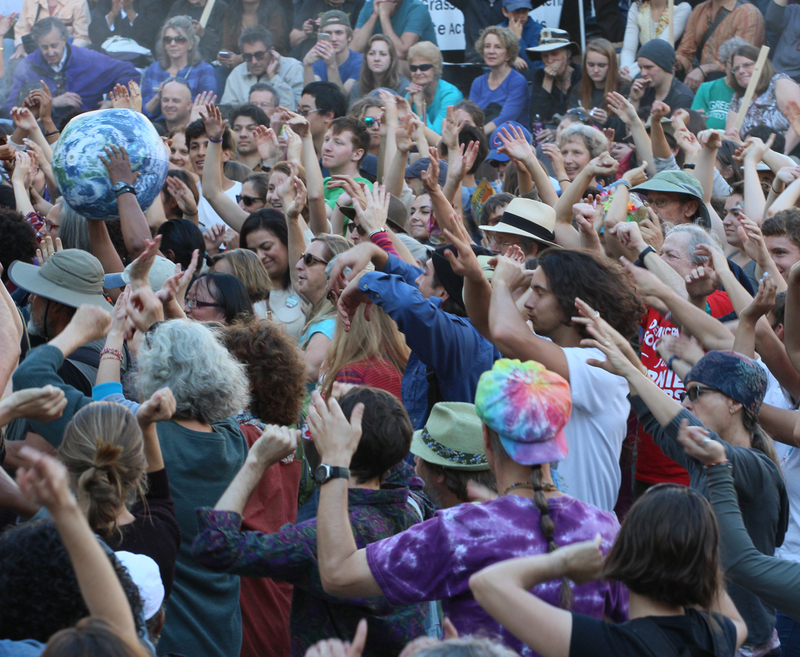 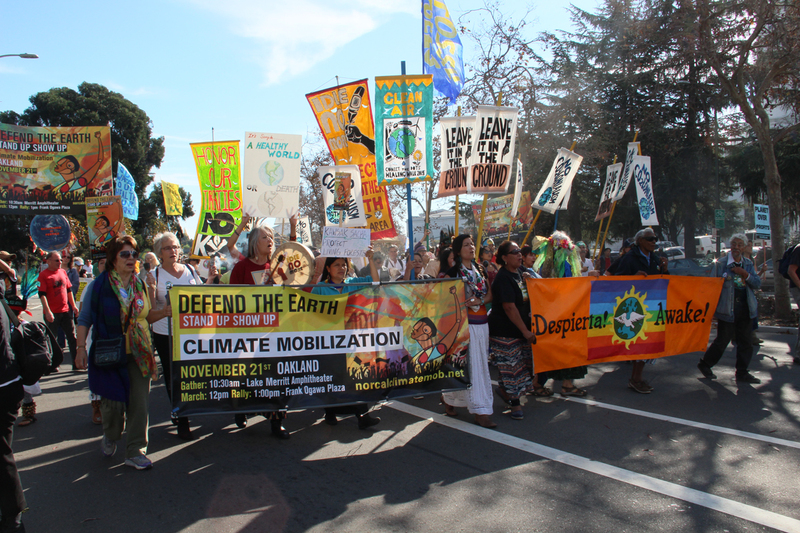 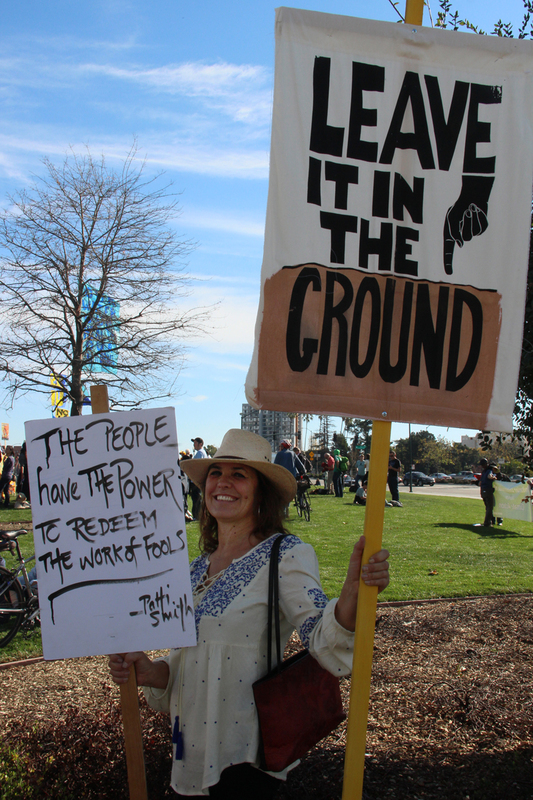 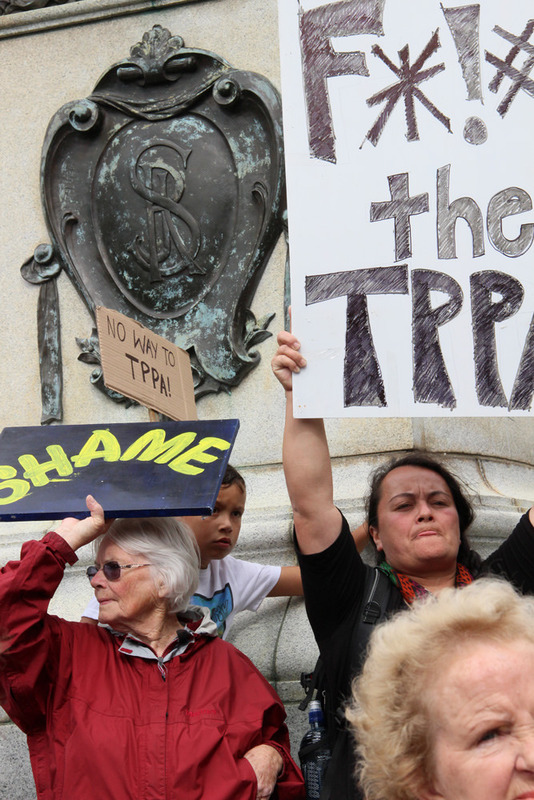 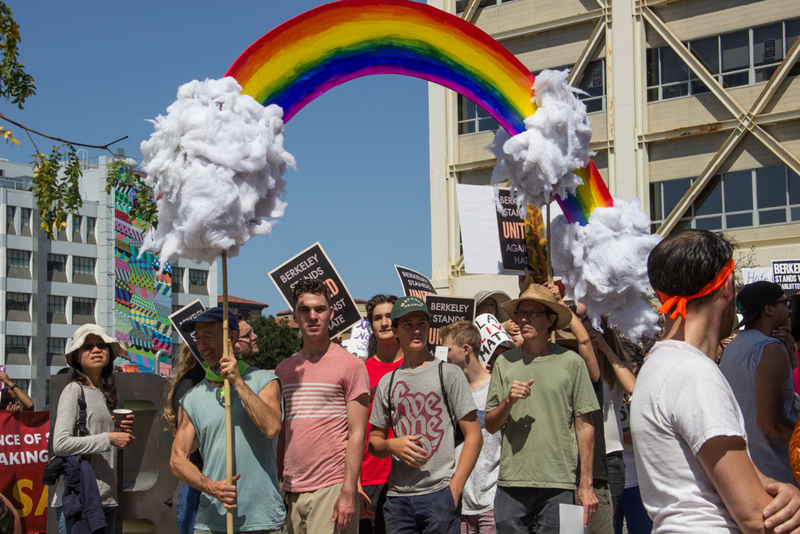 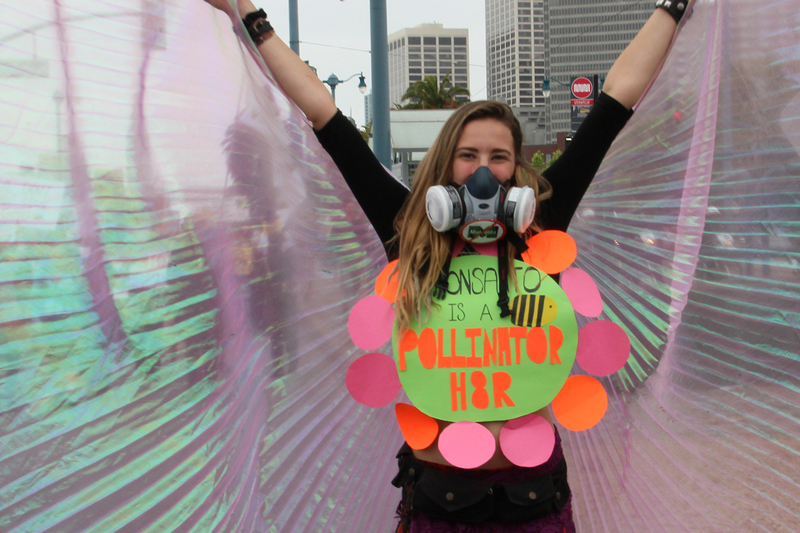 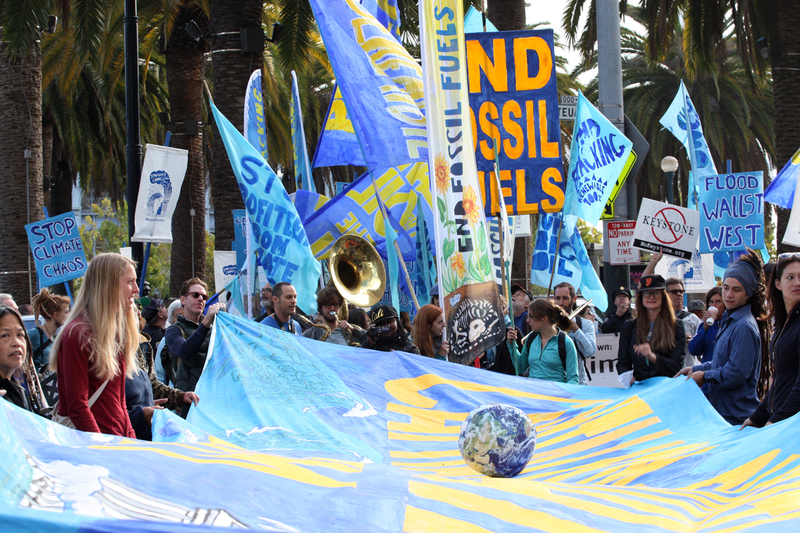 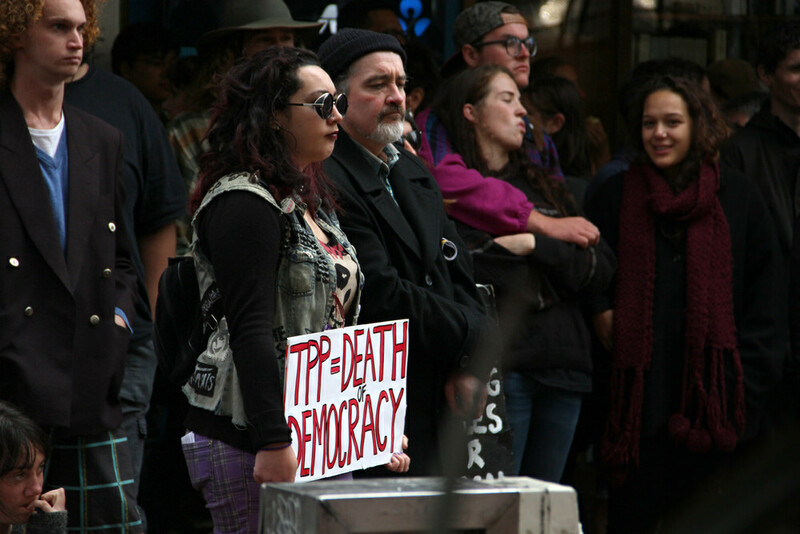 Thousands rally and march in the streets of Oakland, CA in the run-up to the United Nations Climate Change Negotiations in Paris – COP21. 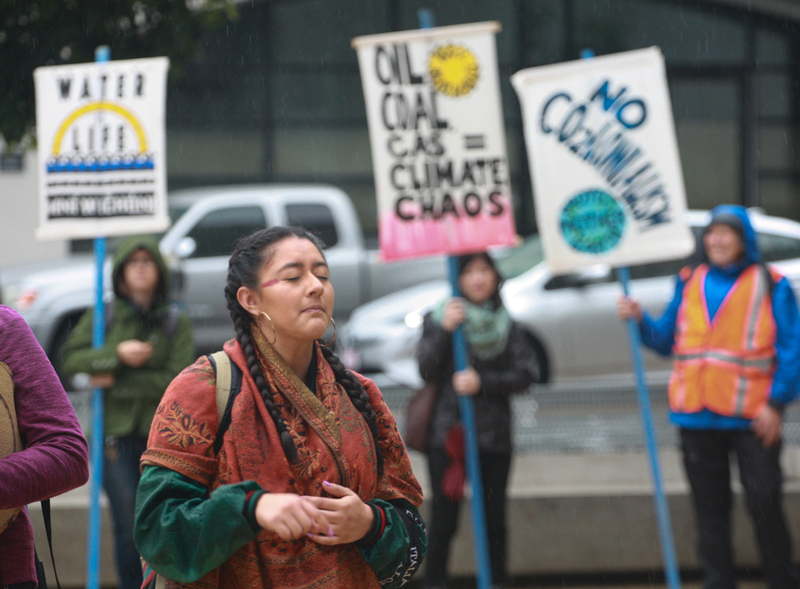 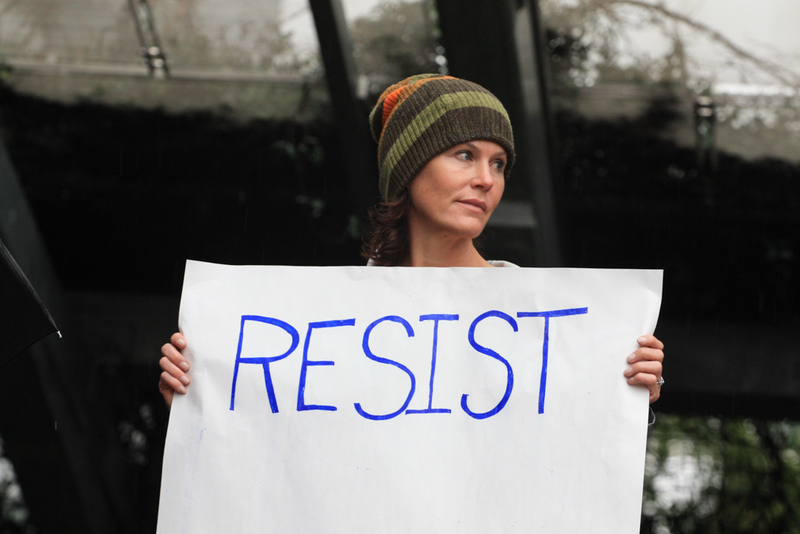 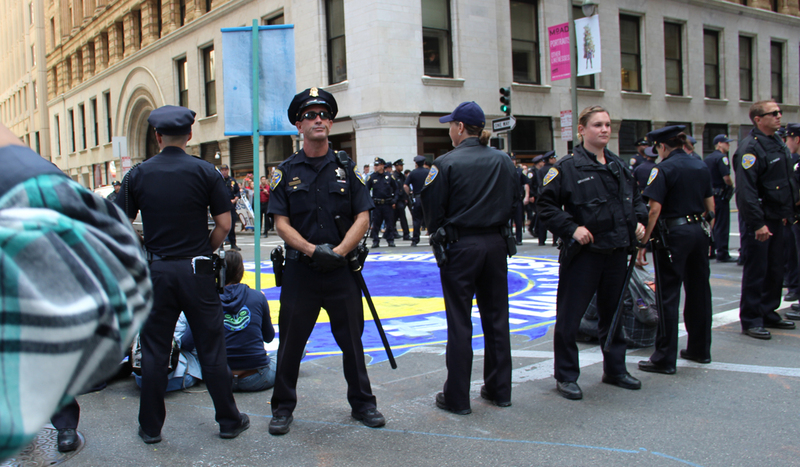 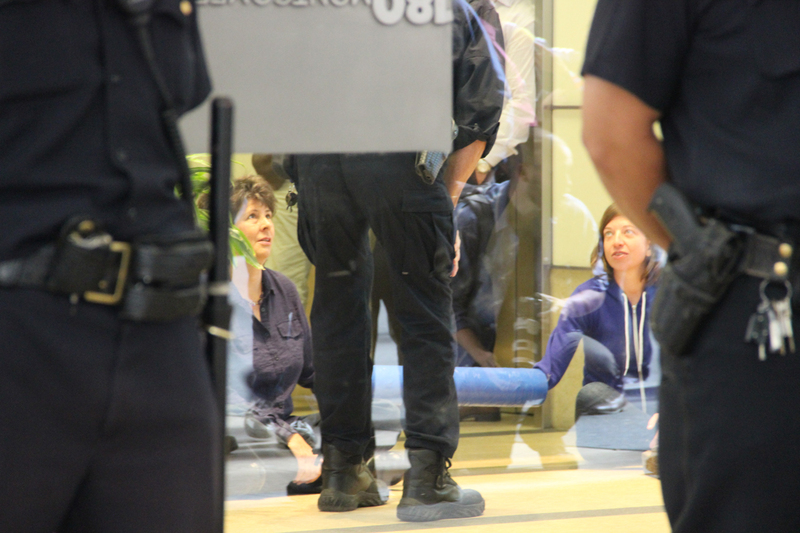 11 arrested as 200 protesters target those profiting from Climate Change. 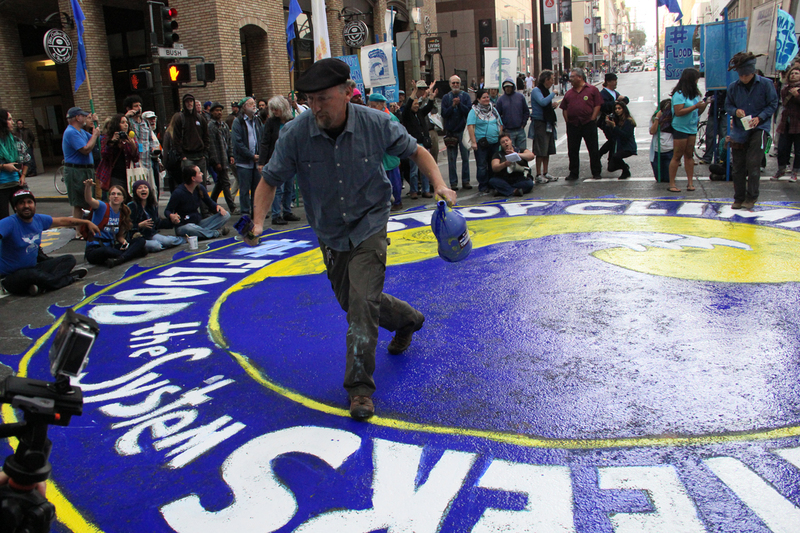 4 people lock together inside the entrance to Bank of the West headquarters, while dozens outside paint a mural in the blocked intersection. 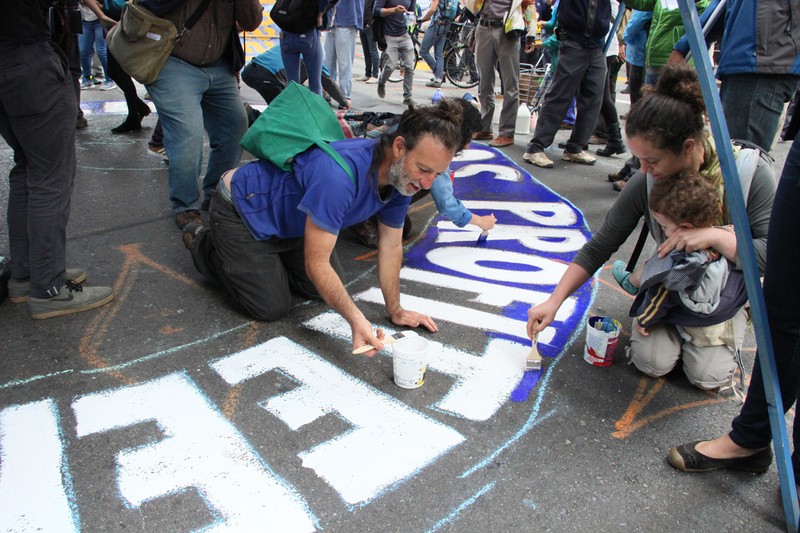 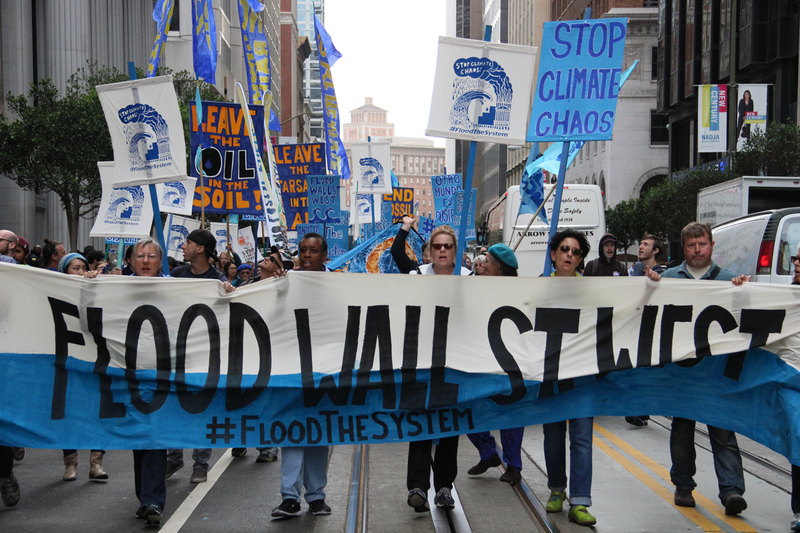 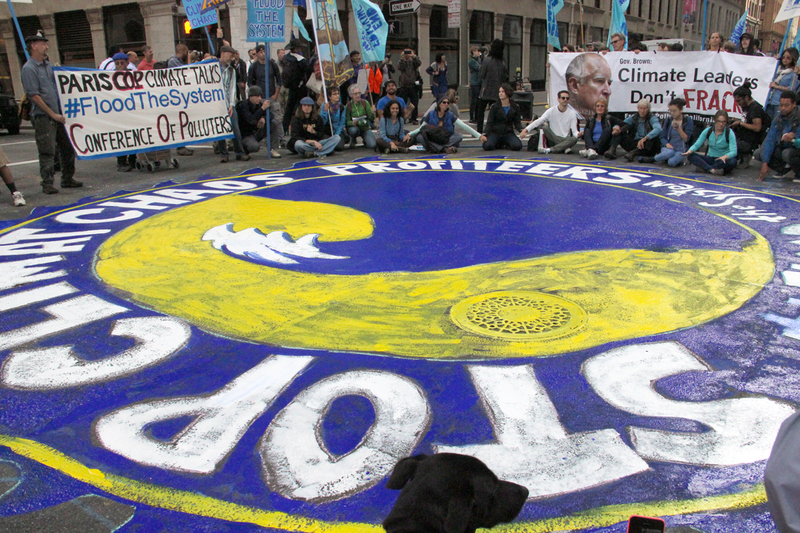 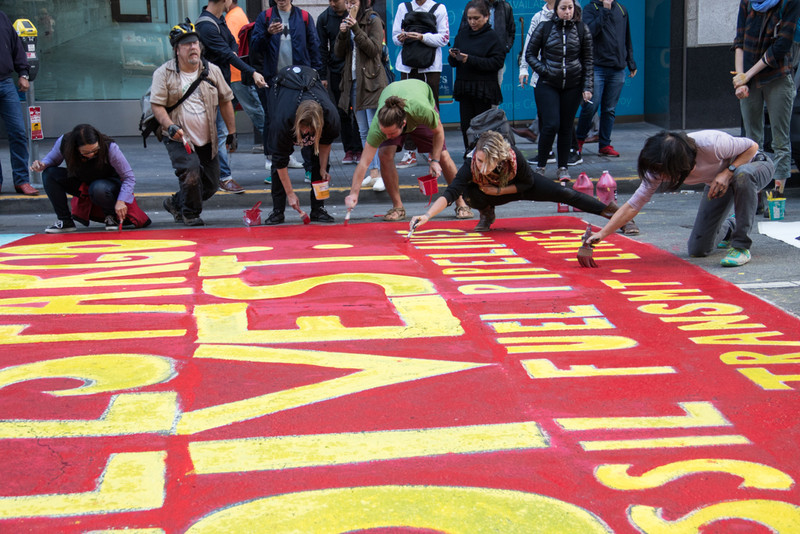 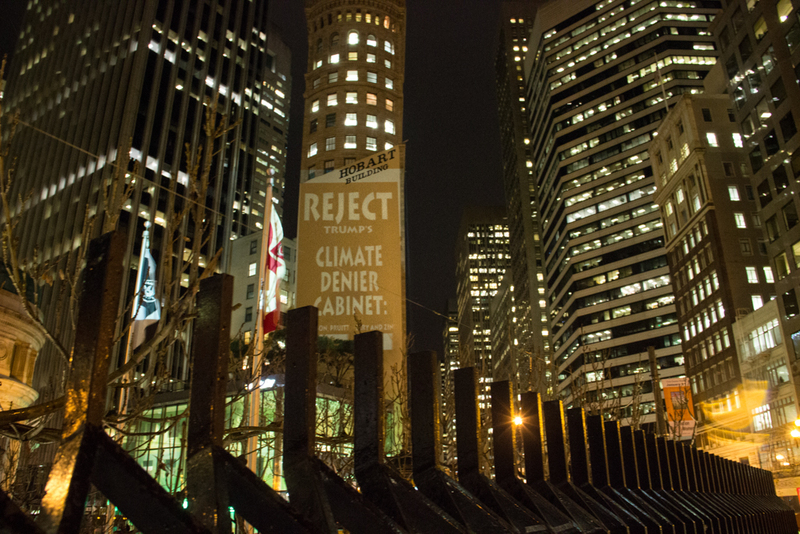 The mural reads: “Stop Climate Chaos Profiteers #FloodTheSystem”. 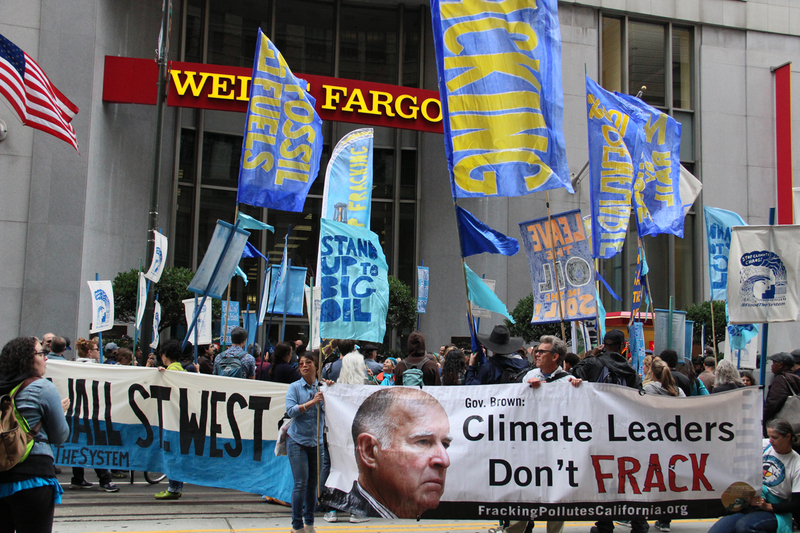 Bank of the West is a subsidiary of BNP Paribas which is the French banking sector’s top financier of the coal industry. 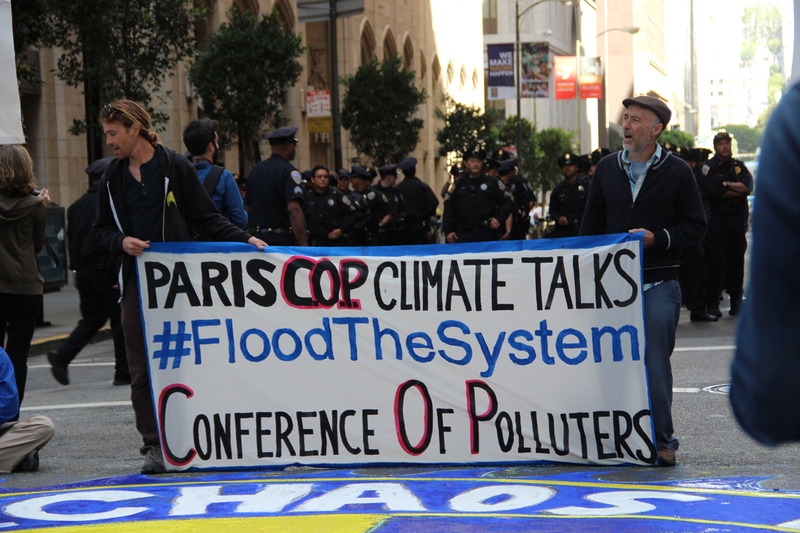 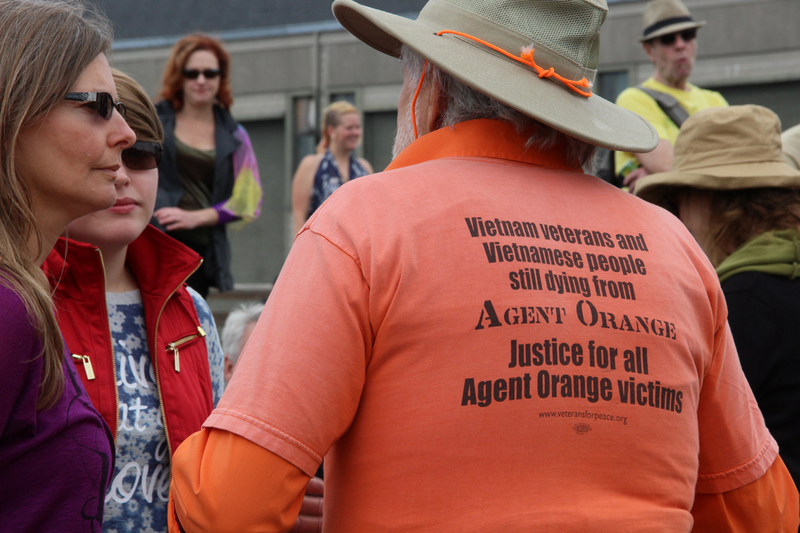 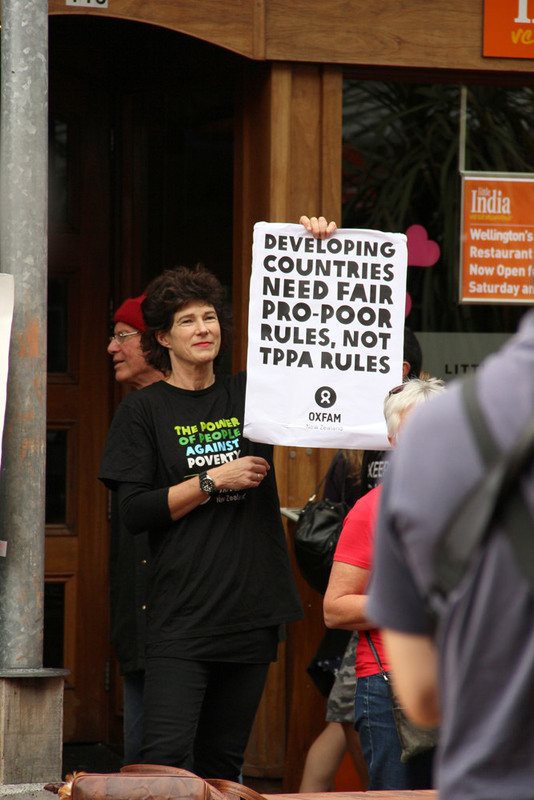 It is also one of the corporate sponsors of the United Nations climate summit (COP21) in Paris. 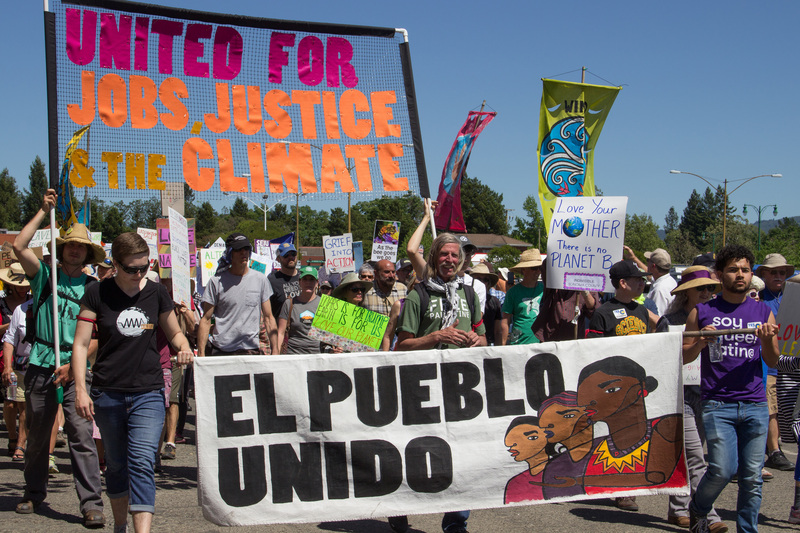 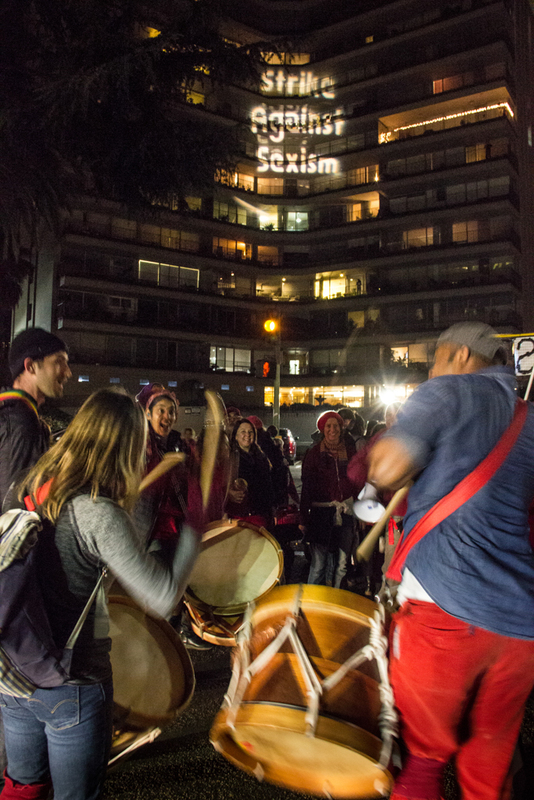 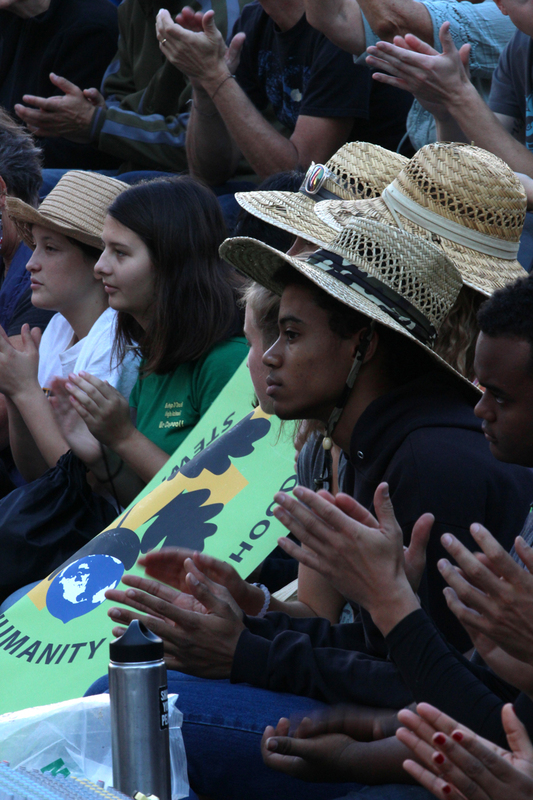 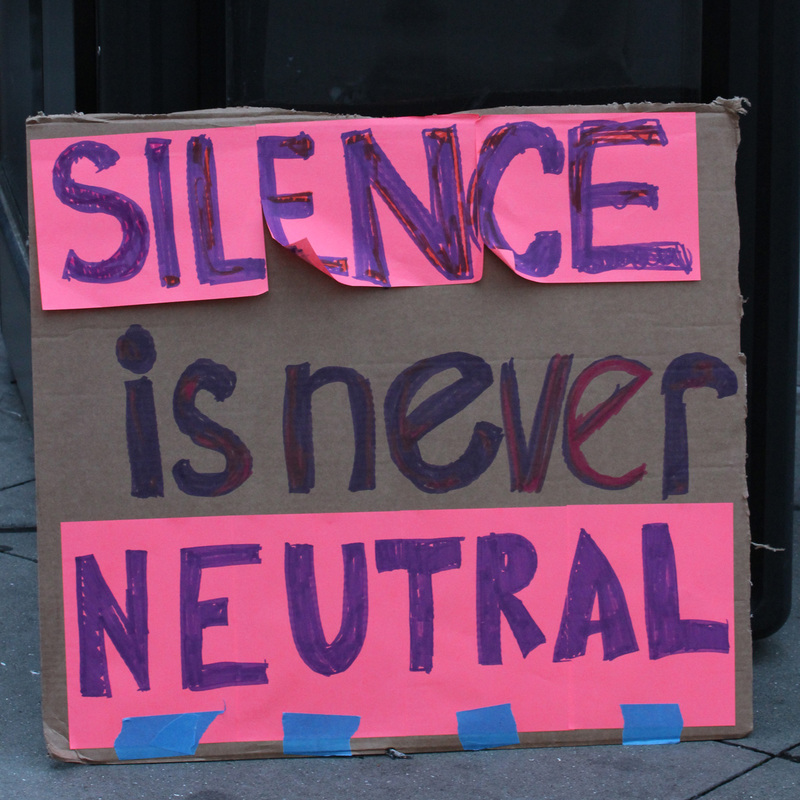 In the lead up to COP21 and beyond, actions are planned around the globe that call out the pressing need for people and communities EVERYWHERE to challenge the systems that are changing the climate and exist through oppression. 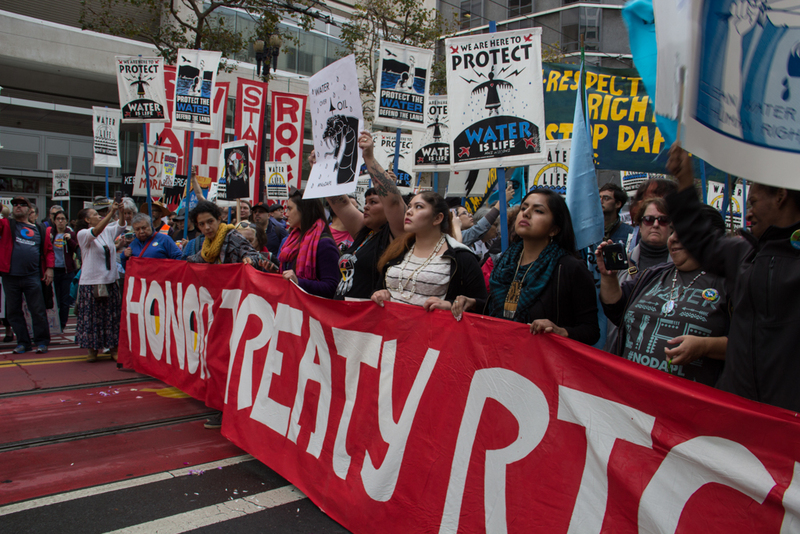 To depend on the United Nations process would likely be a tragic mistake. 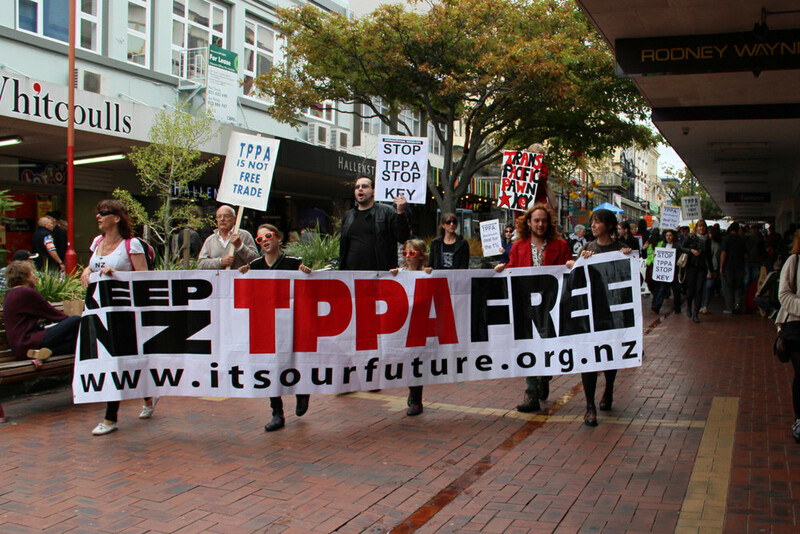 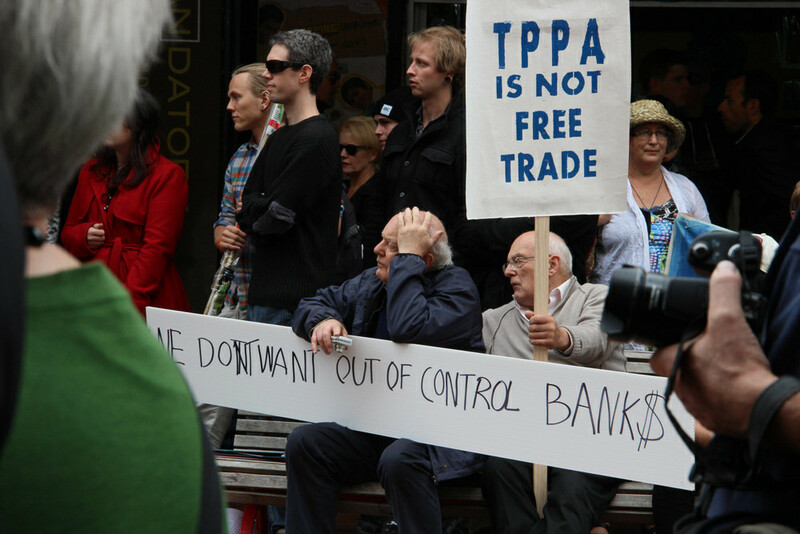 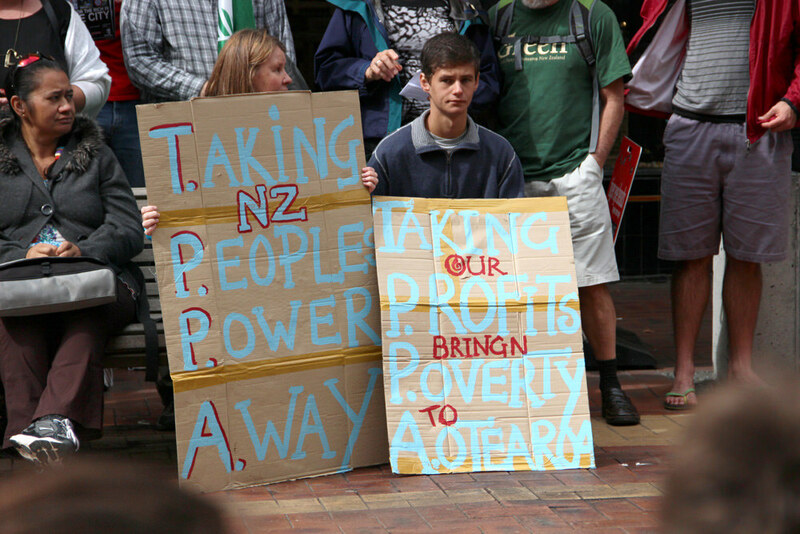 Wellington, New Zealand. 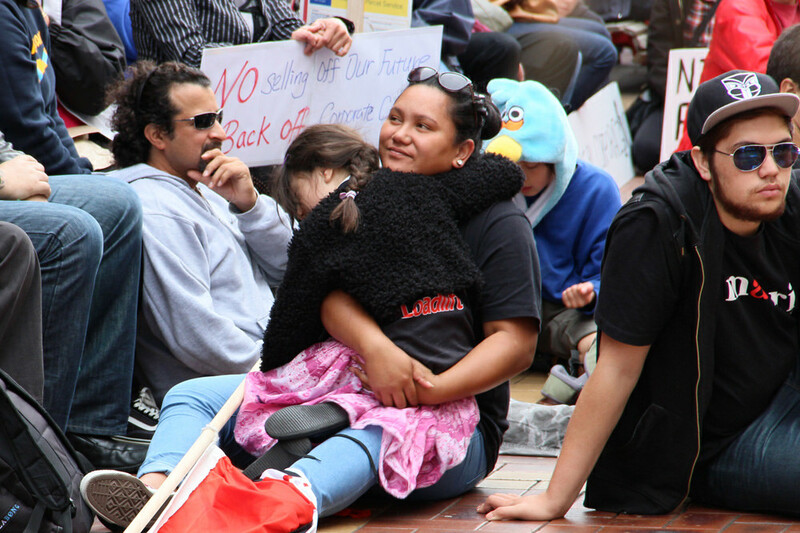 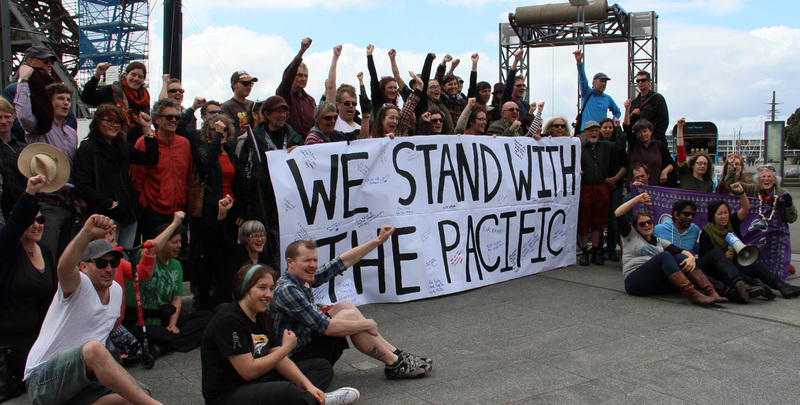 Solidarity rally for the Pacific Climate Warriors and their floating blockade of the Newcastle, Australia coal port. 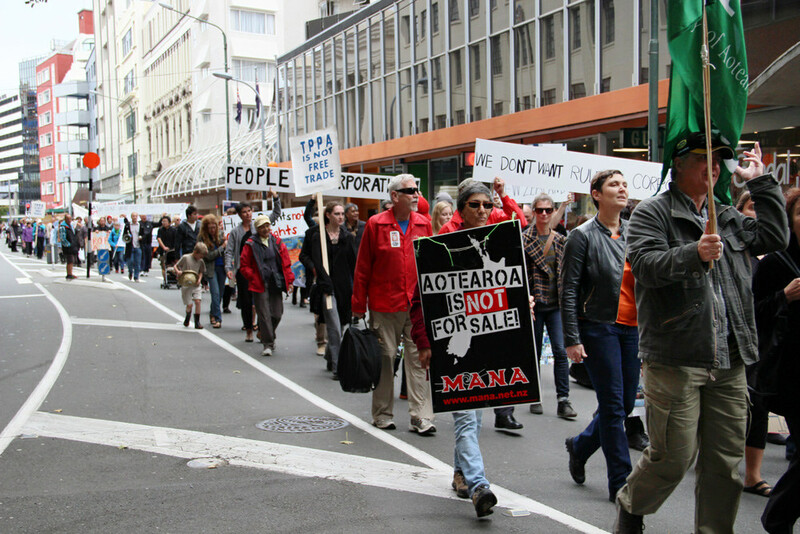 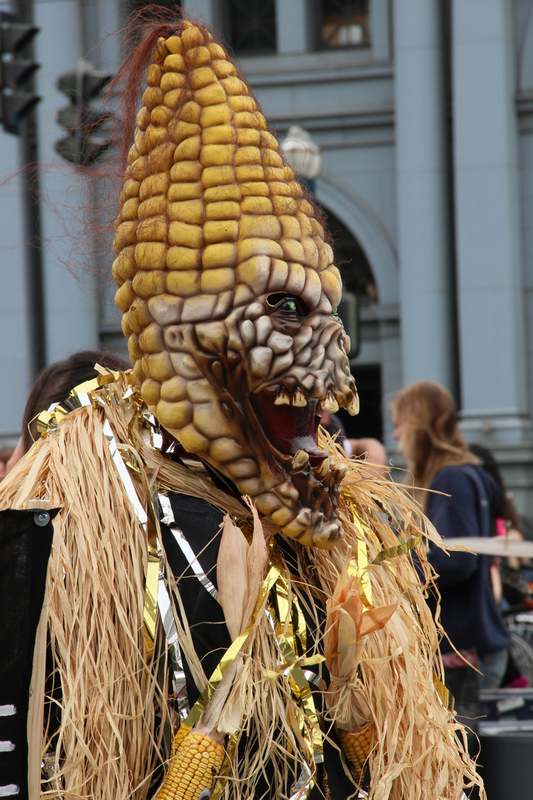 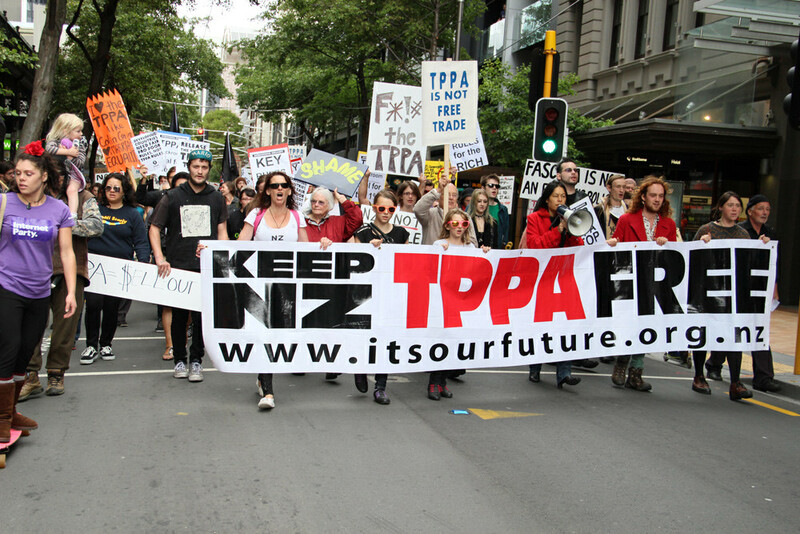 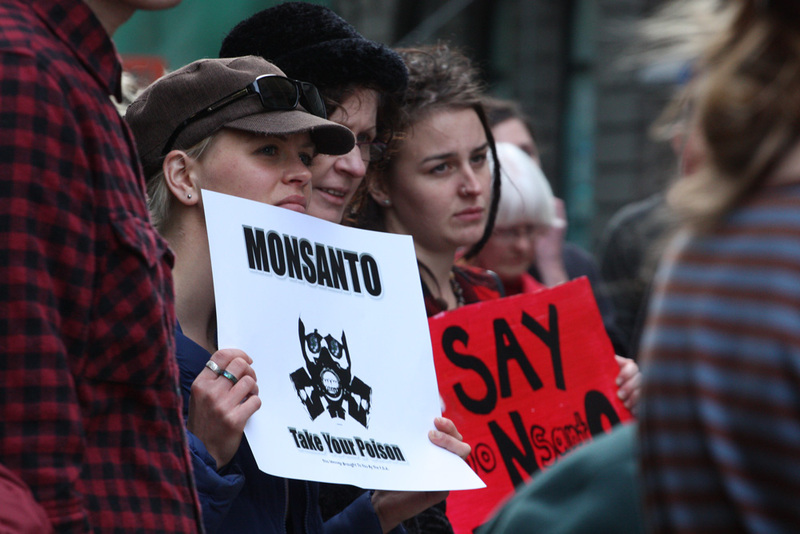 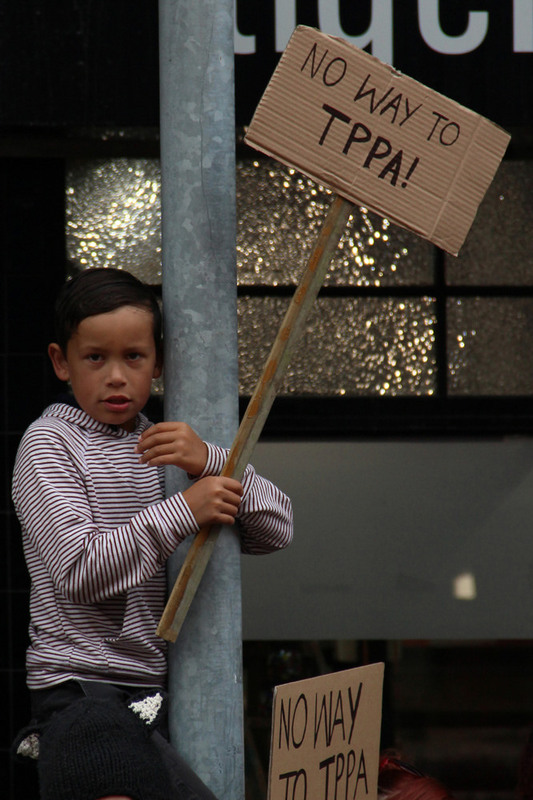 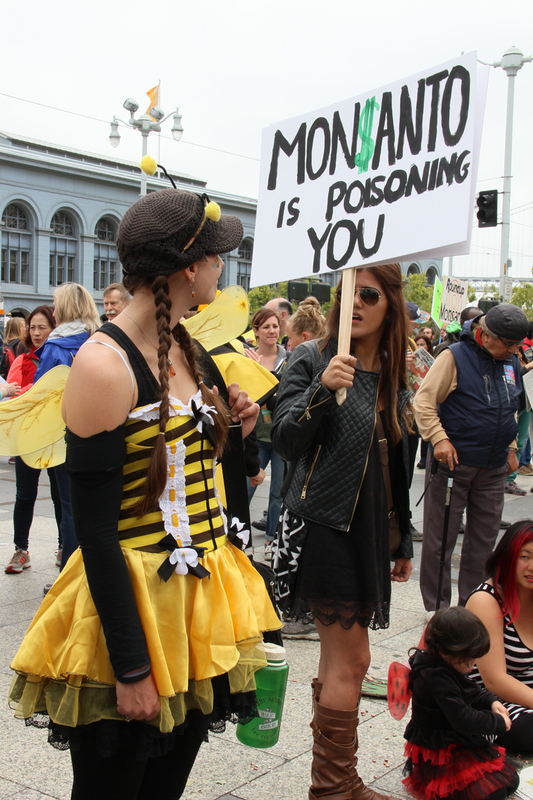 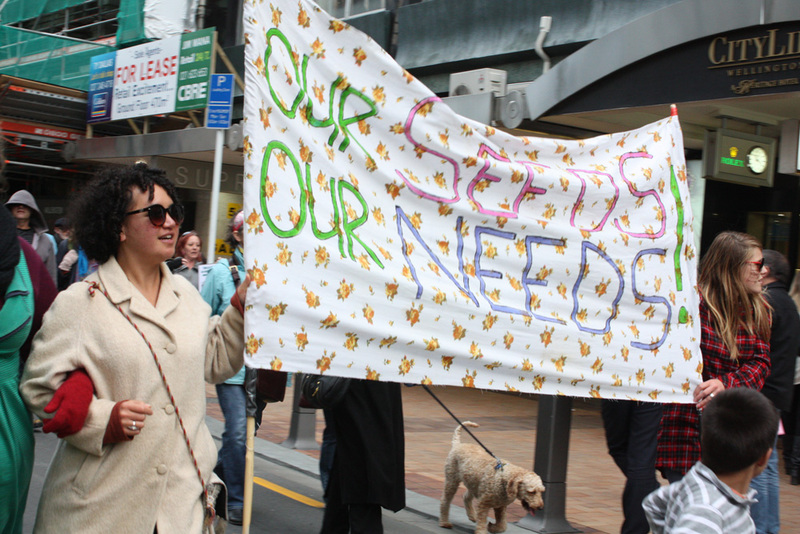 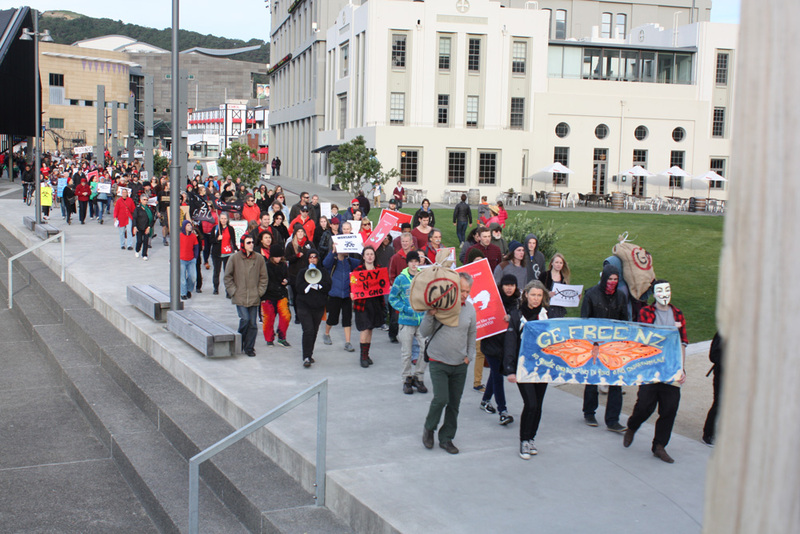 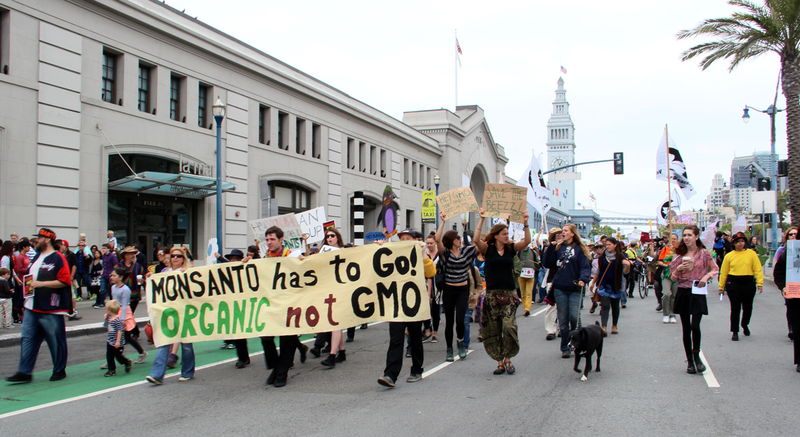 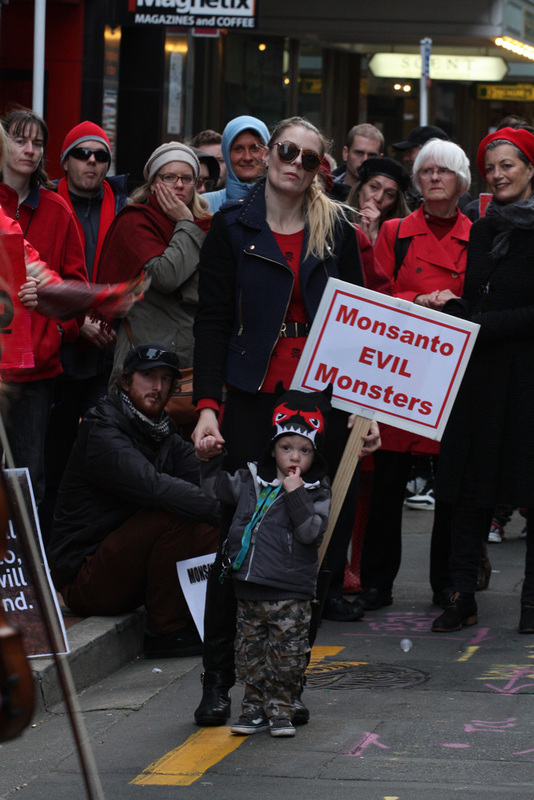 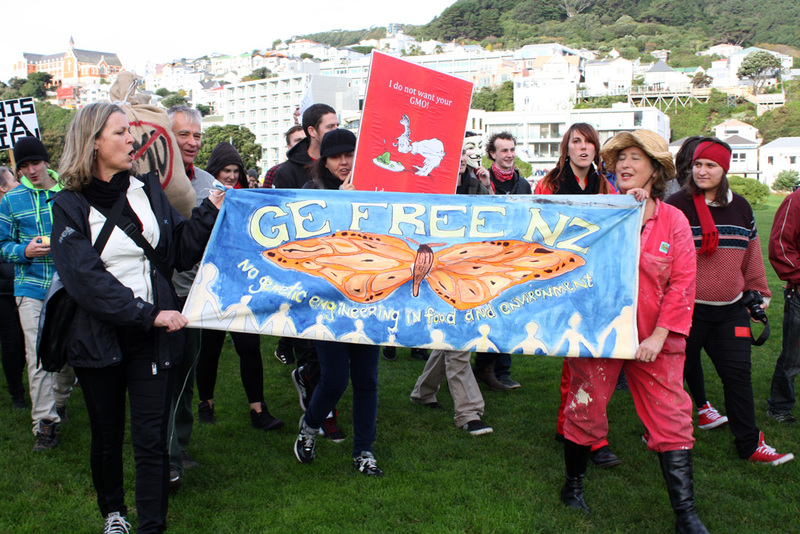 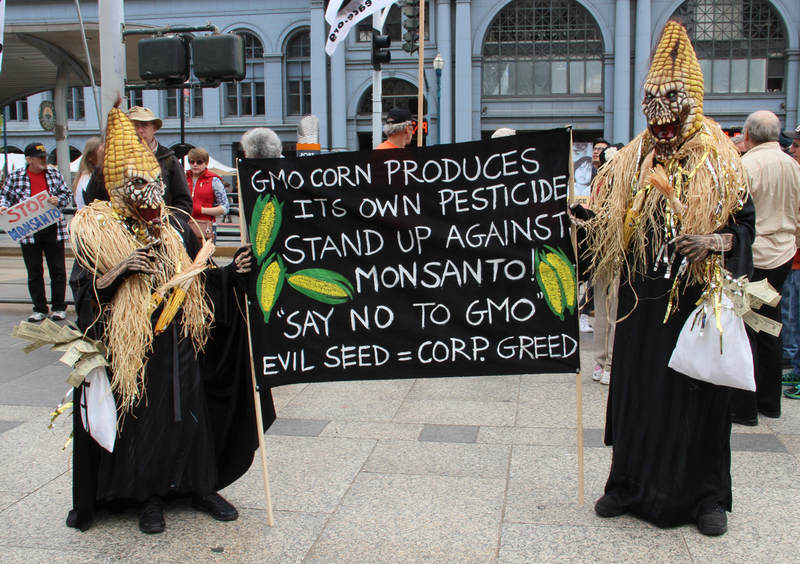 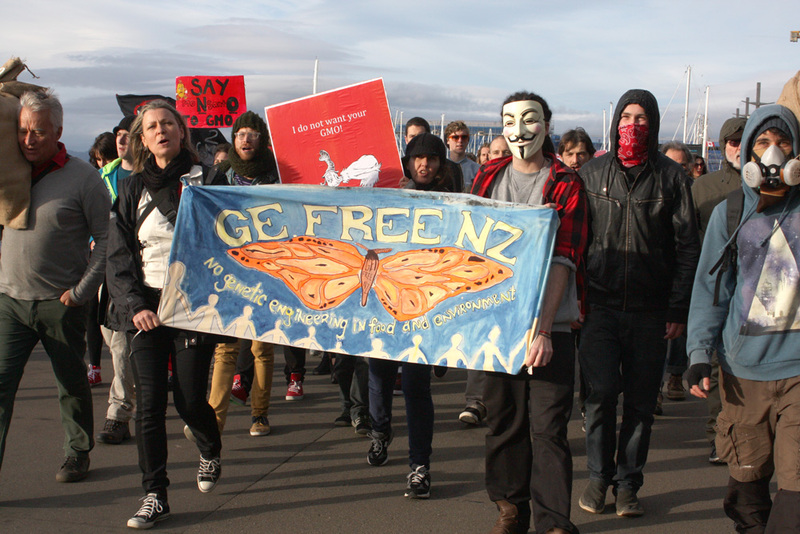 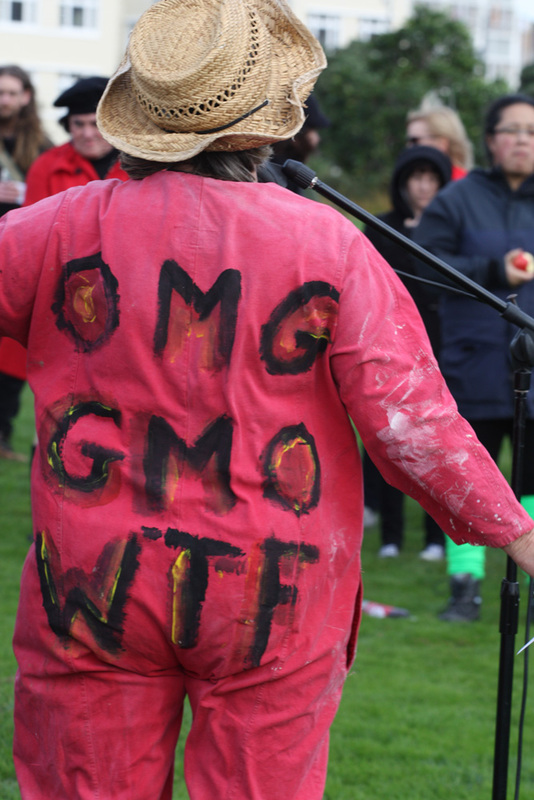 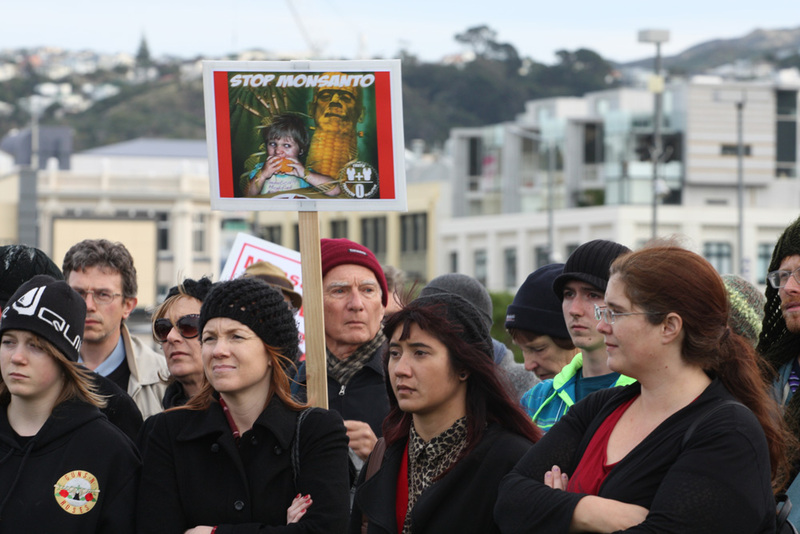 New Zealand kicks off a world wide day of marches against Monsanto and the genetic modification and poisoning of our foods and planet.